Some distance away the Buda Hills and the TV tower on the Hármashatár Mountain are also visible. 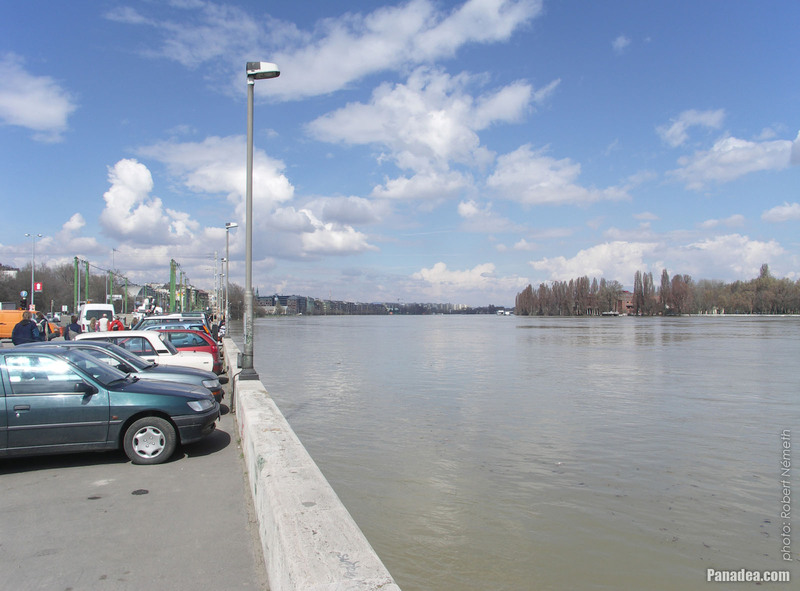 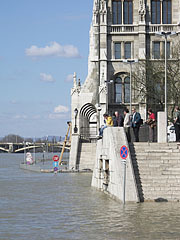 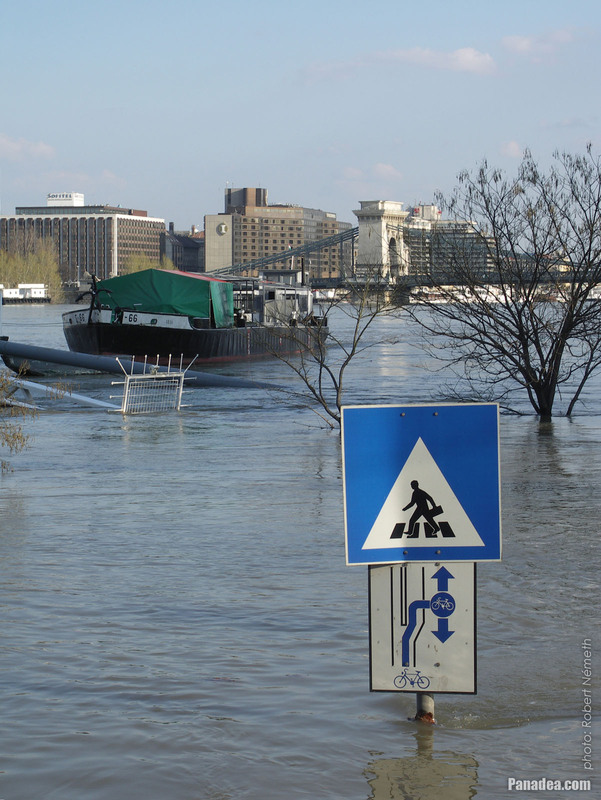 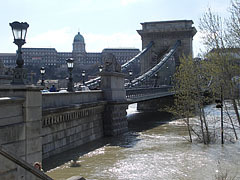 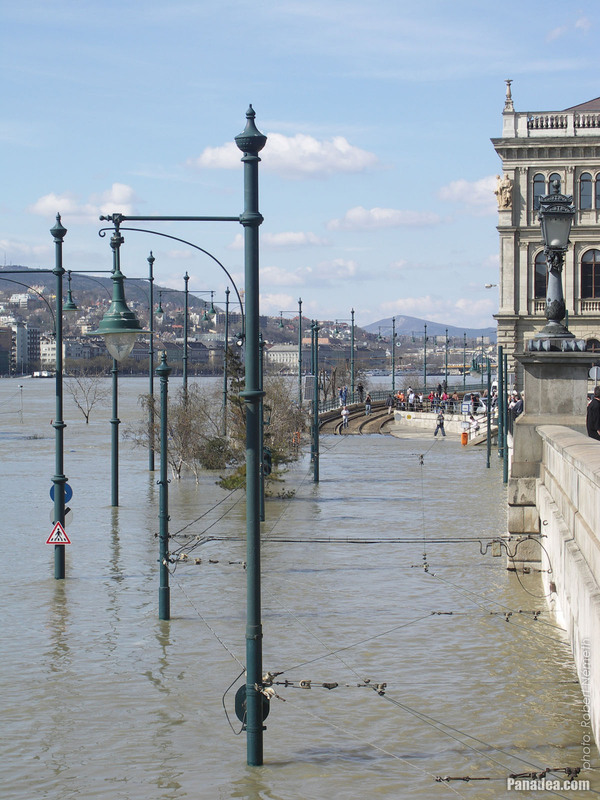 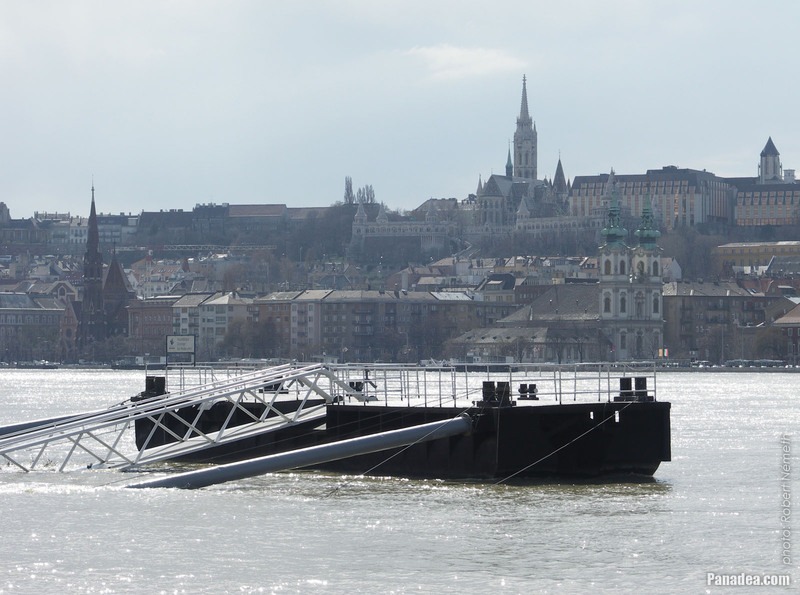 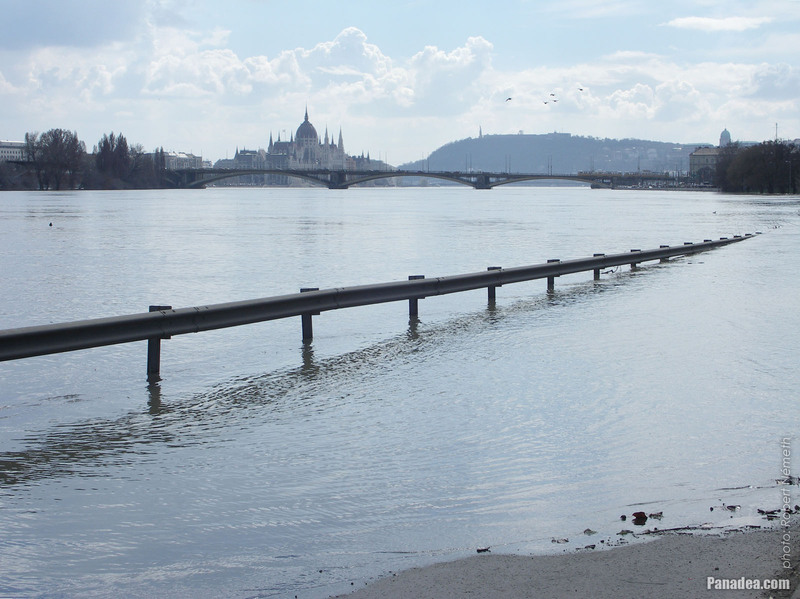 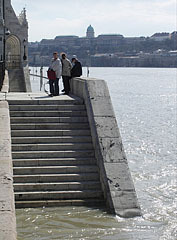 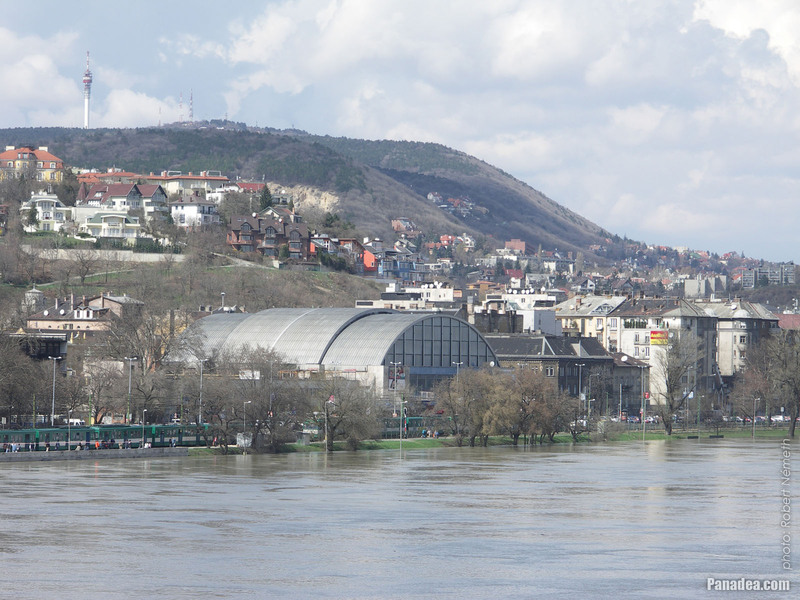 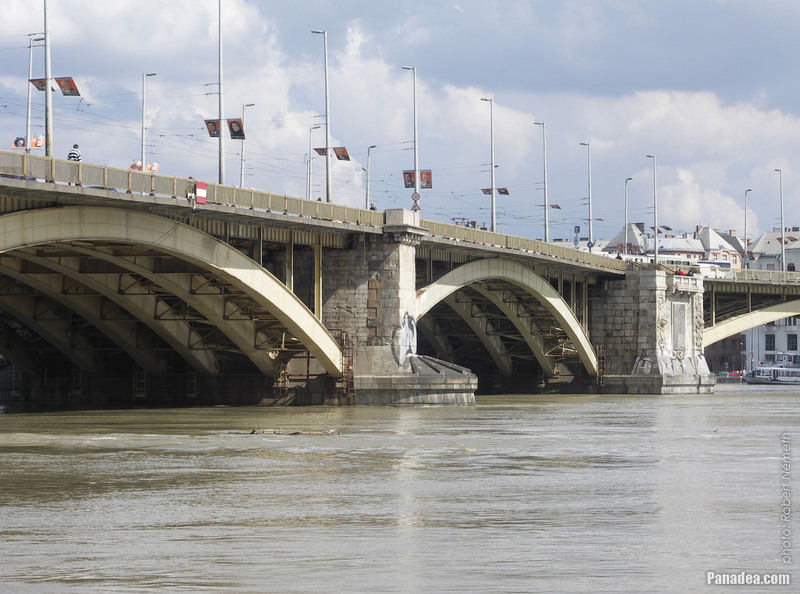 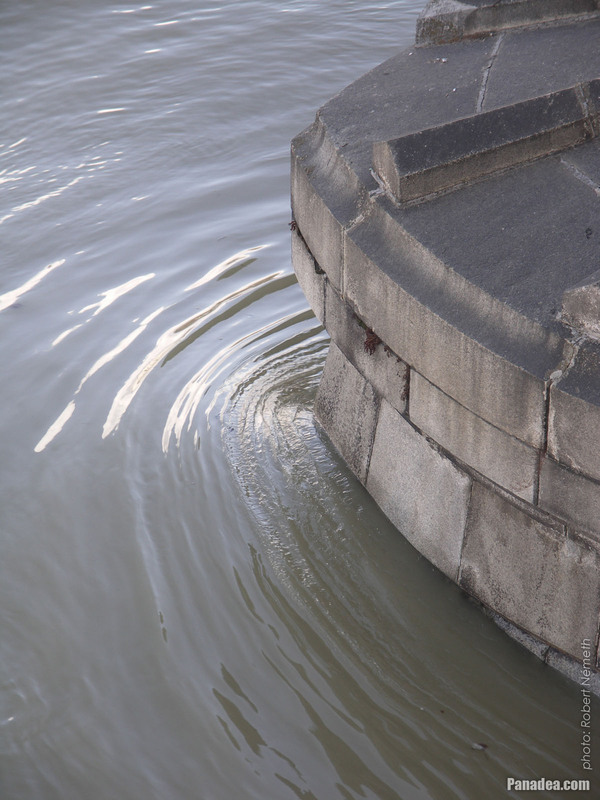 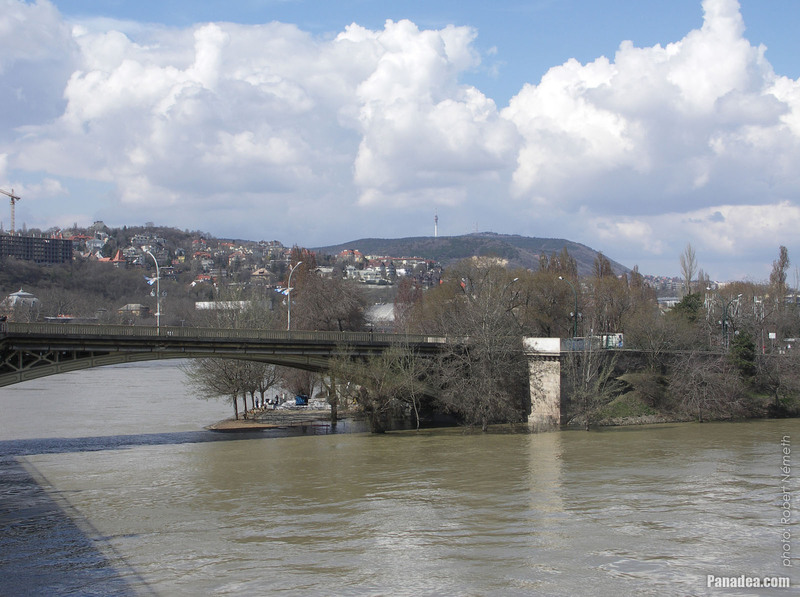 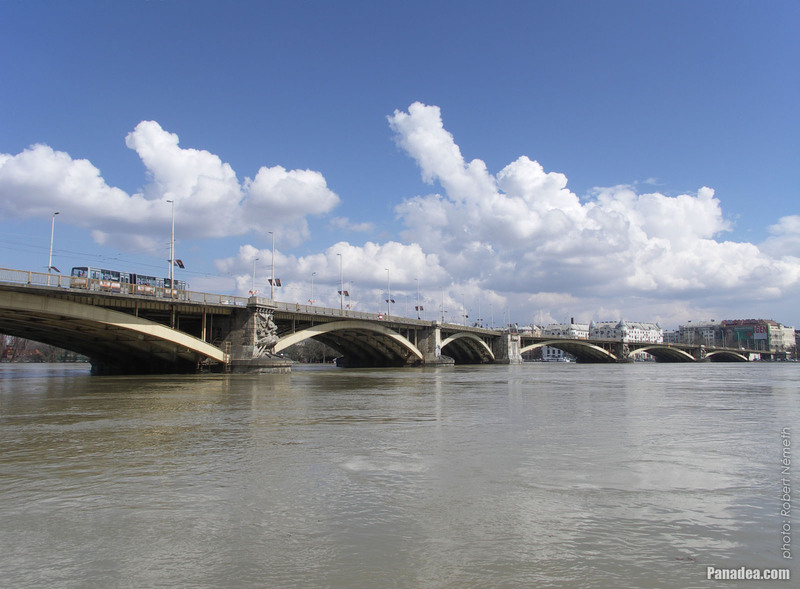 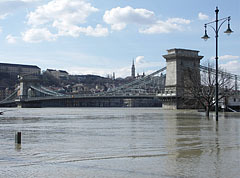 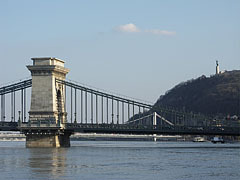 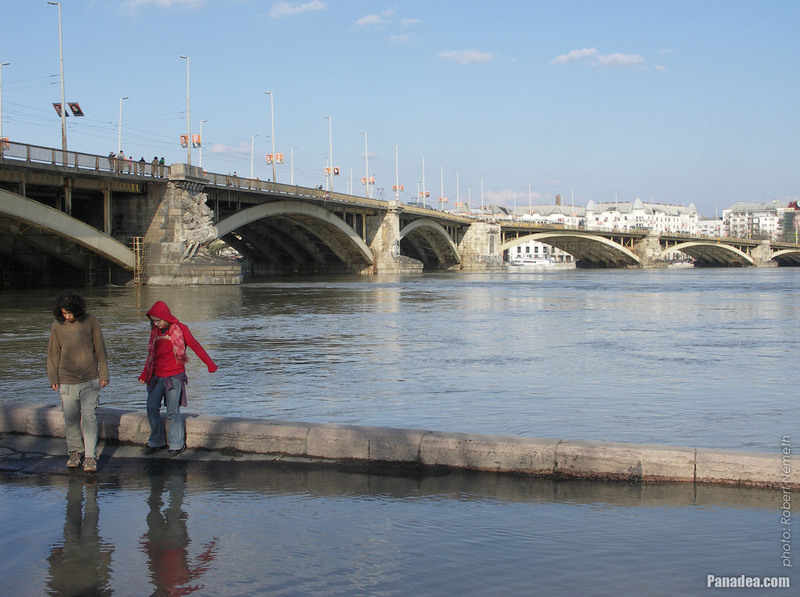 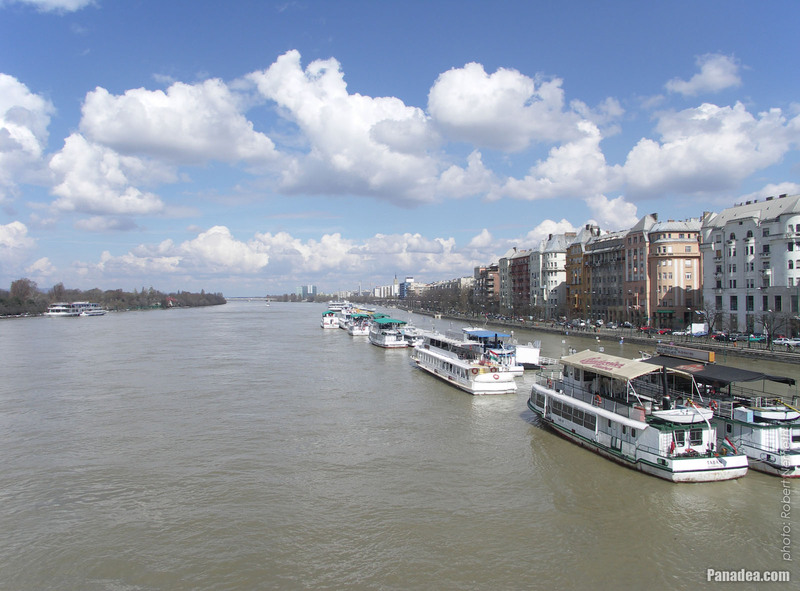 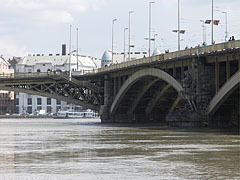 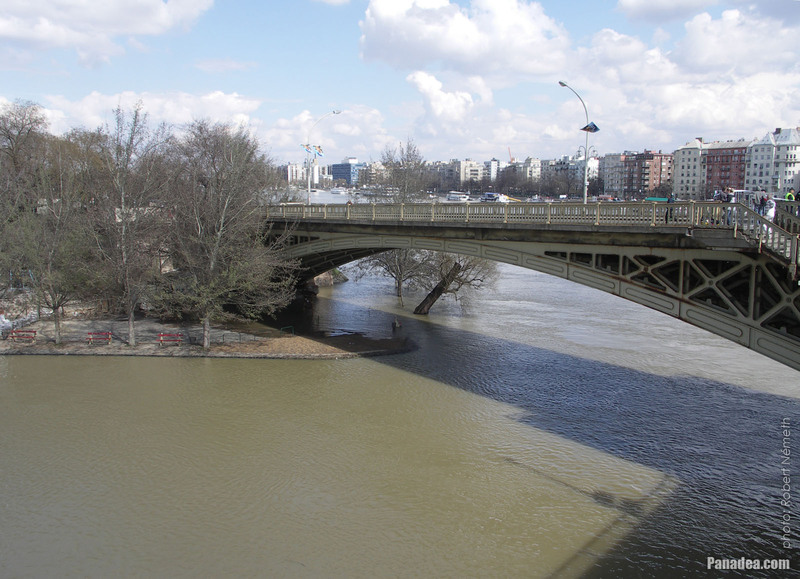 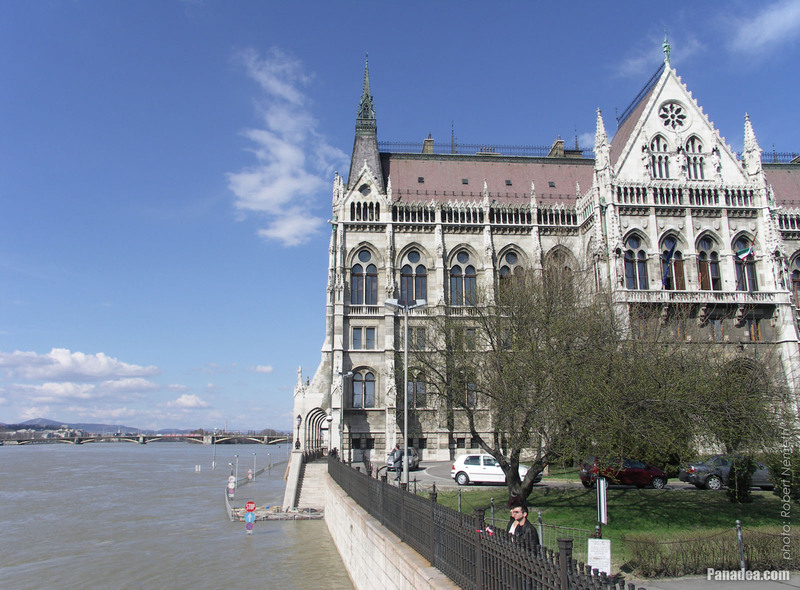 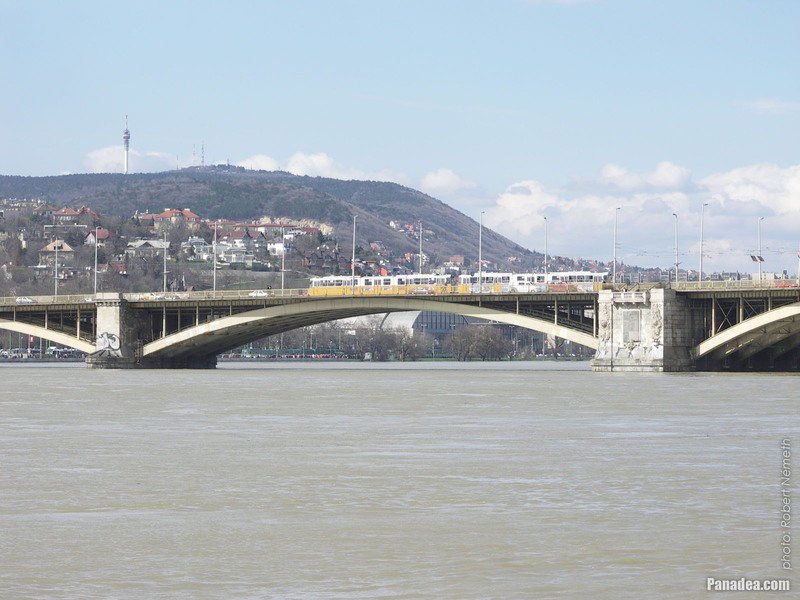 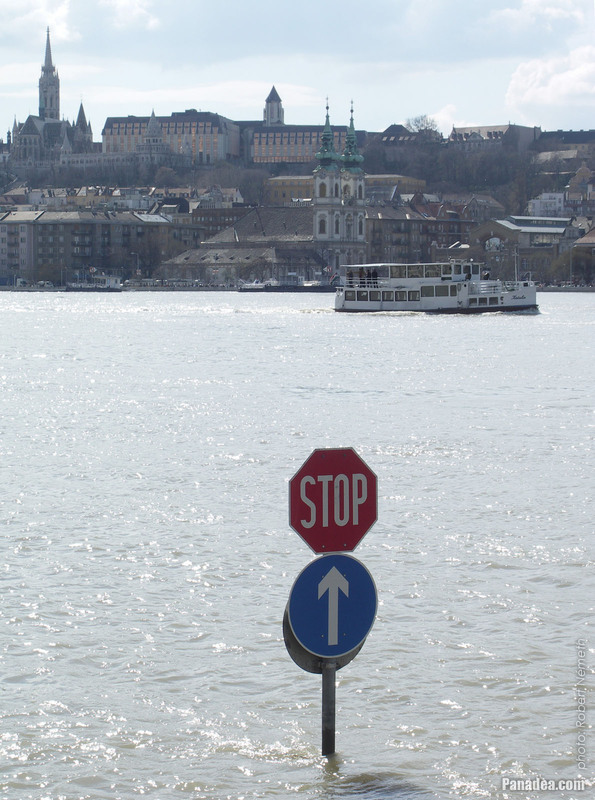 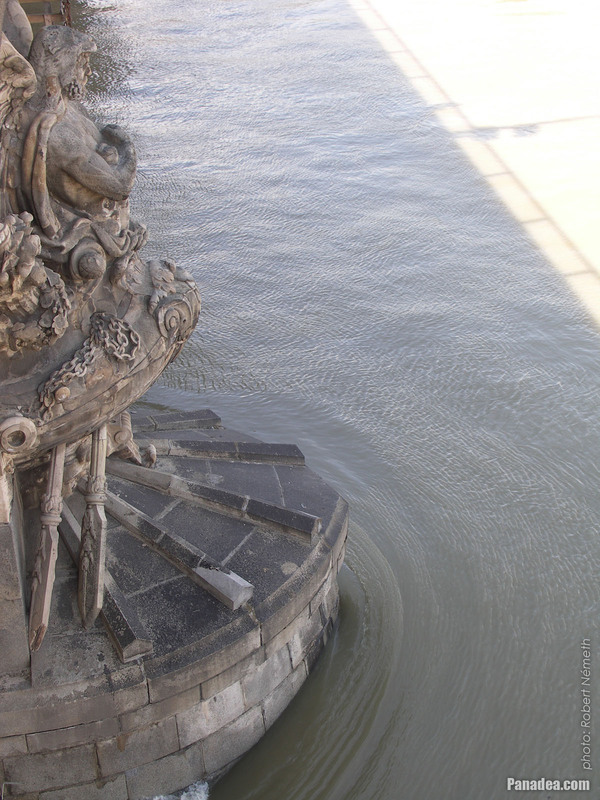 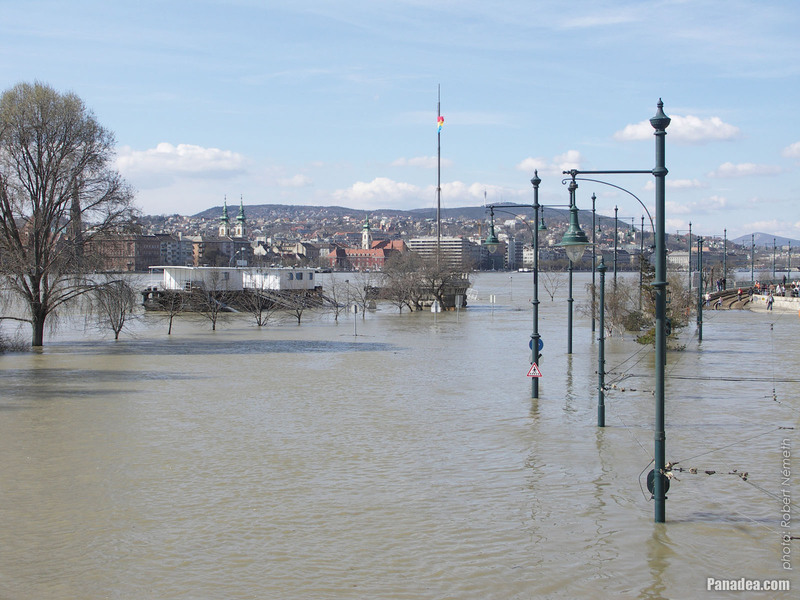 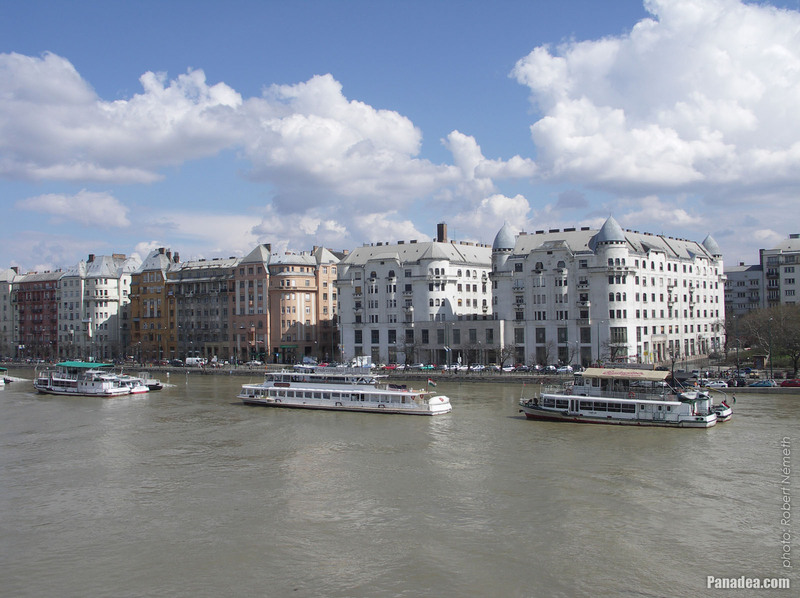 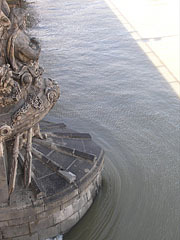 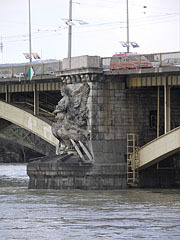 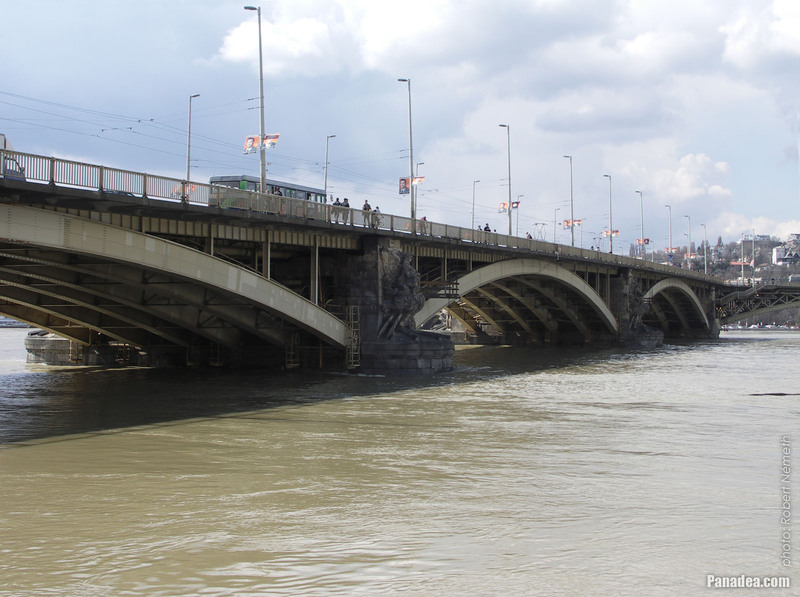 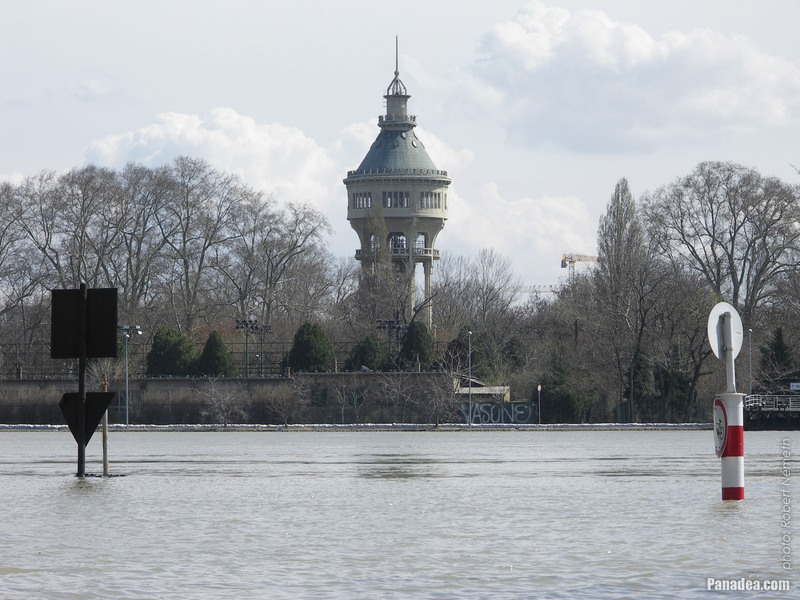 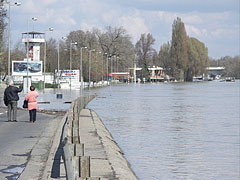 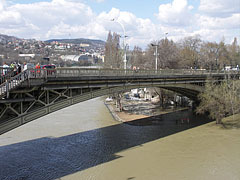 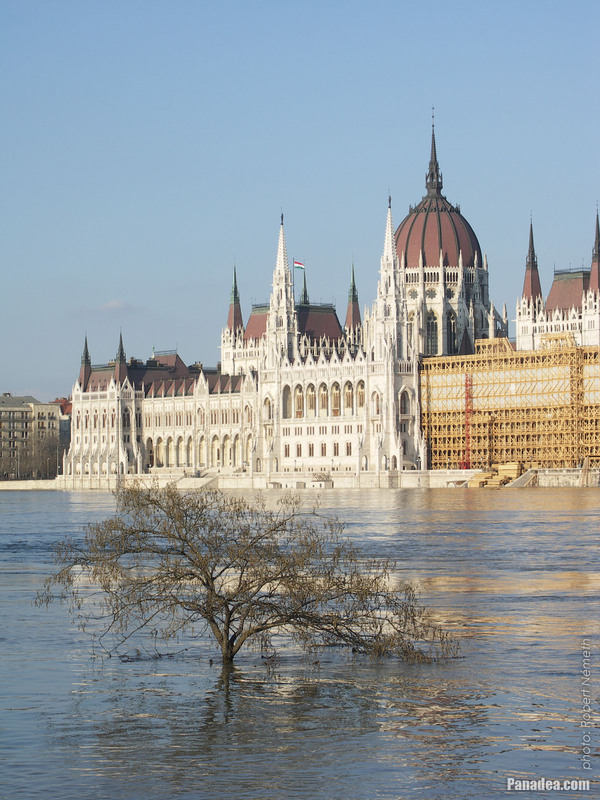 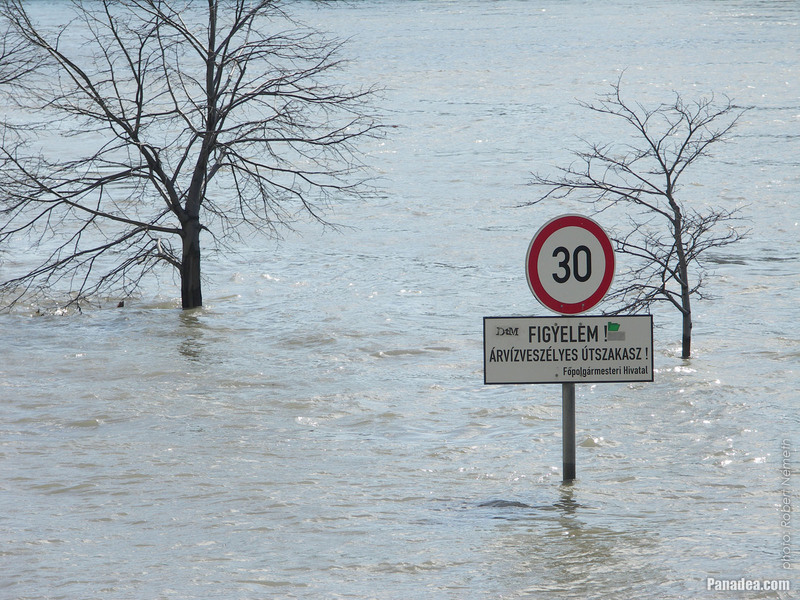 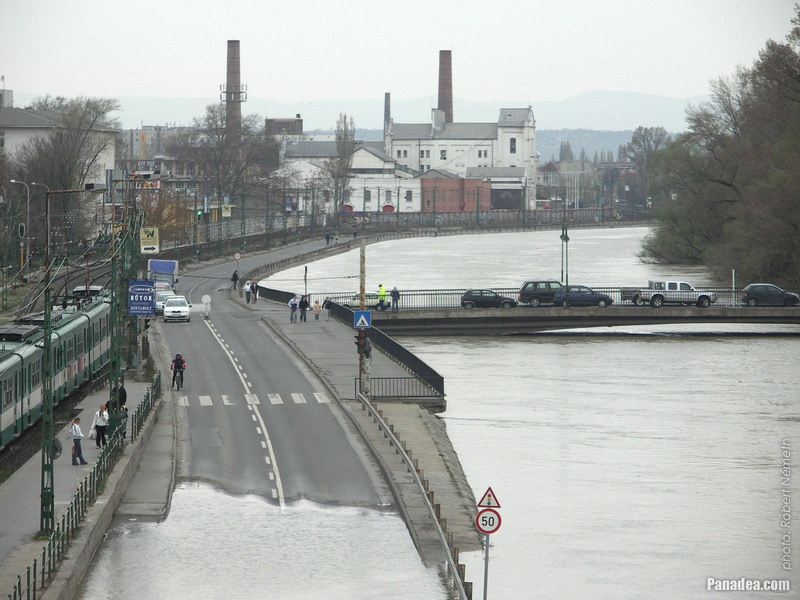 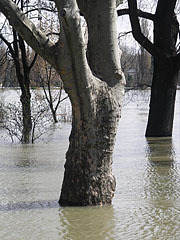 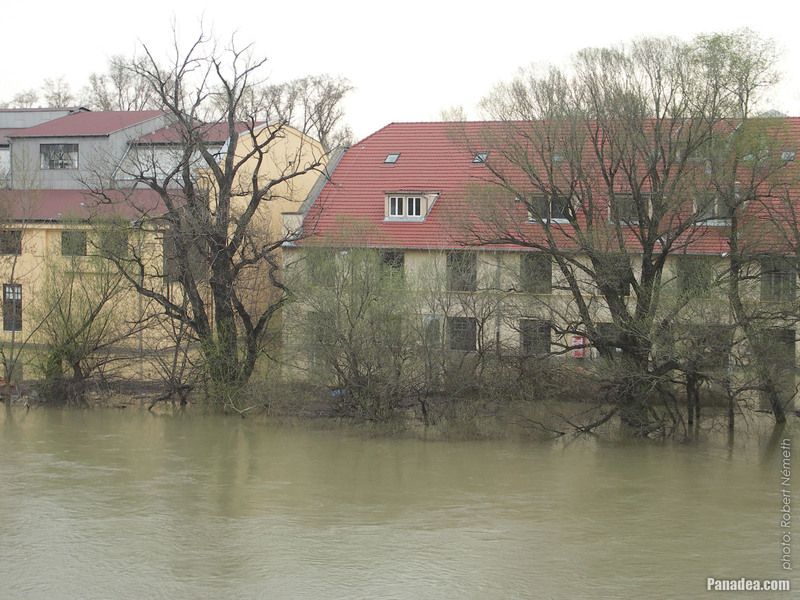 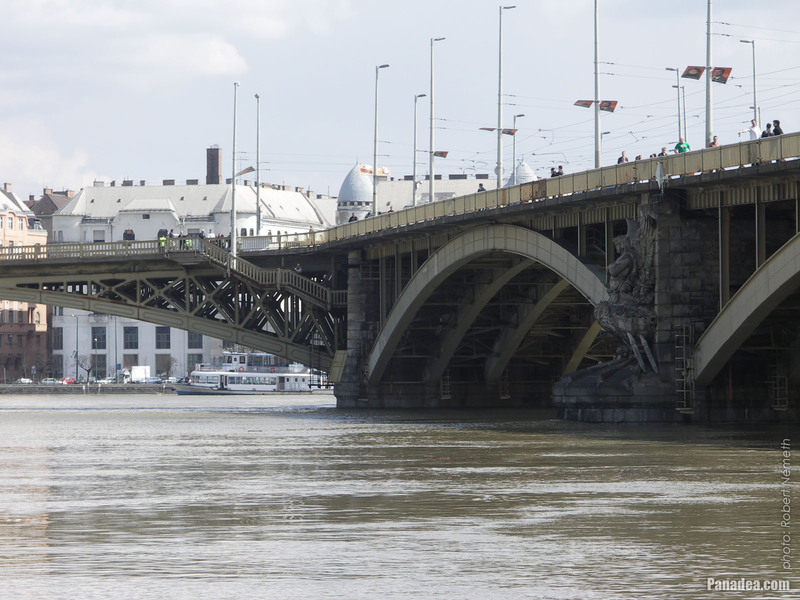 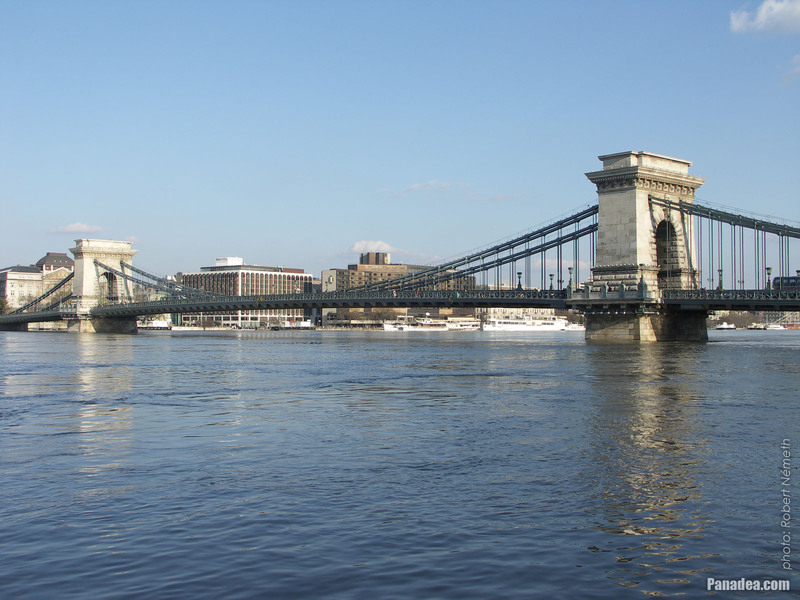 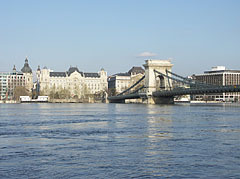 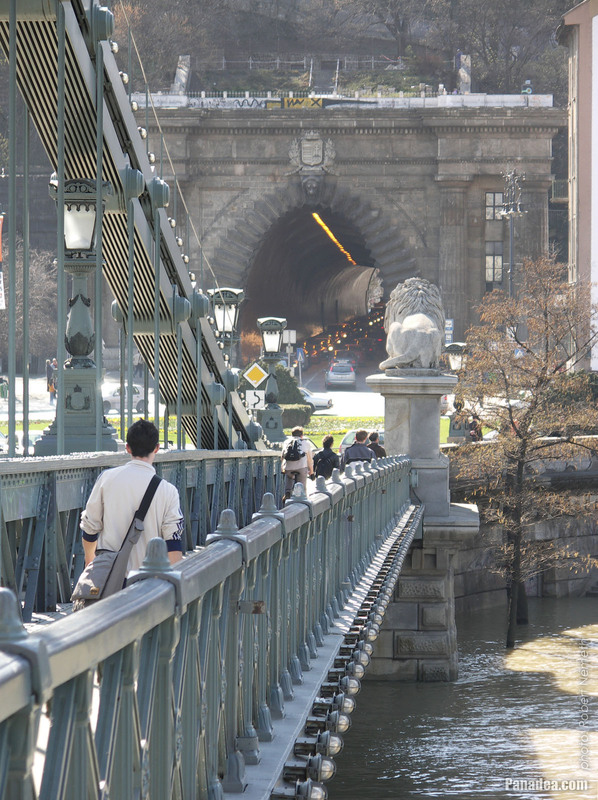 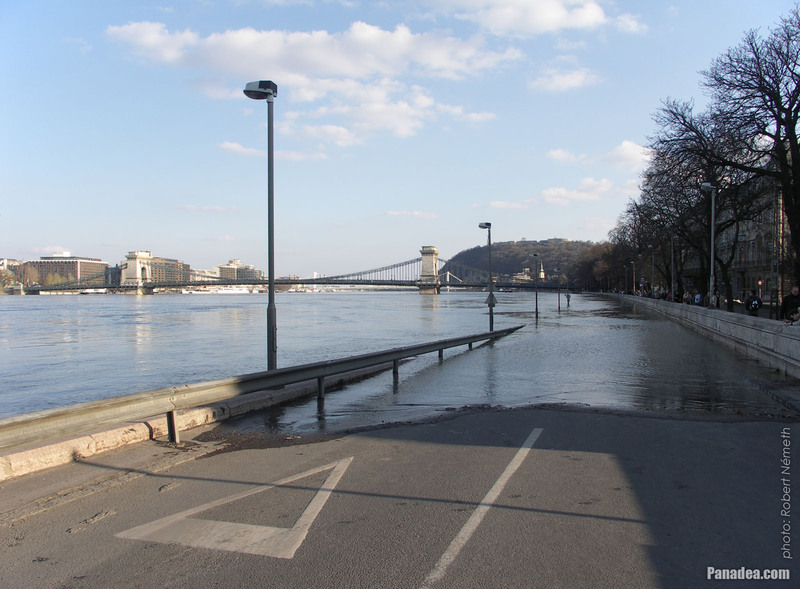 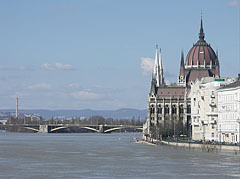 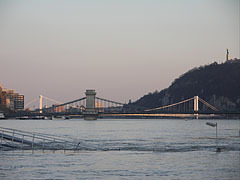 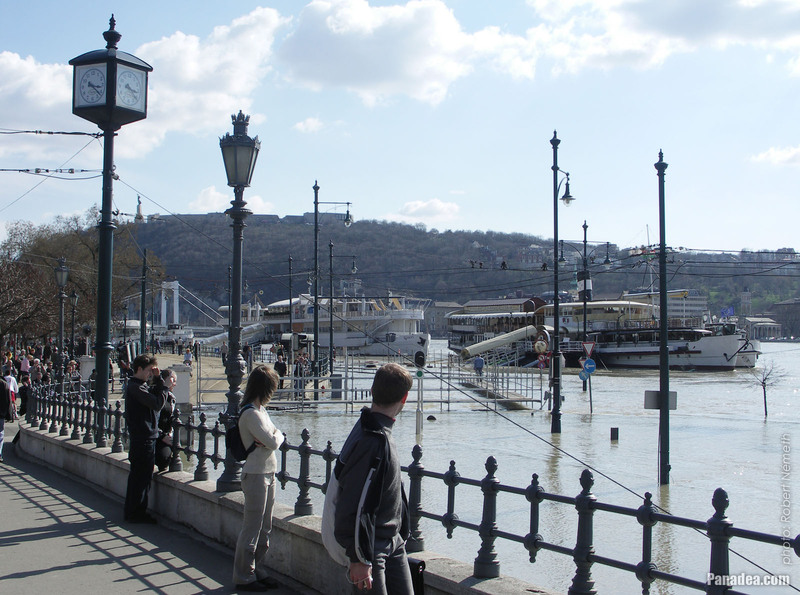 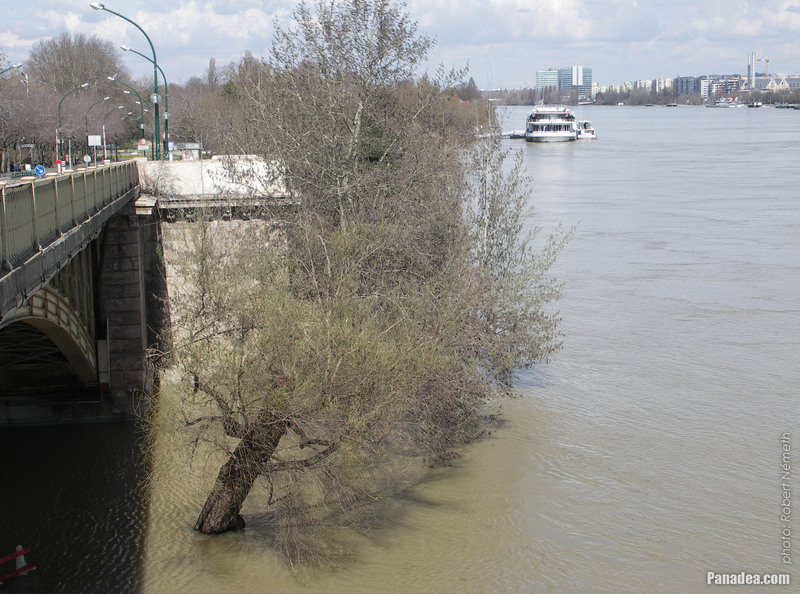 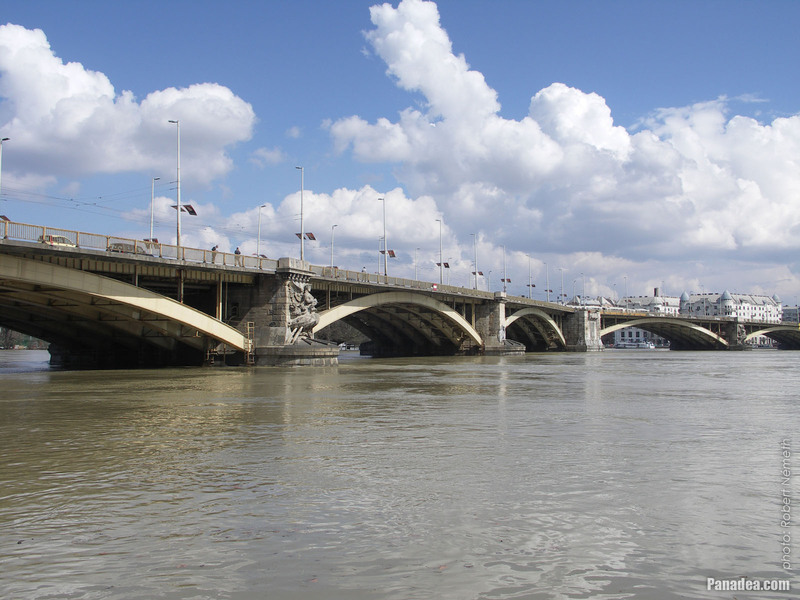 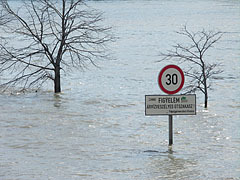 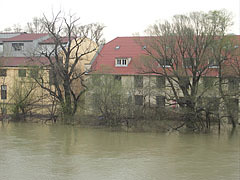 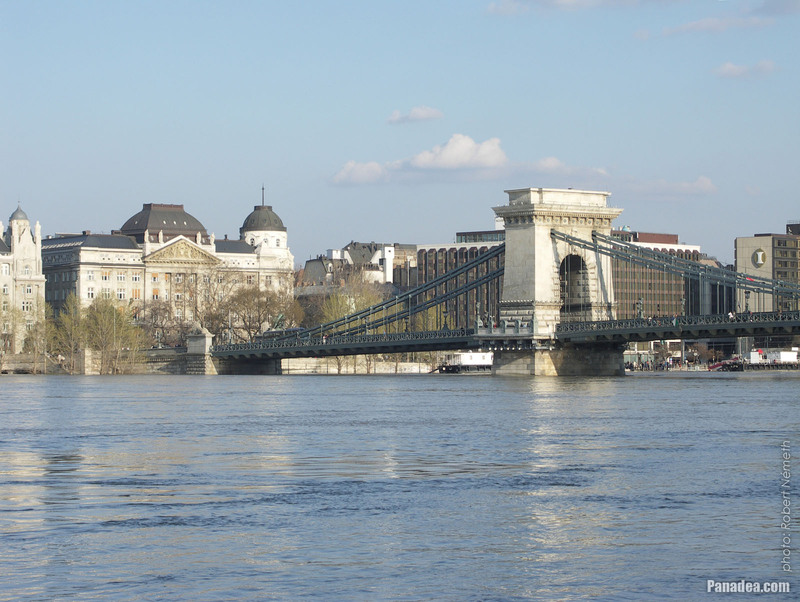 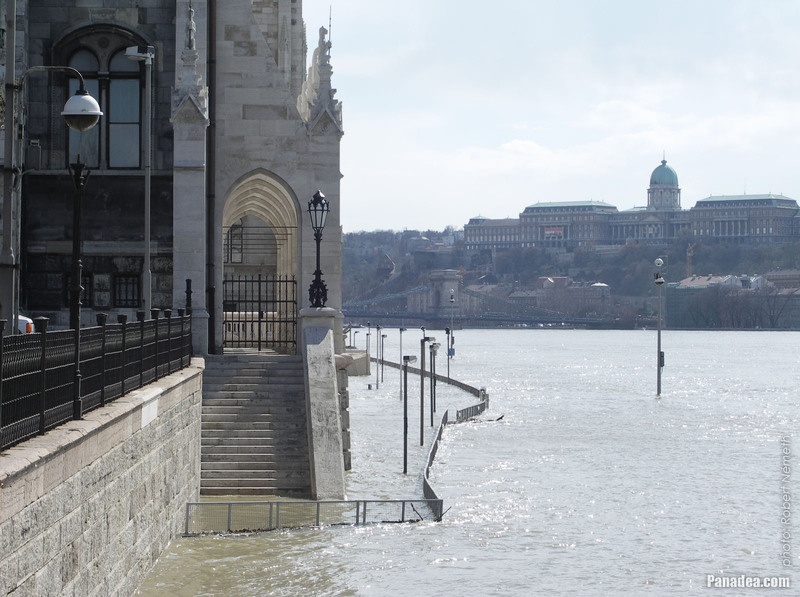 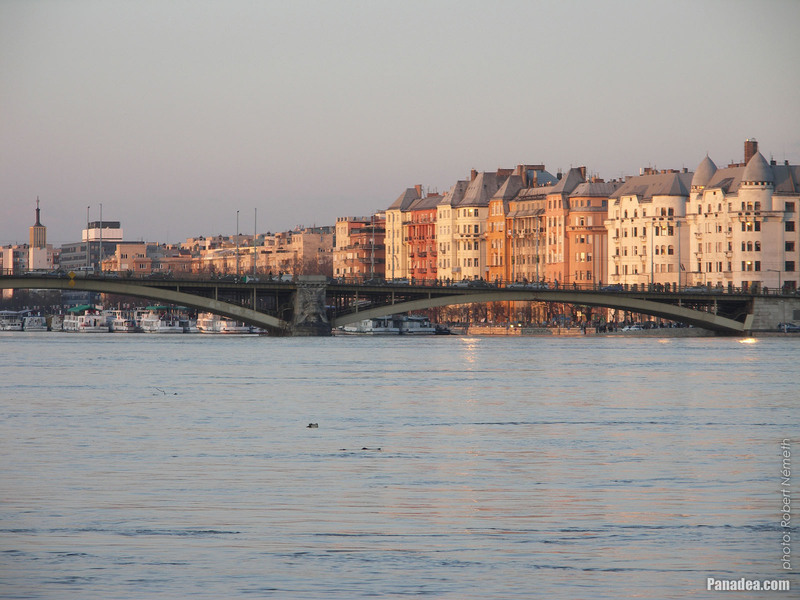 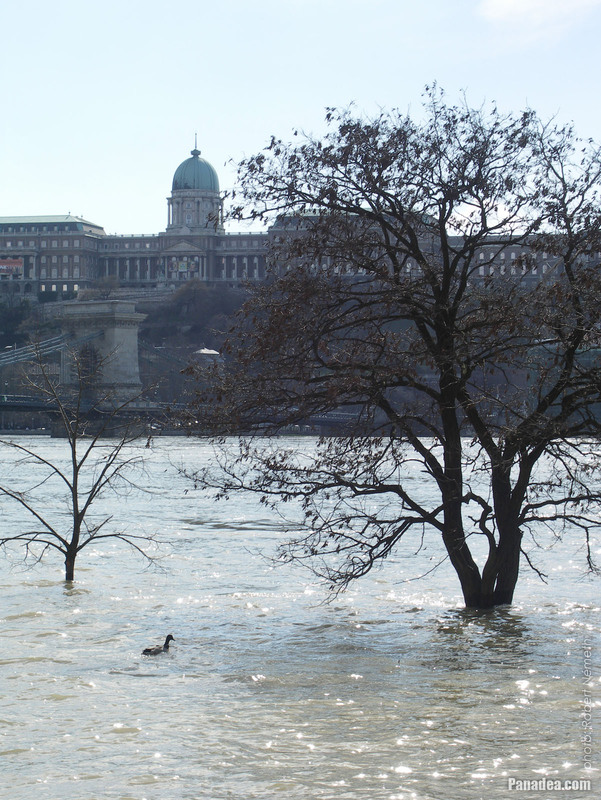 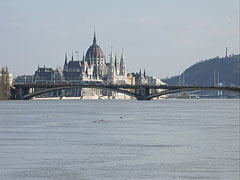 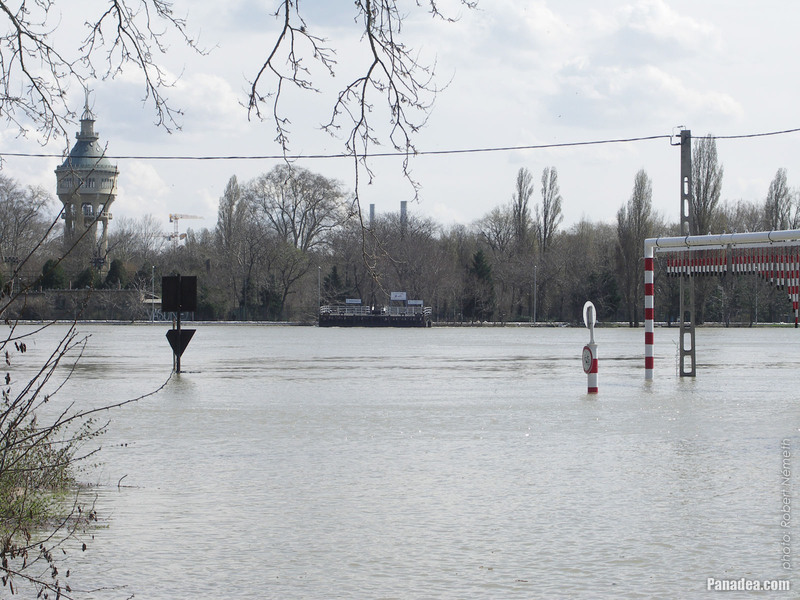 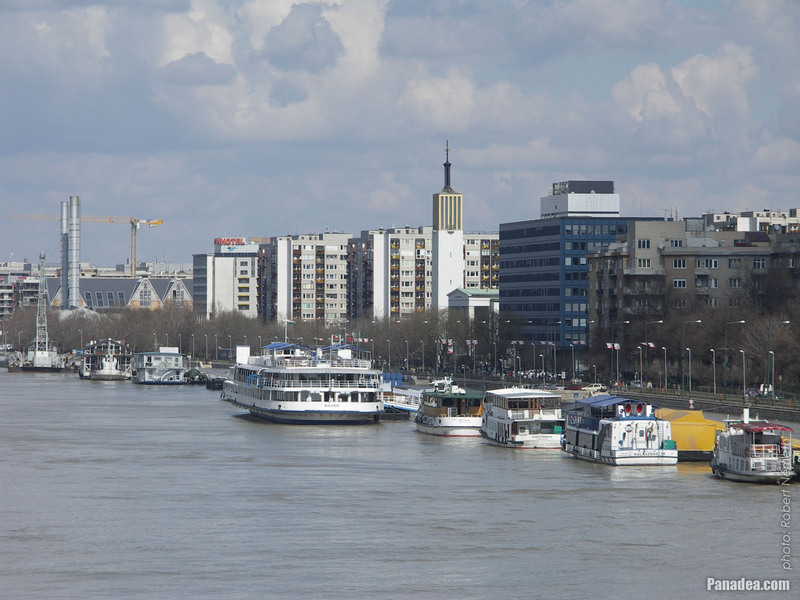 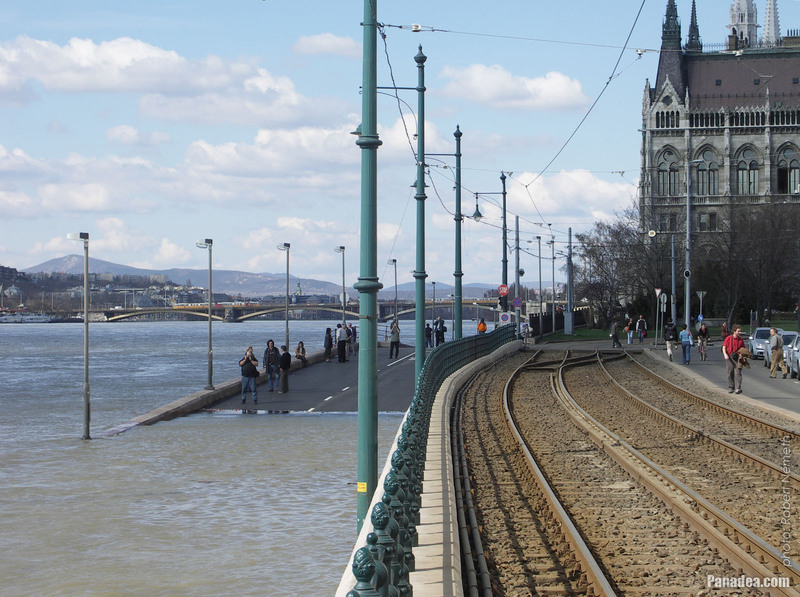 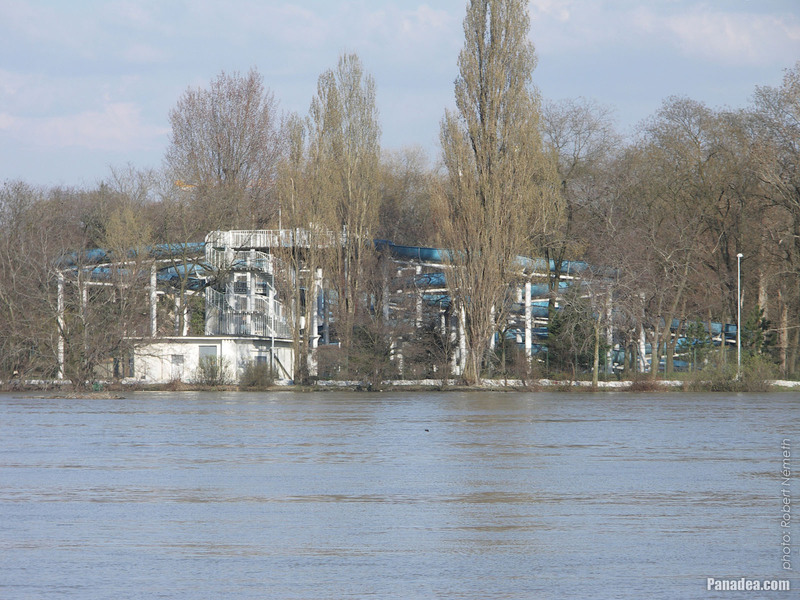 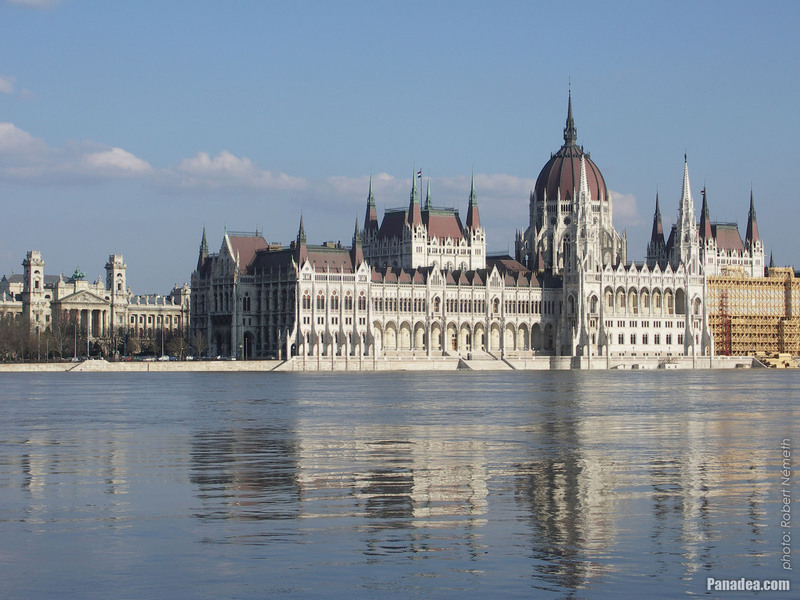 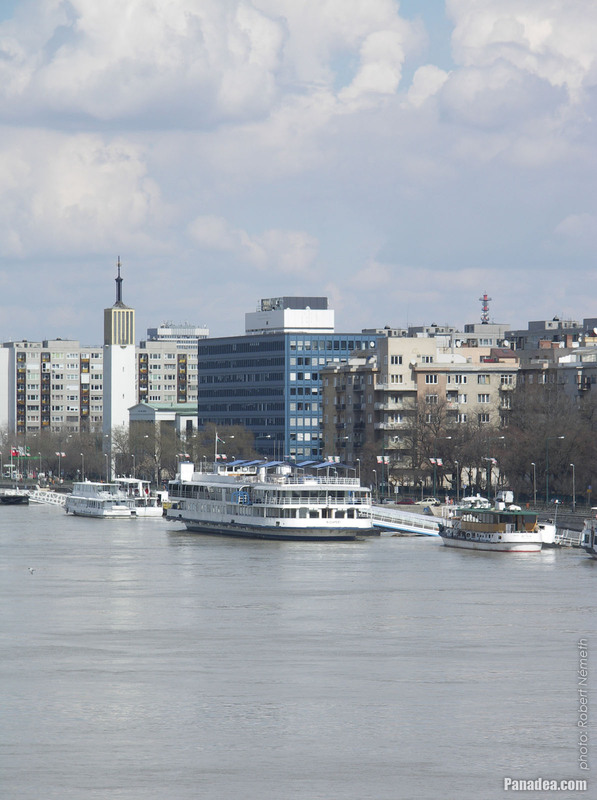 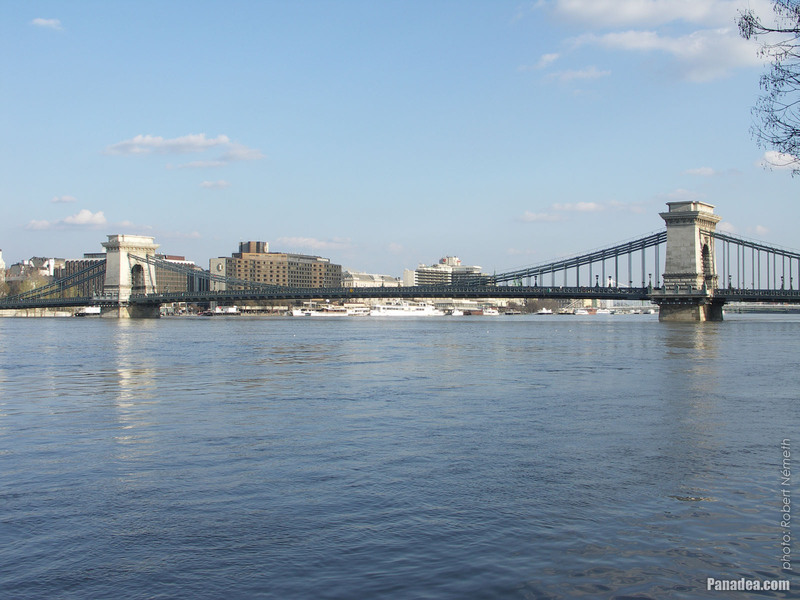 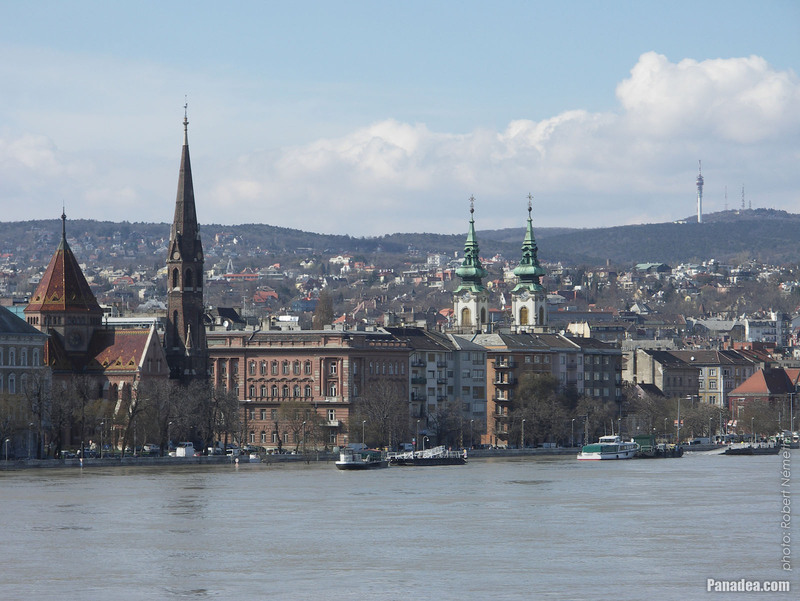 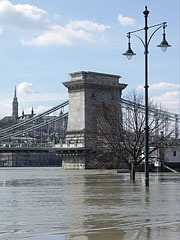 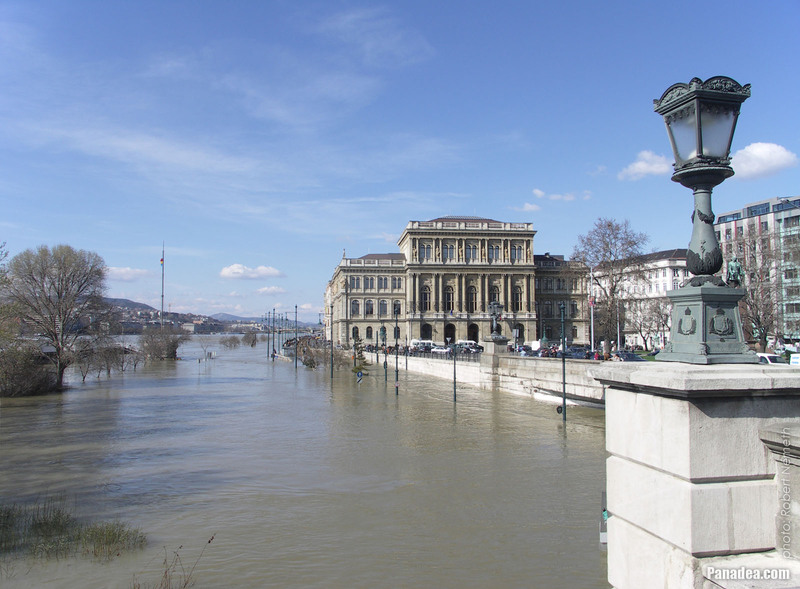 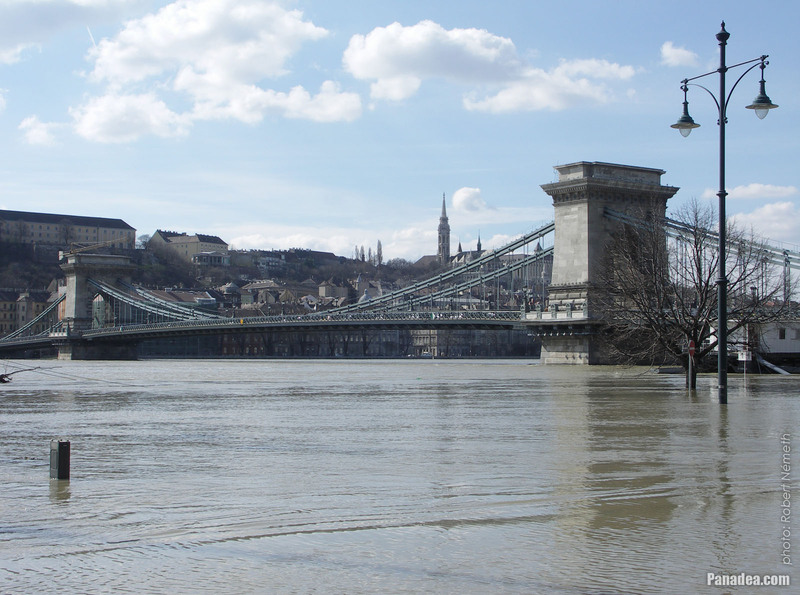 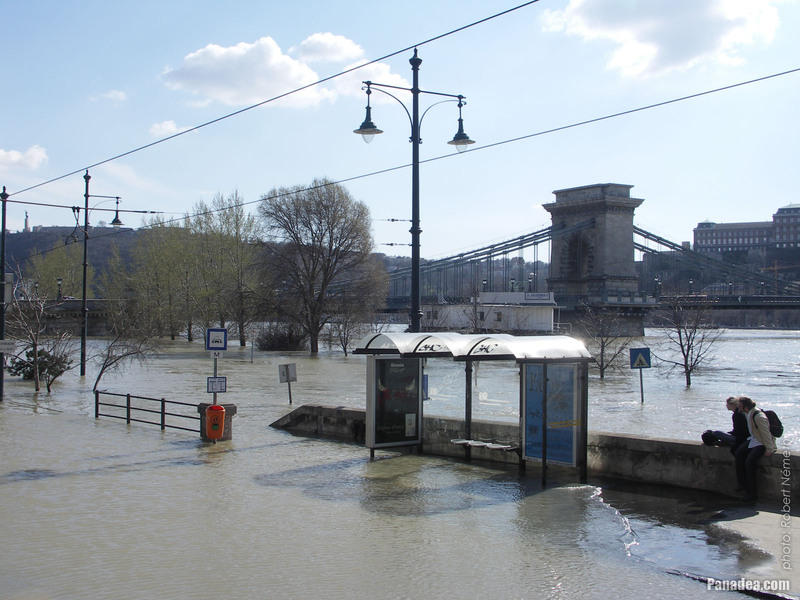 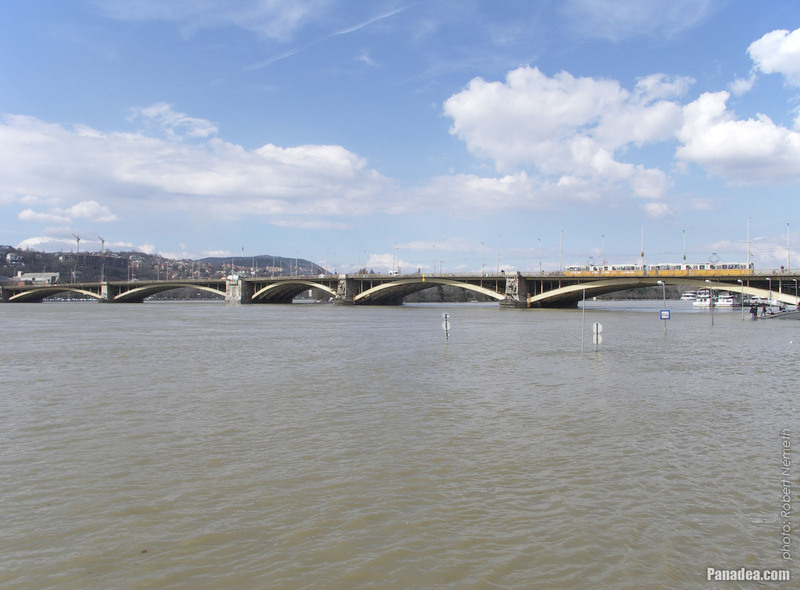 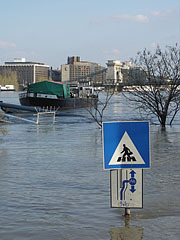 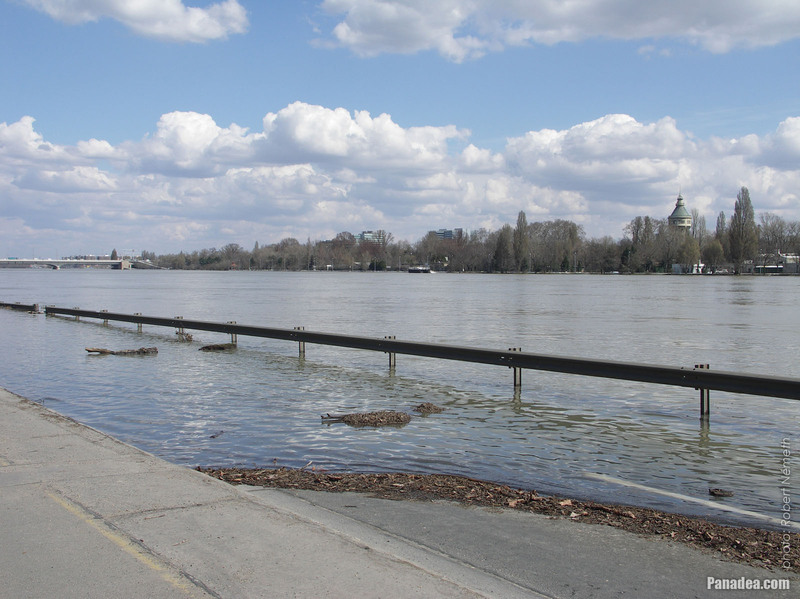 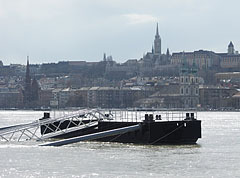 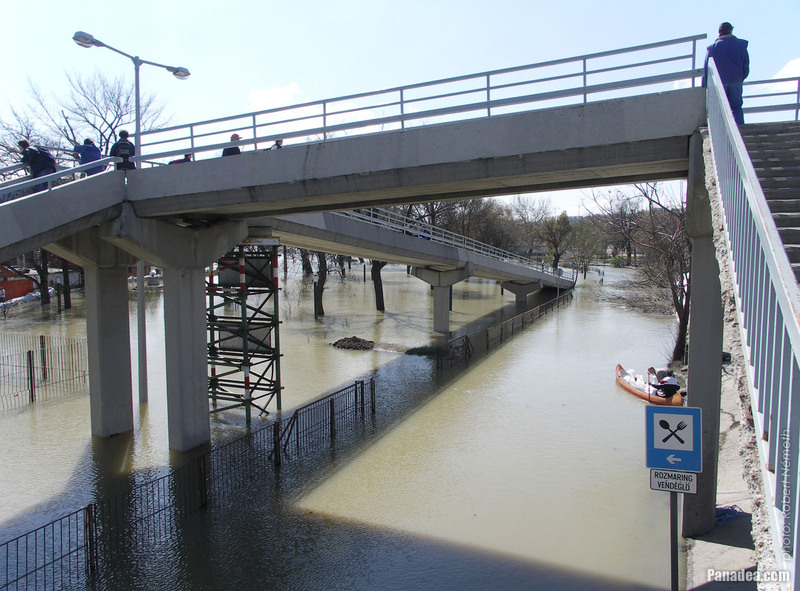 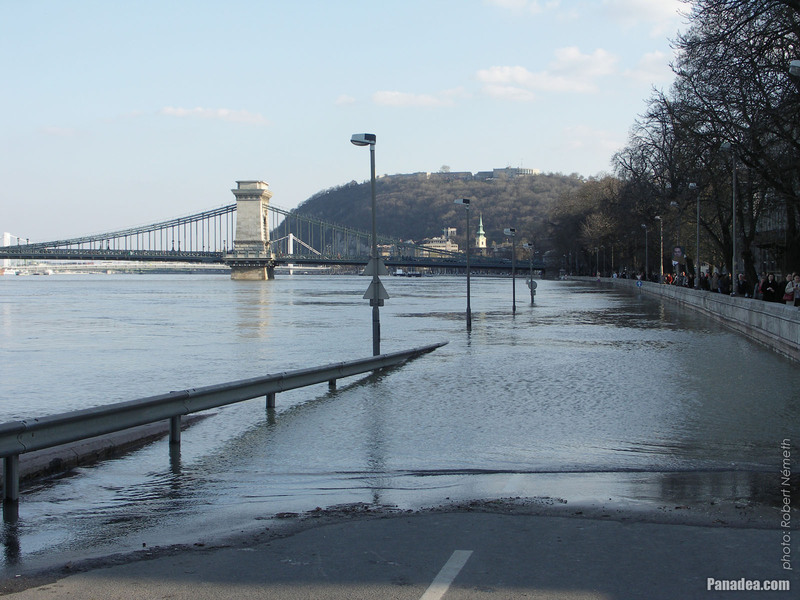 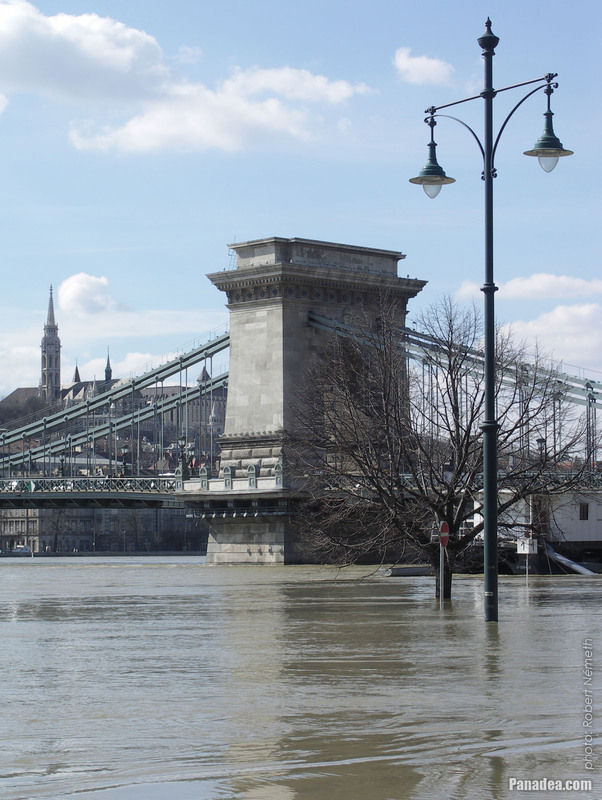 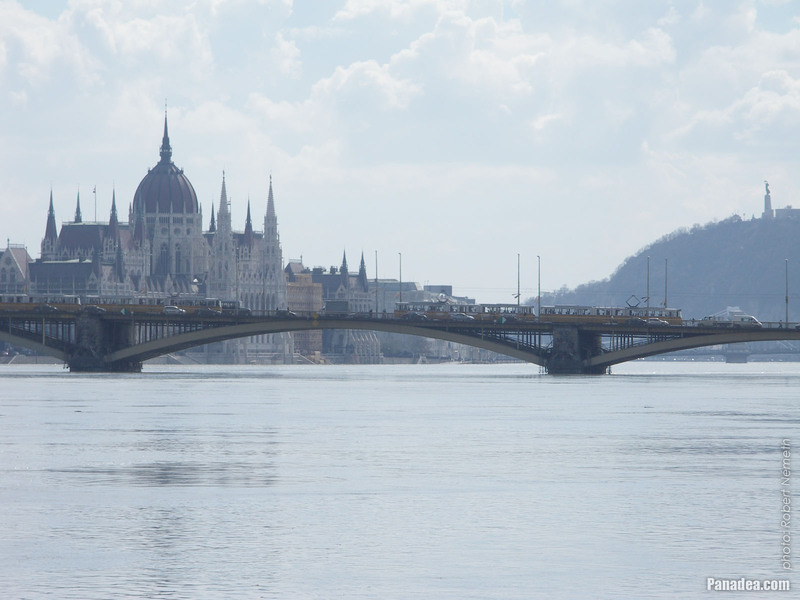 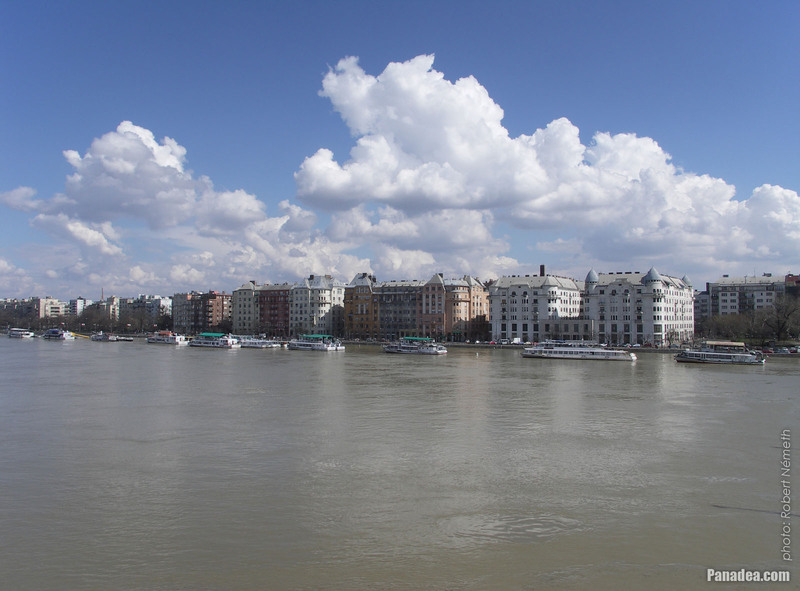 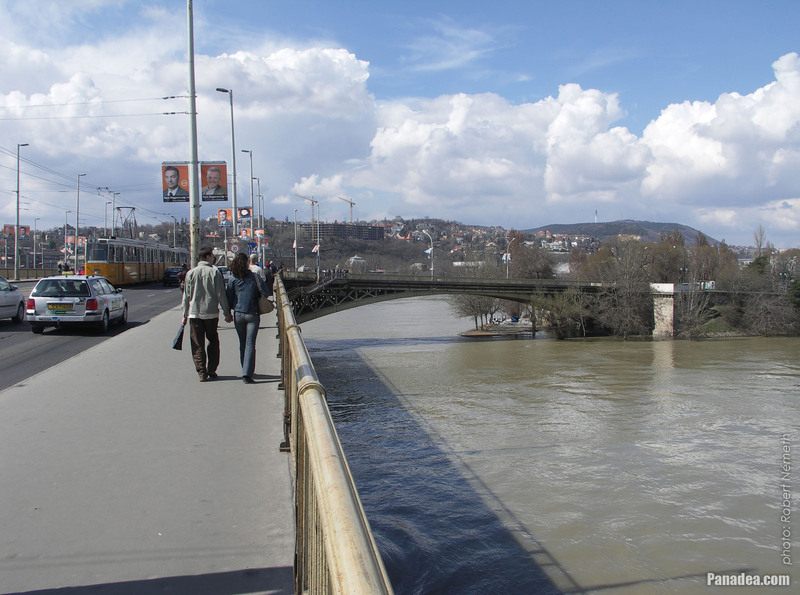 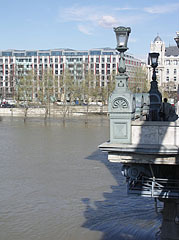 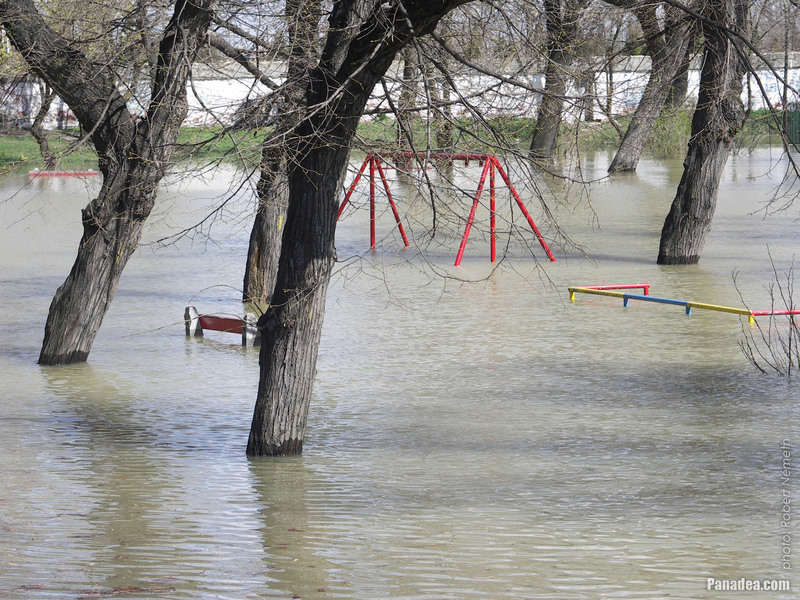 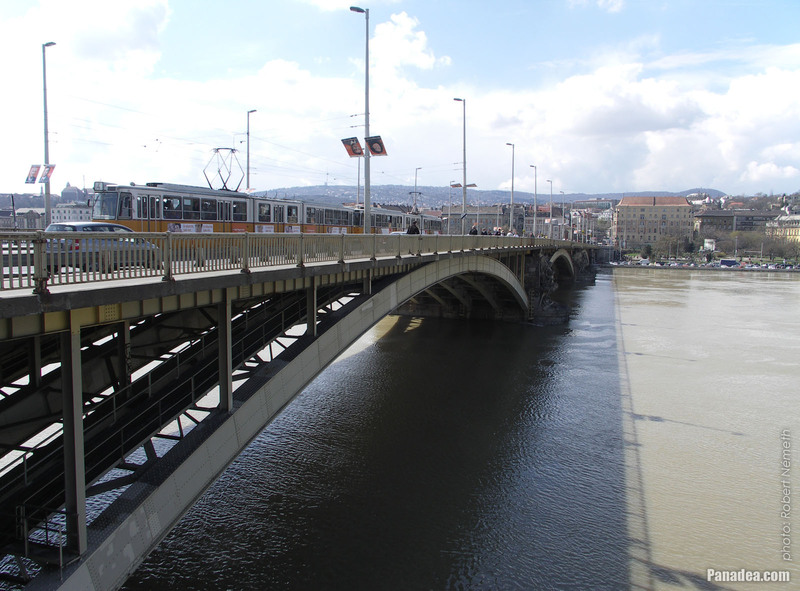 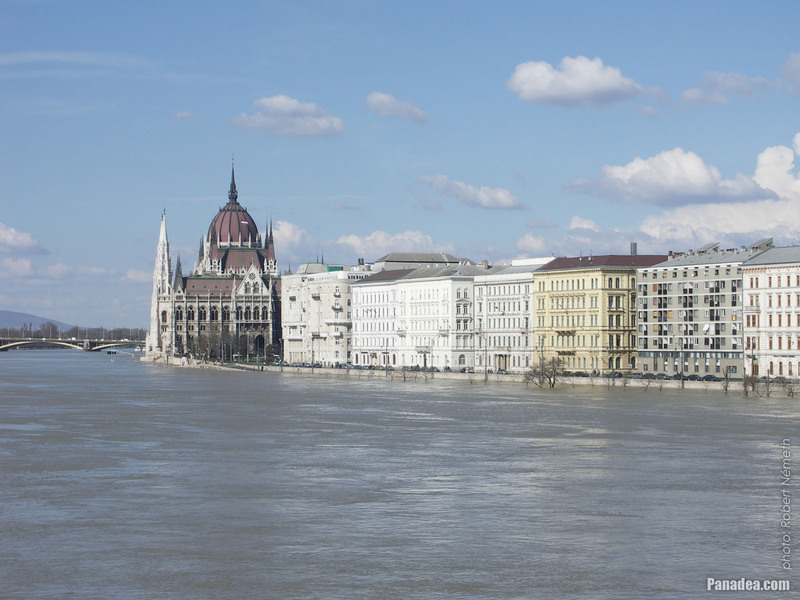 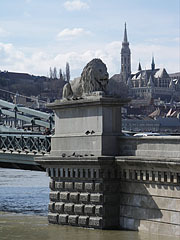 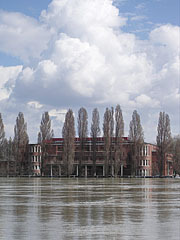 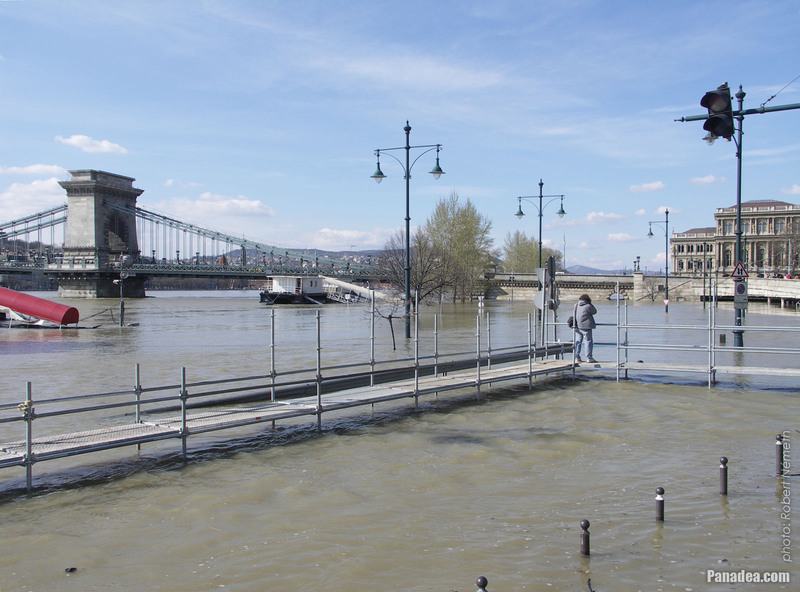 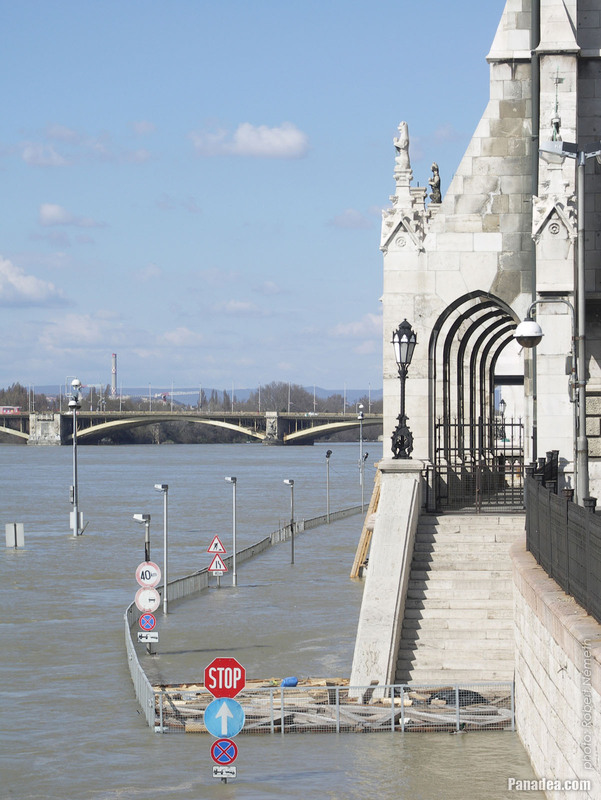 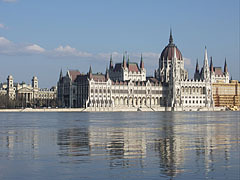 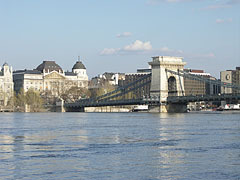 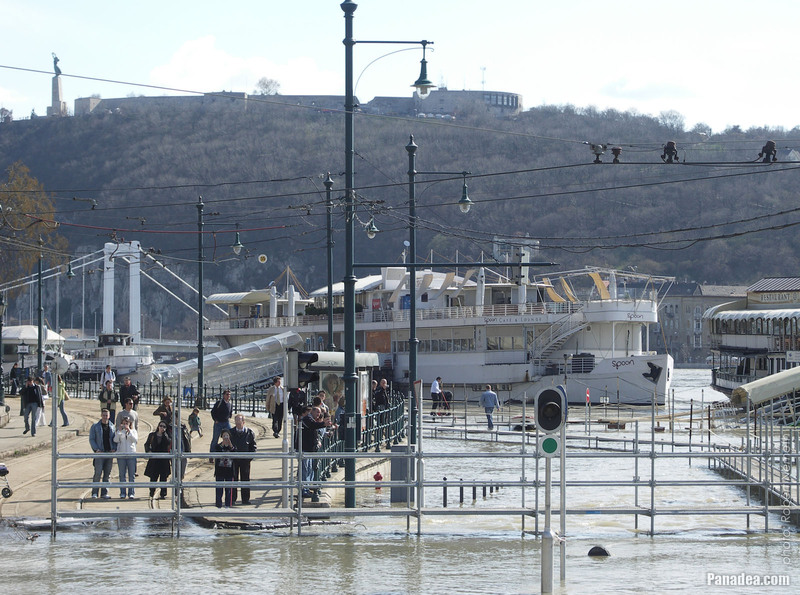 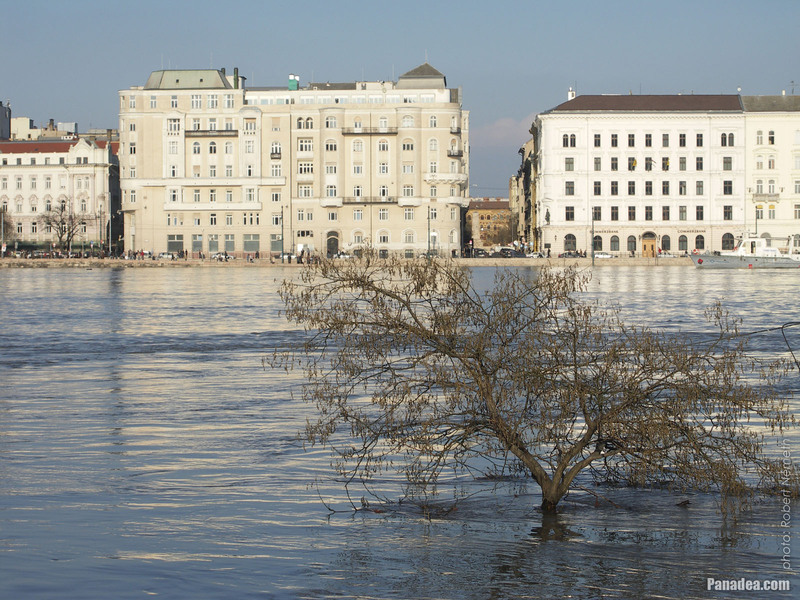 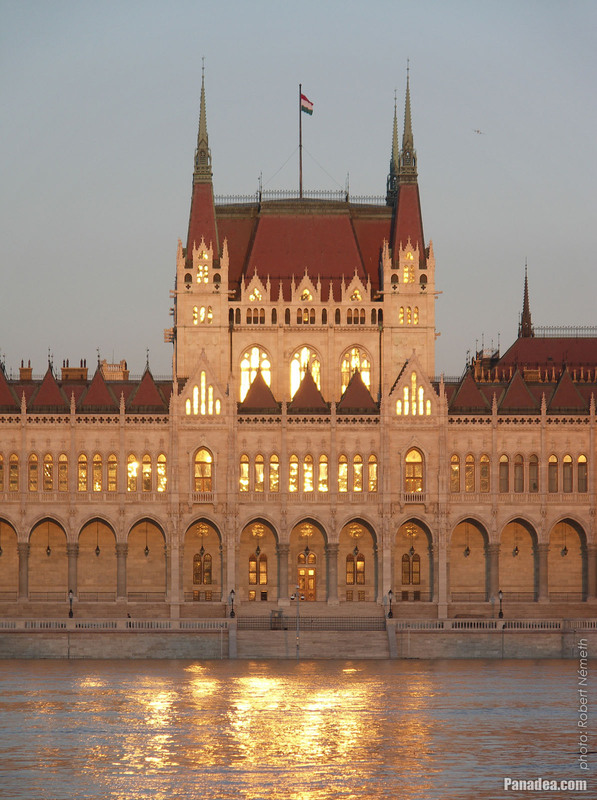 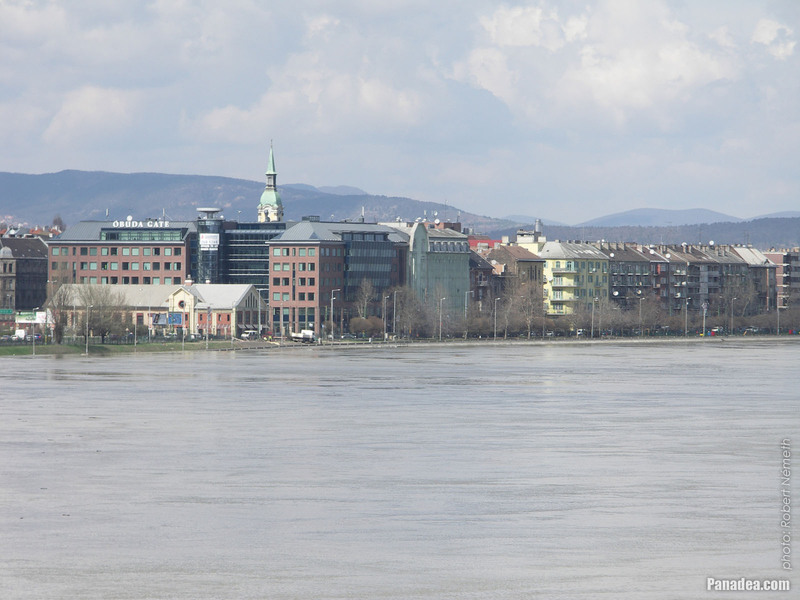 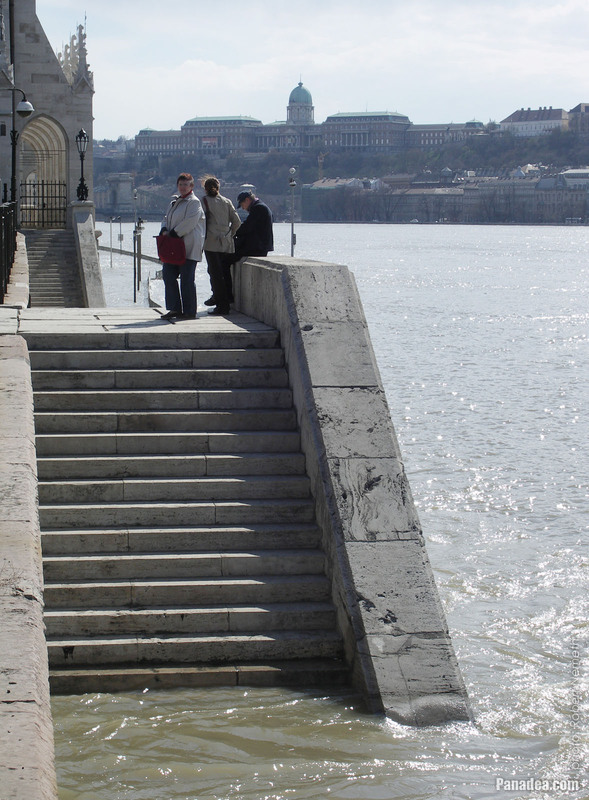 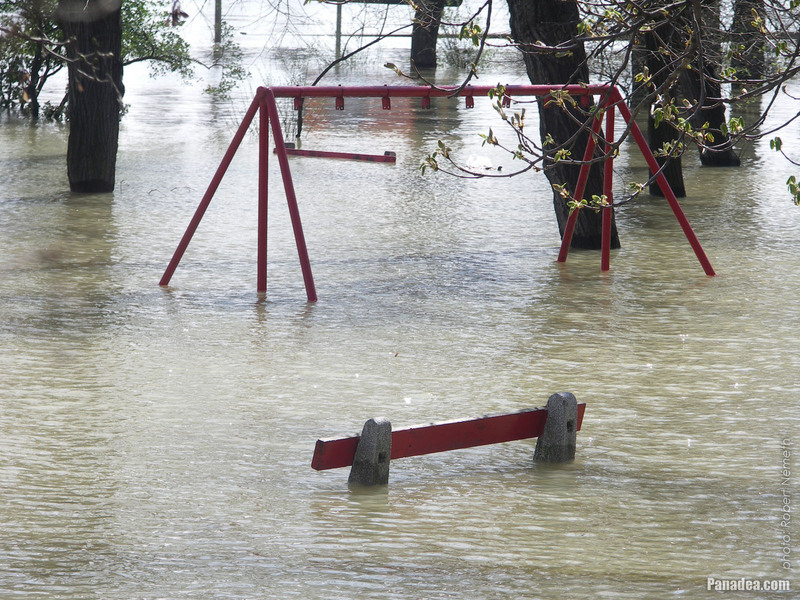 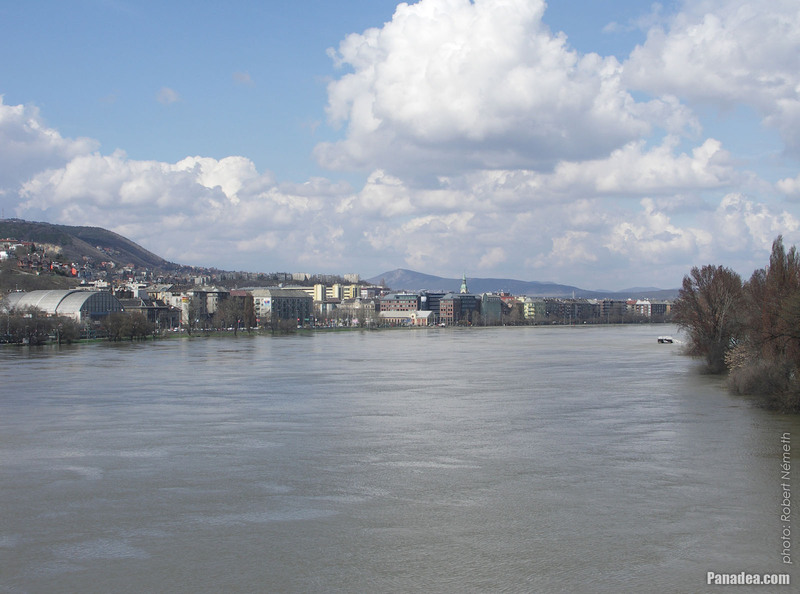 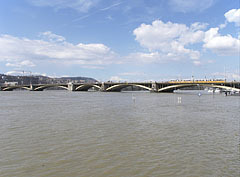 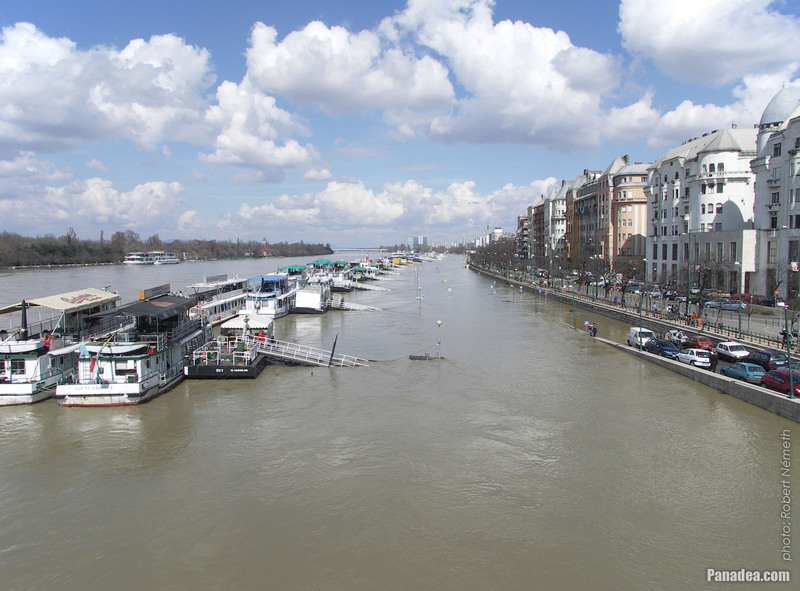 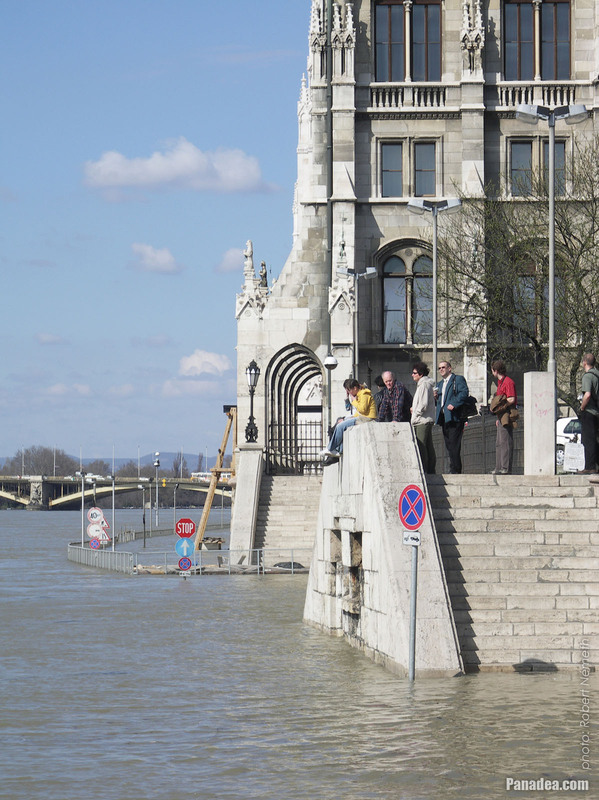 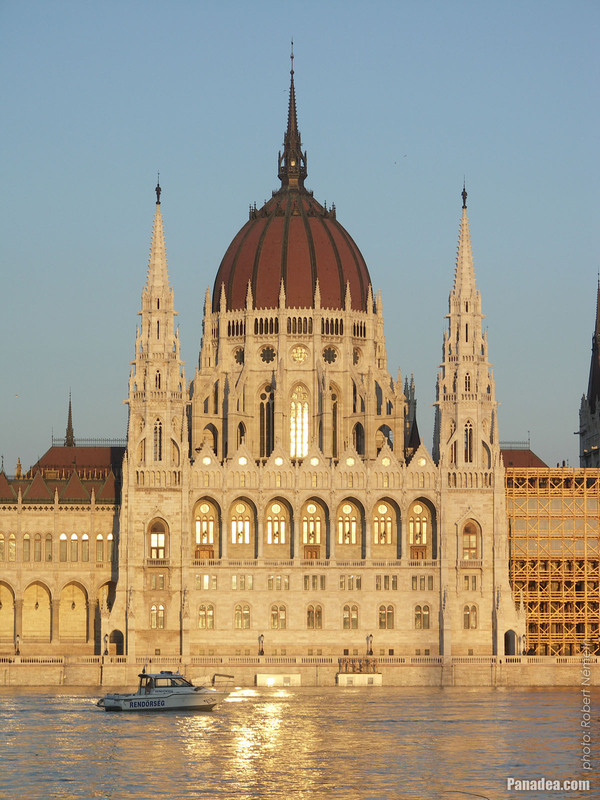 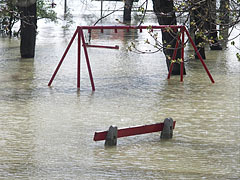 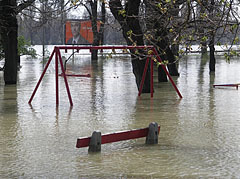 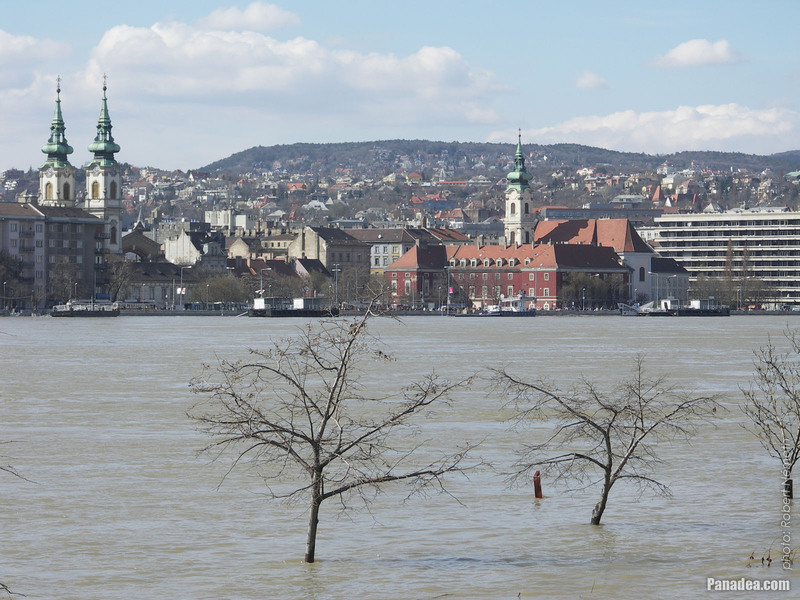 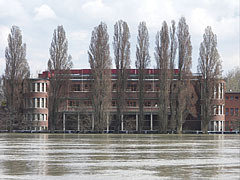 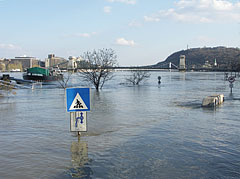 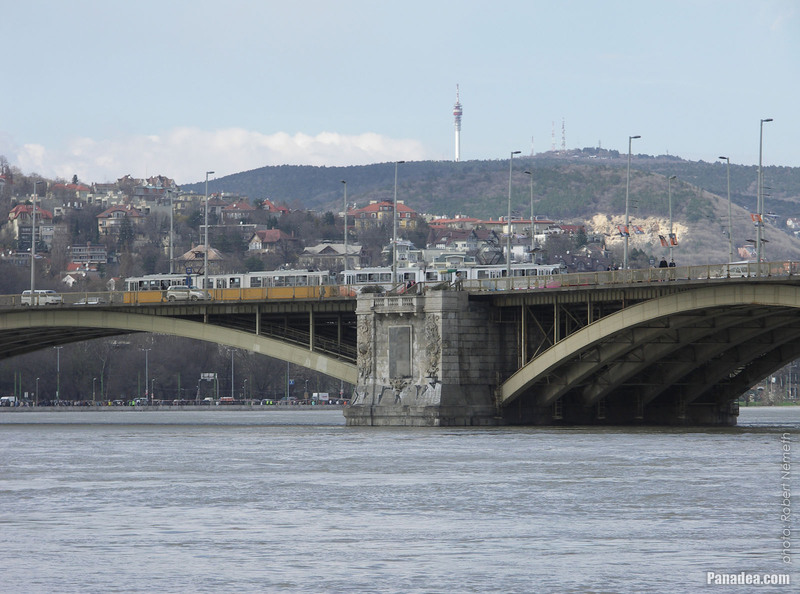 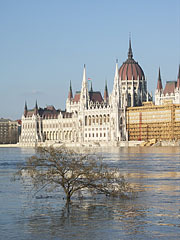 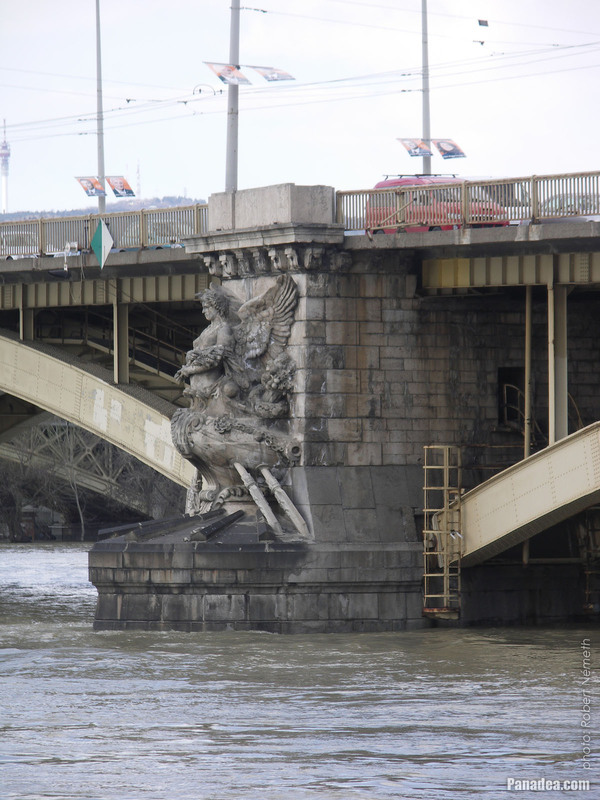 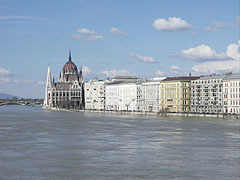 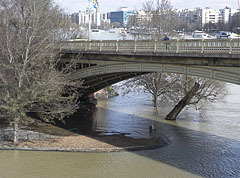 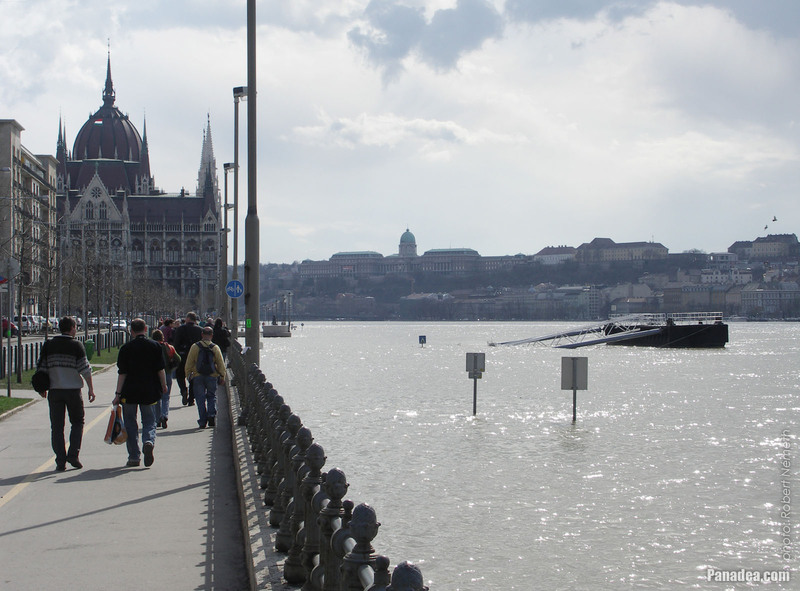 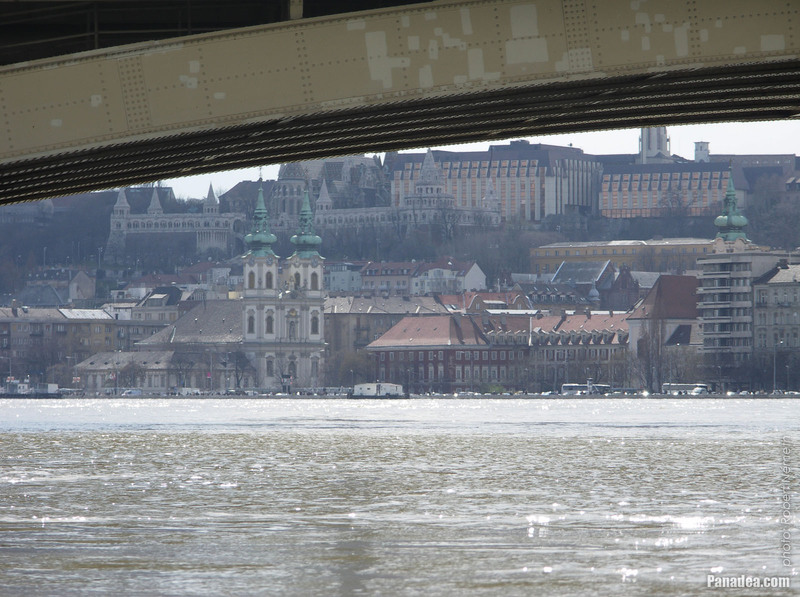 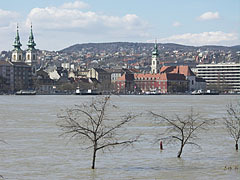 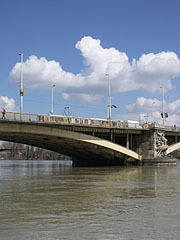 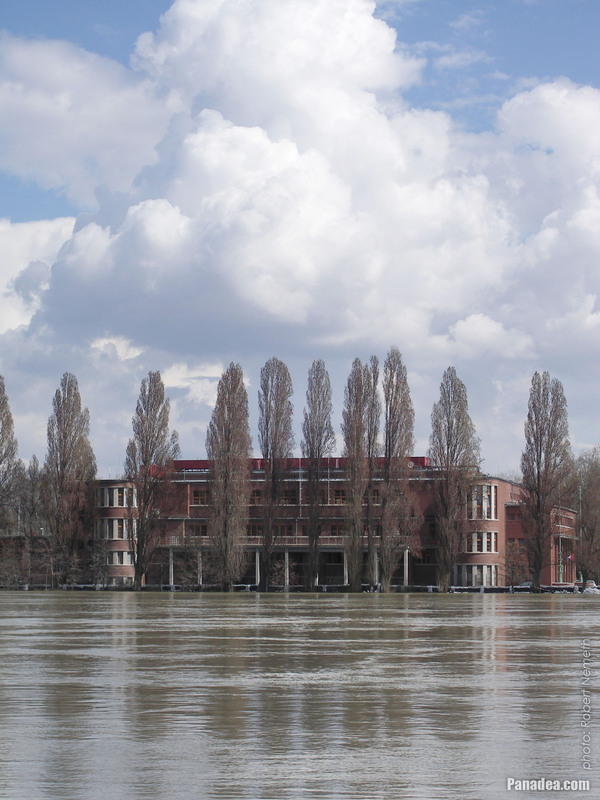 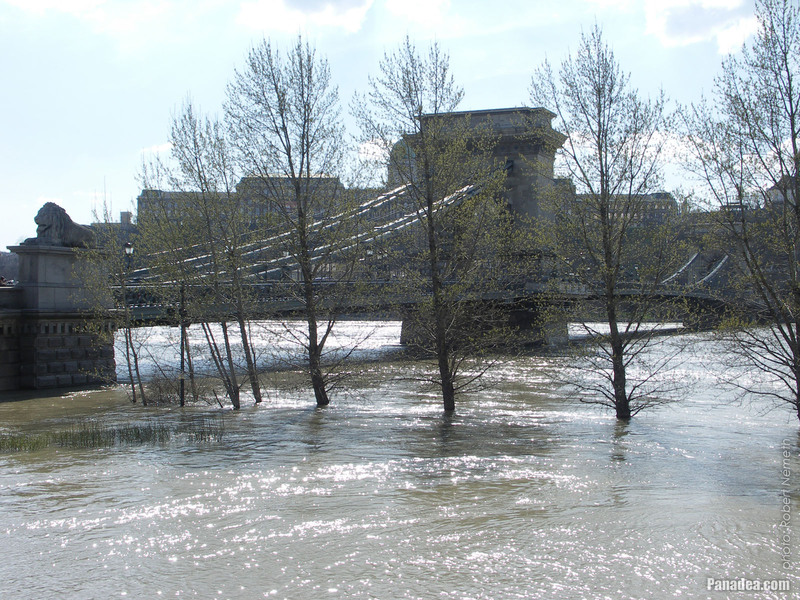 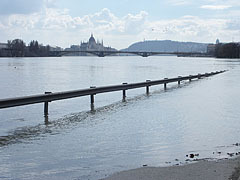 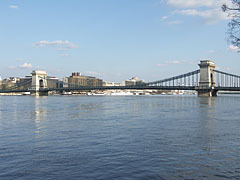 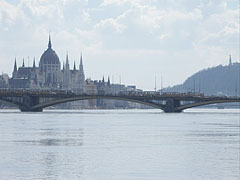 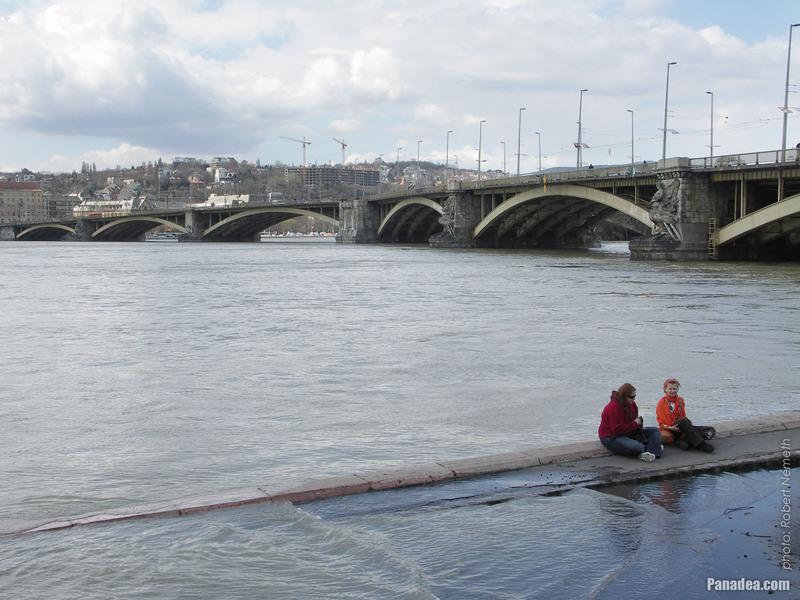 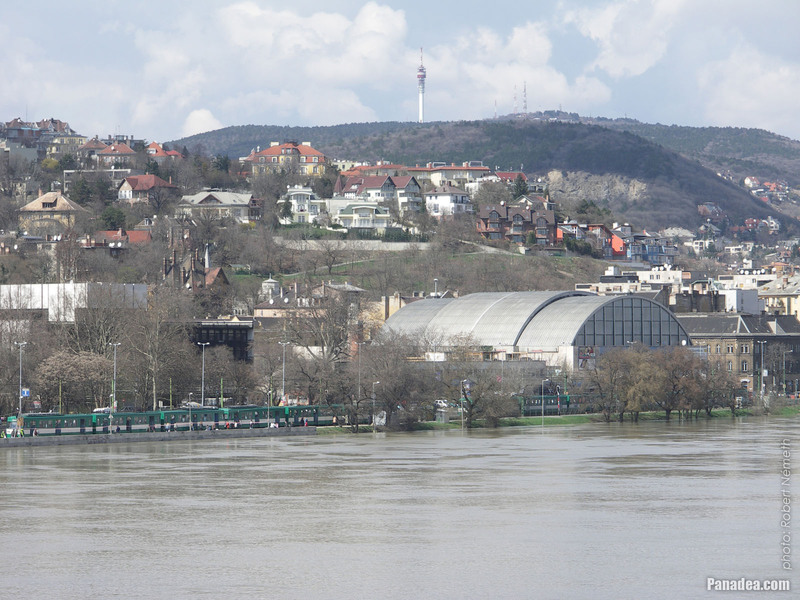 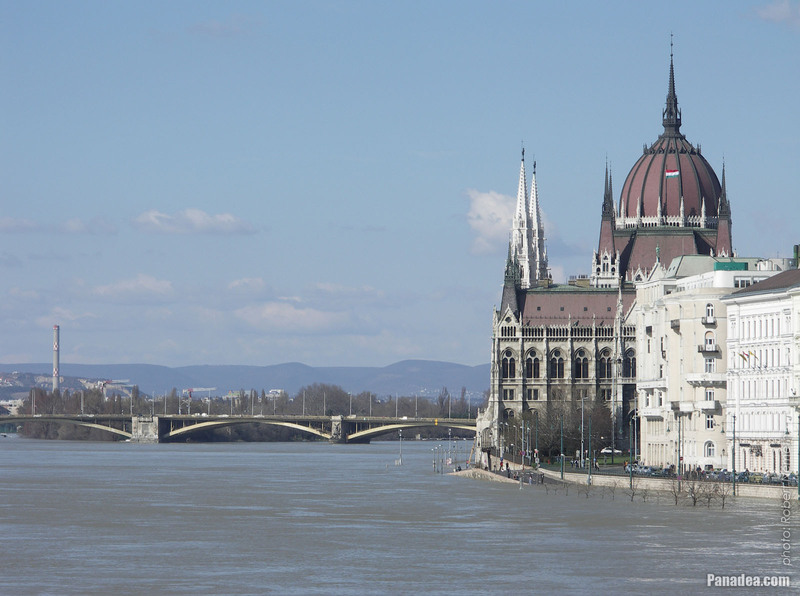 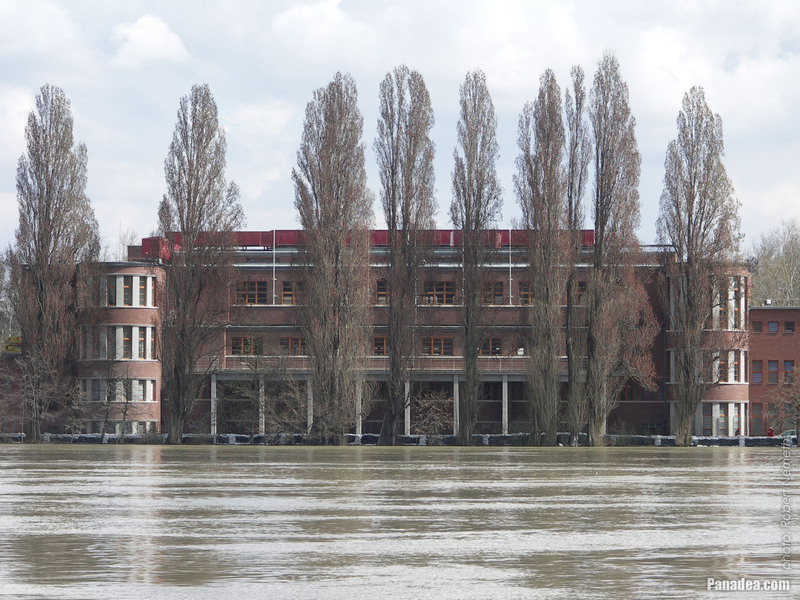 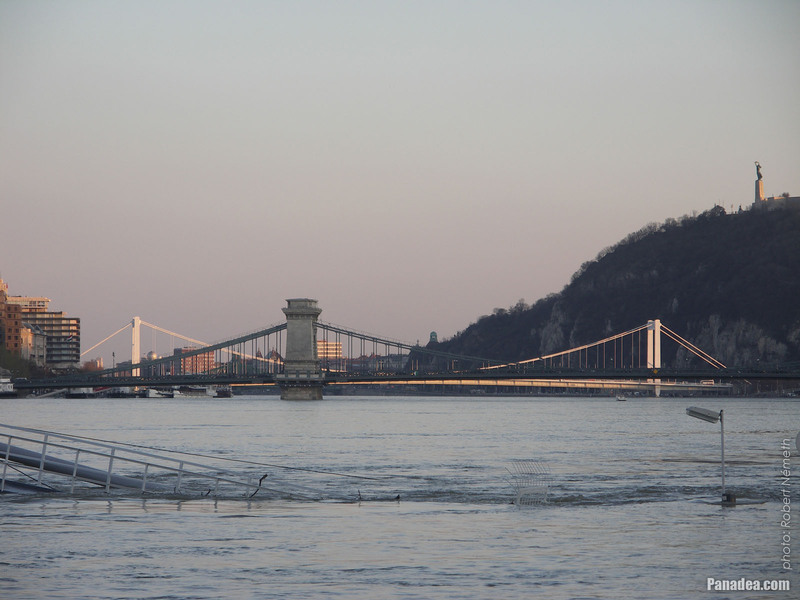 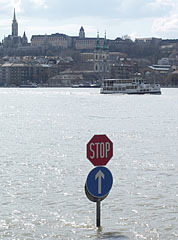 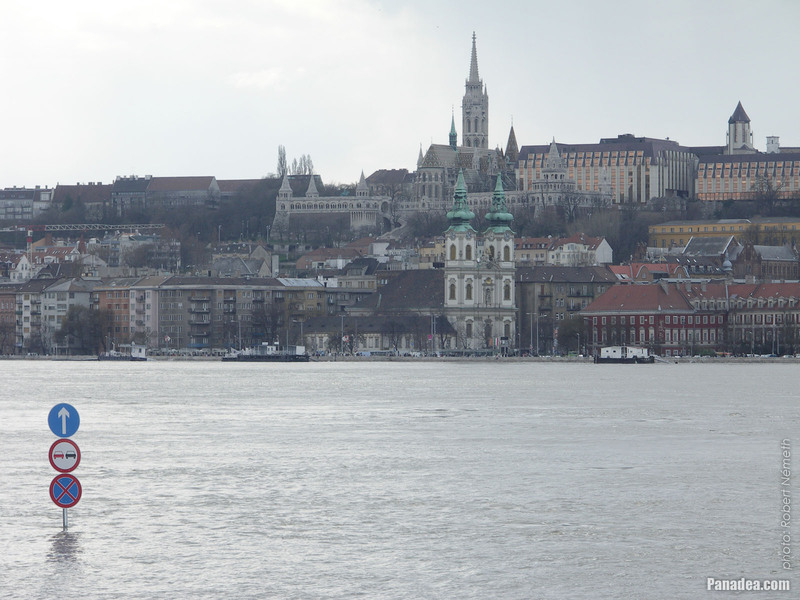 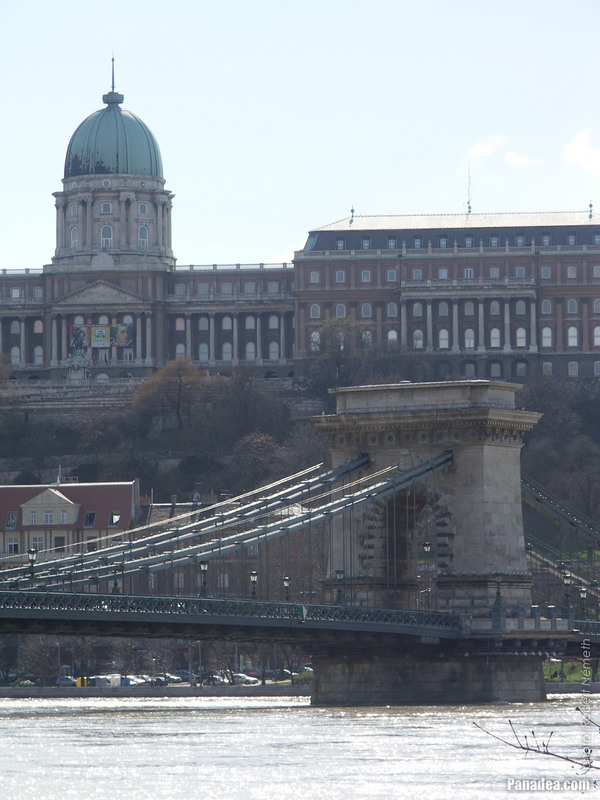 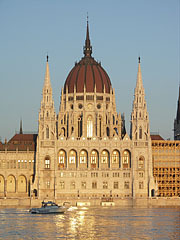 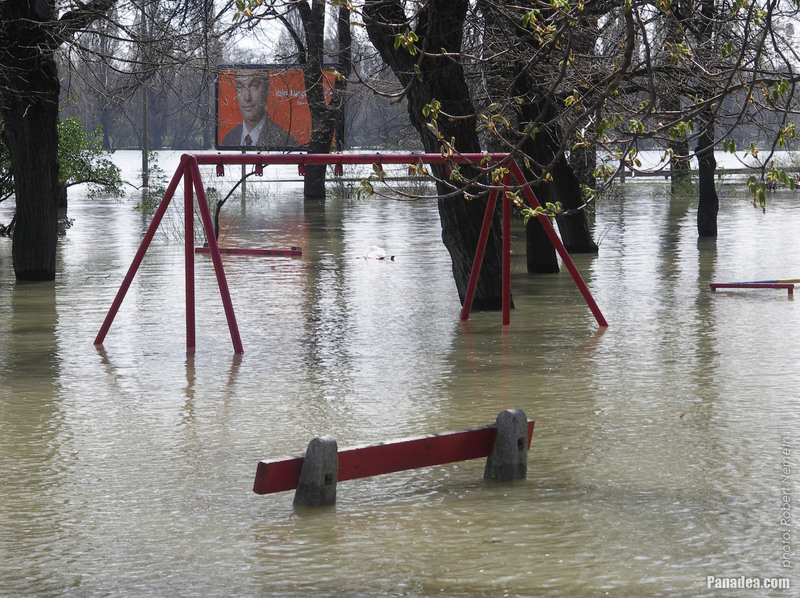 It was manufactured in 1928 in Germany, where it was operated on the Saar River, it is in Hungary since 2003. 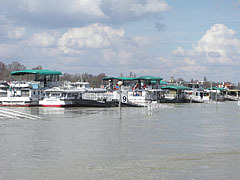 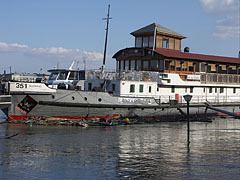 The small vessel was manufactured in 1982 in Balatonfüred, Hungary, it is a so-called crossing-boat, formerly it was called "Jancsi" and "Tudor". 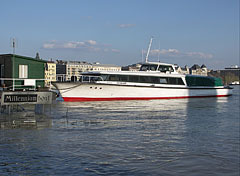 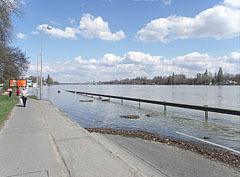 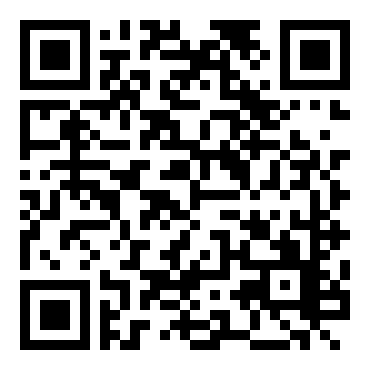 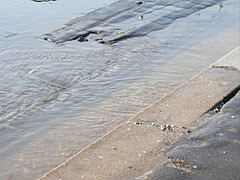 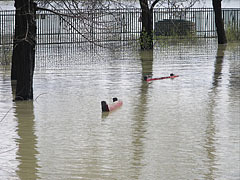 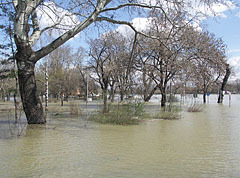 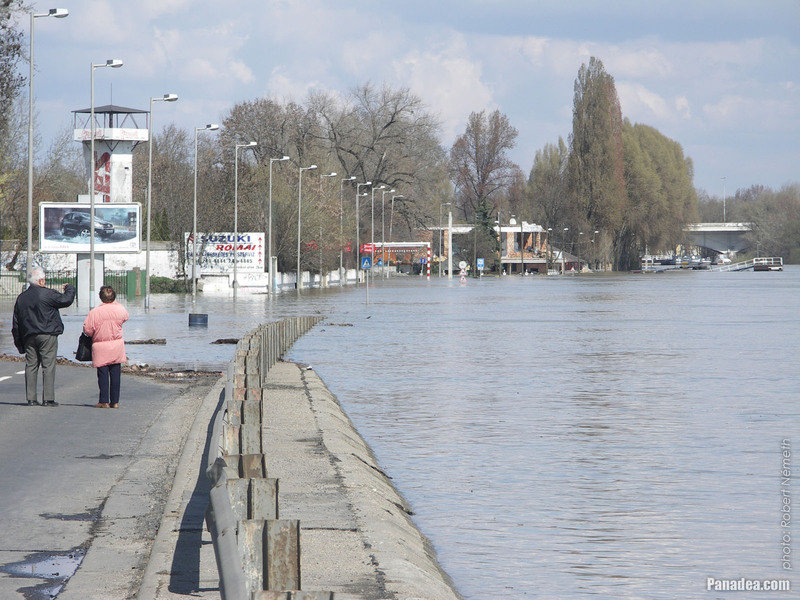 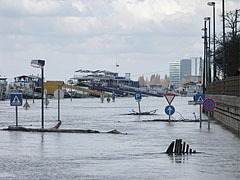 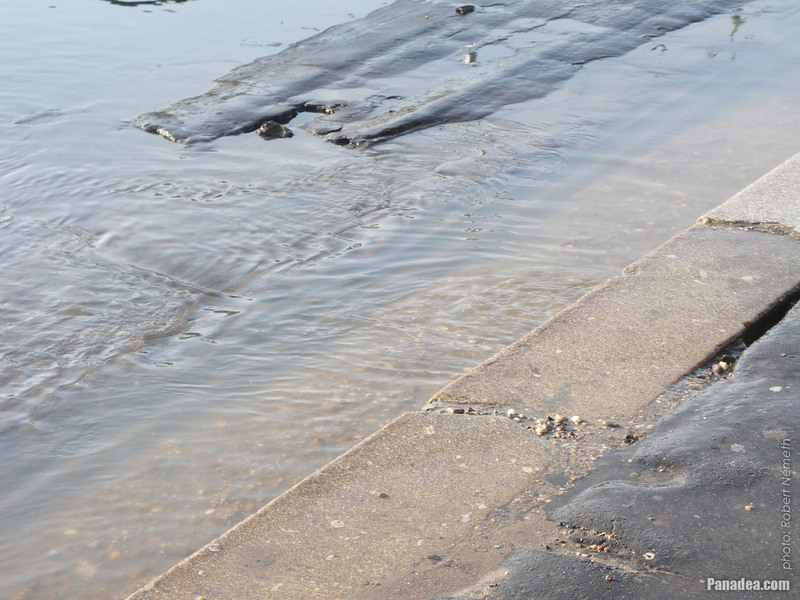 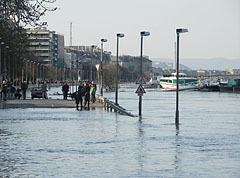 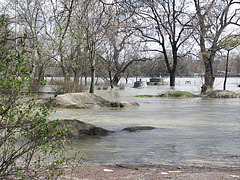 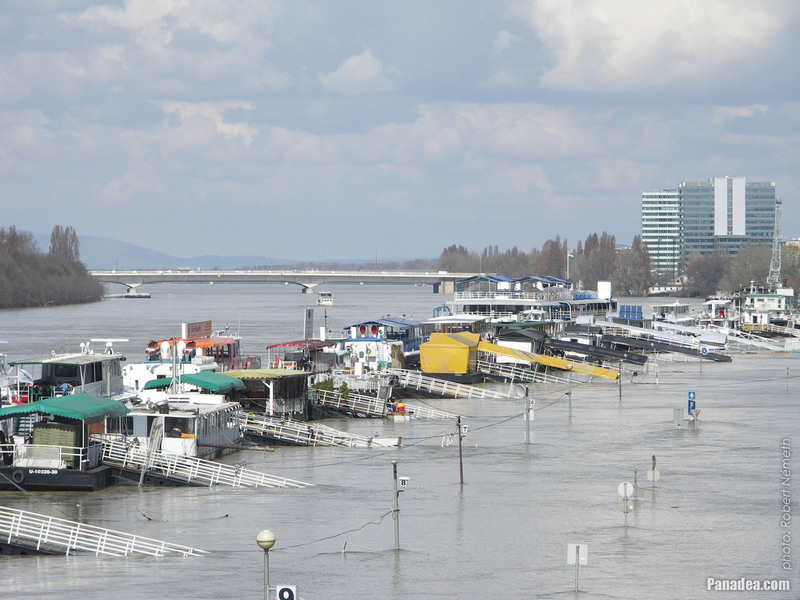 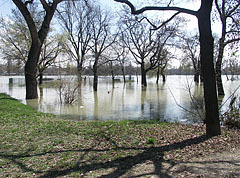 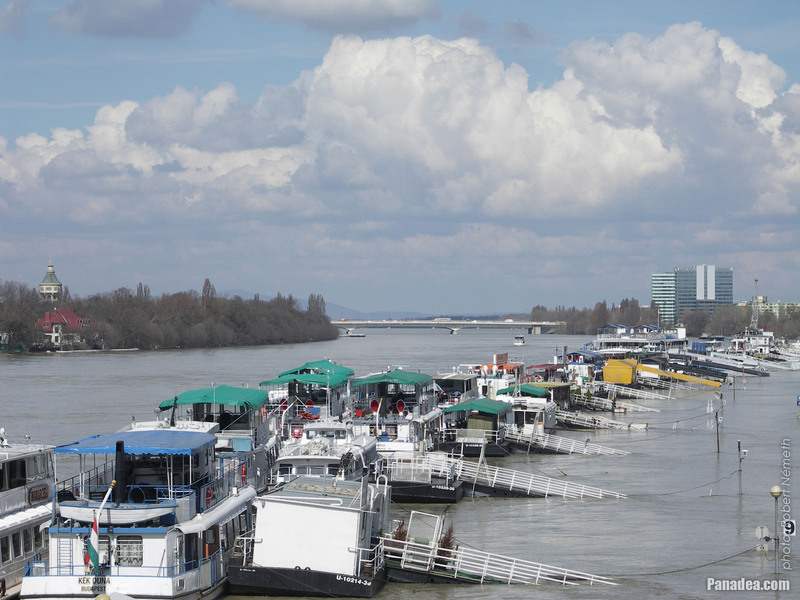 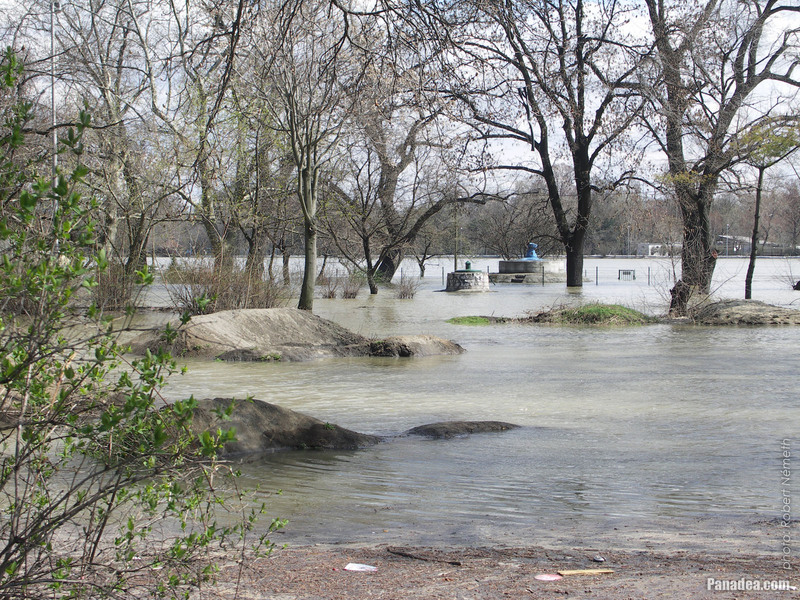 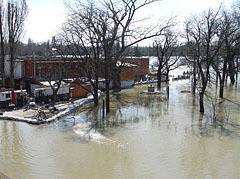 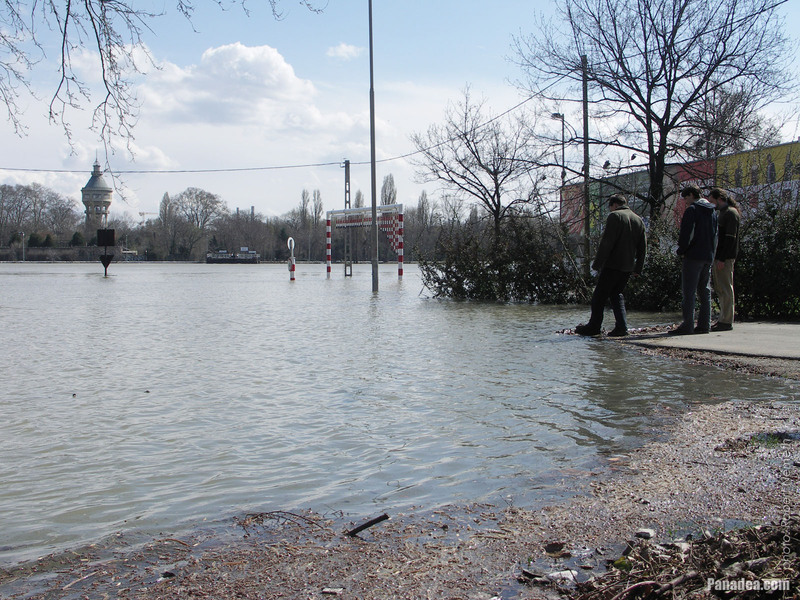 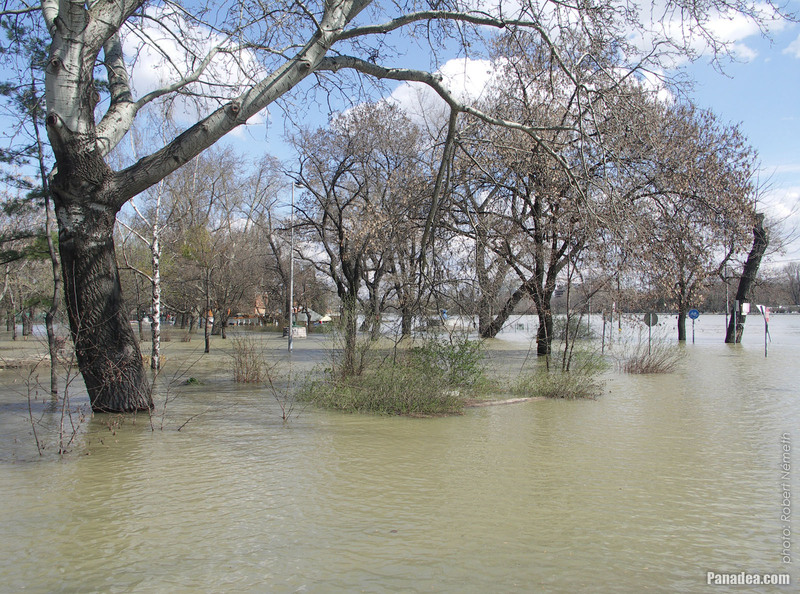 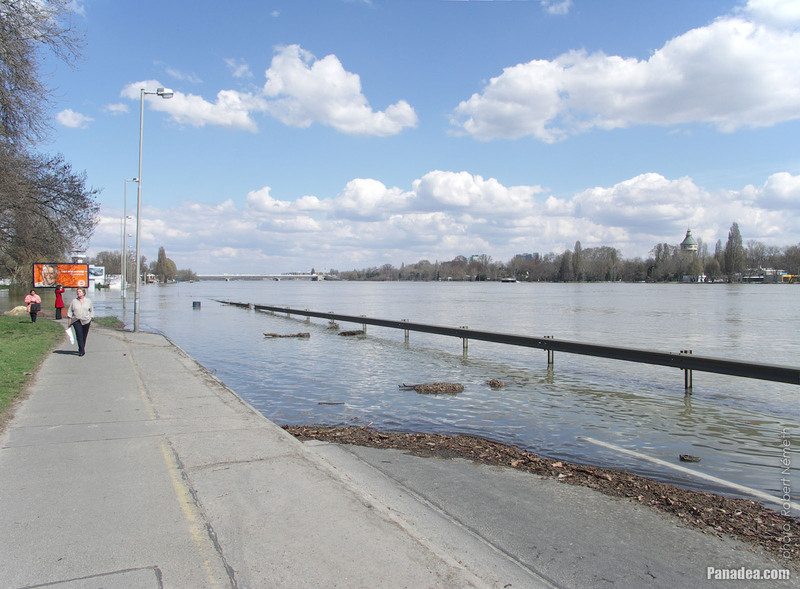 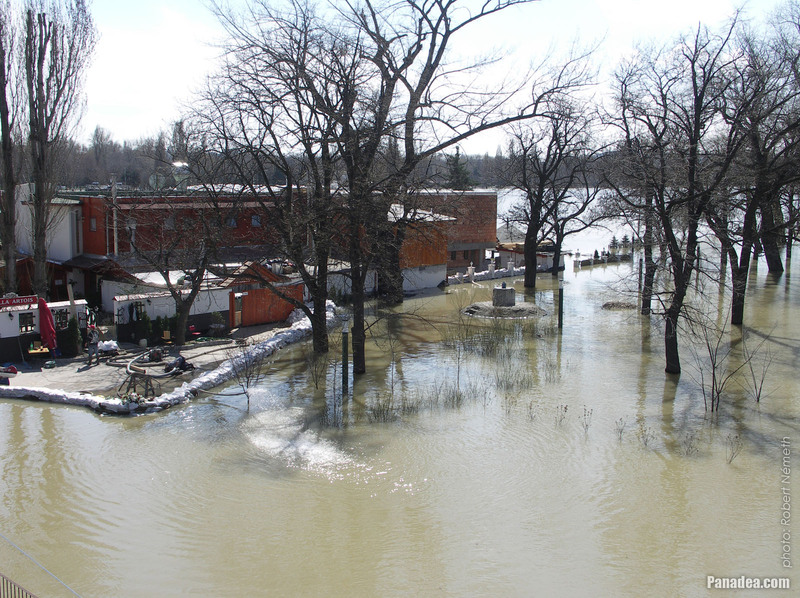 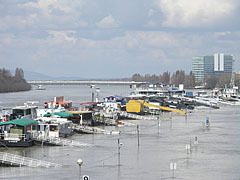 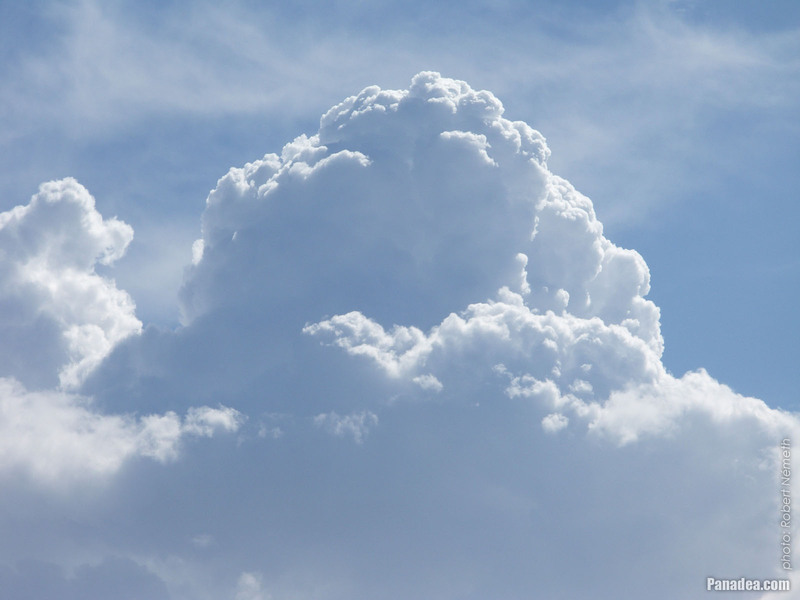 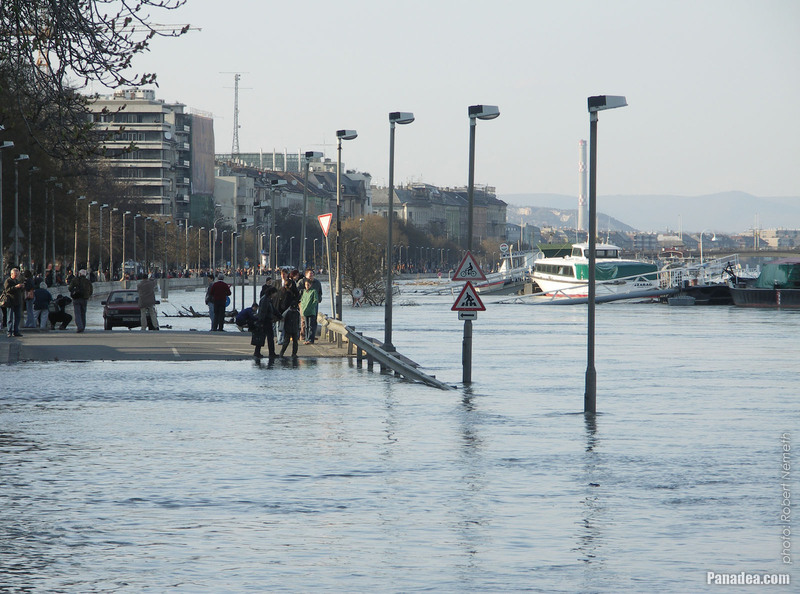 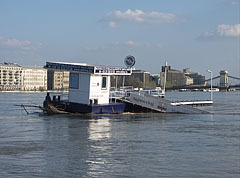 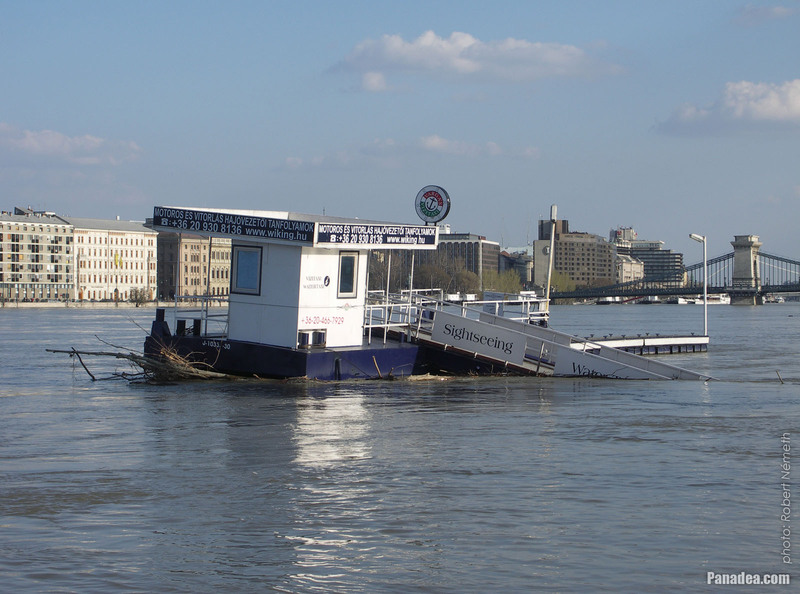 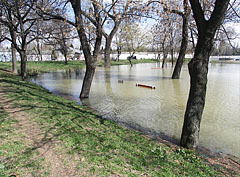 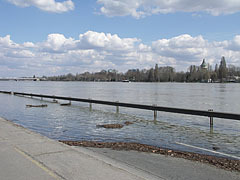 The boat will surely rest for a few days, because its berth cannot be accessed on foot (and the situation is the same with the other berths as well). 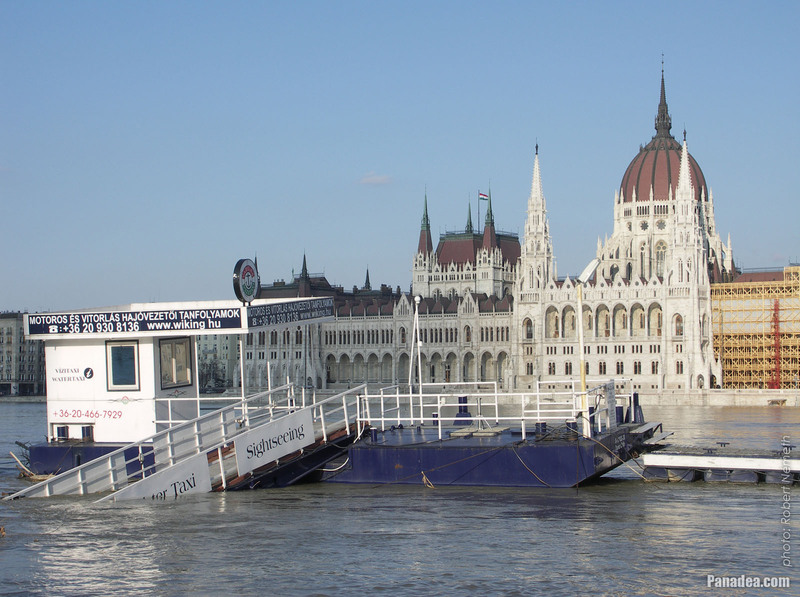 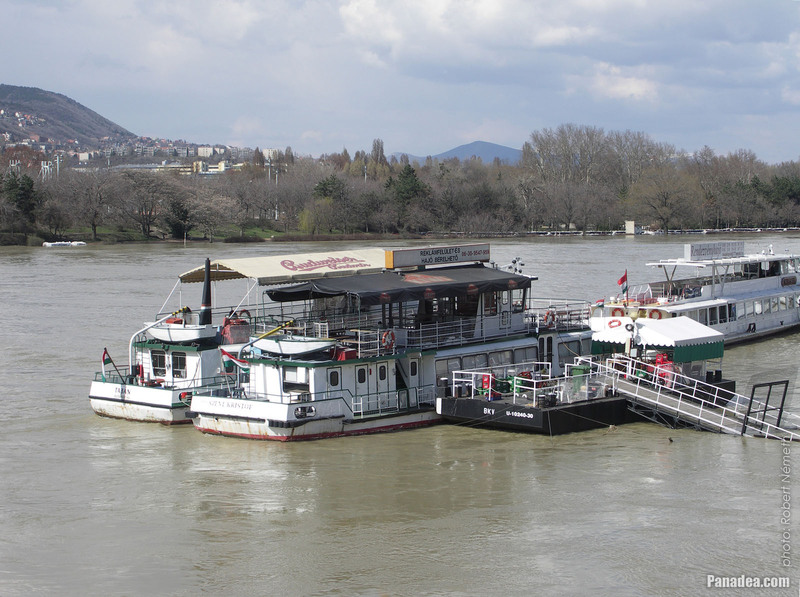 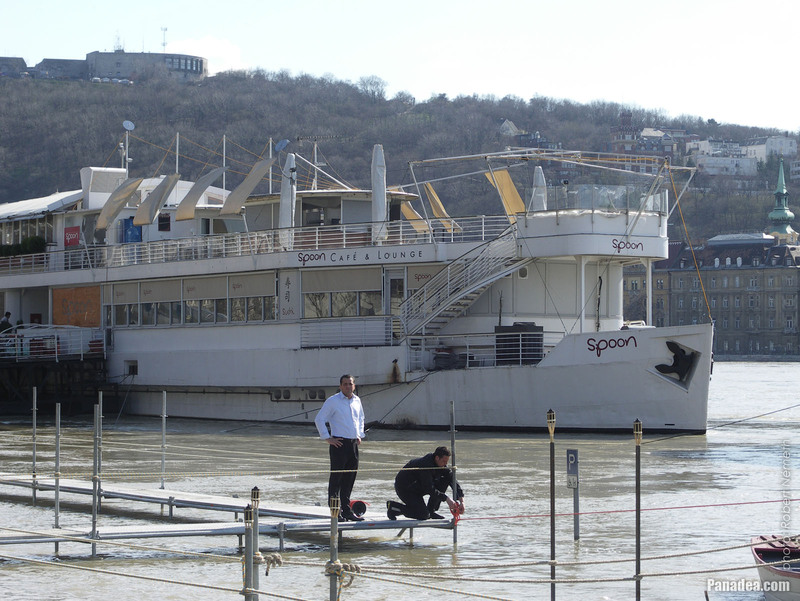 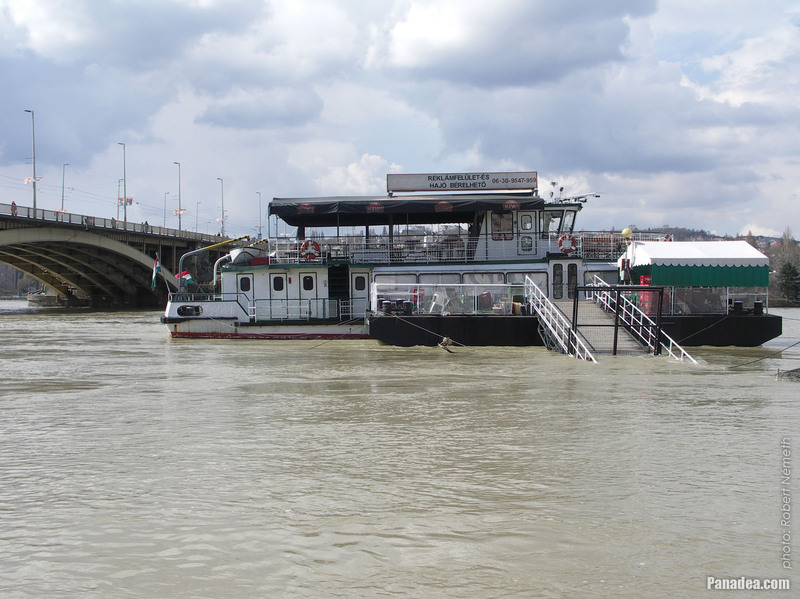 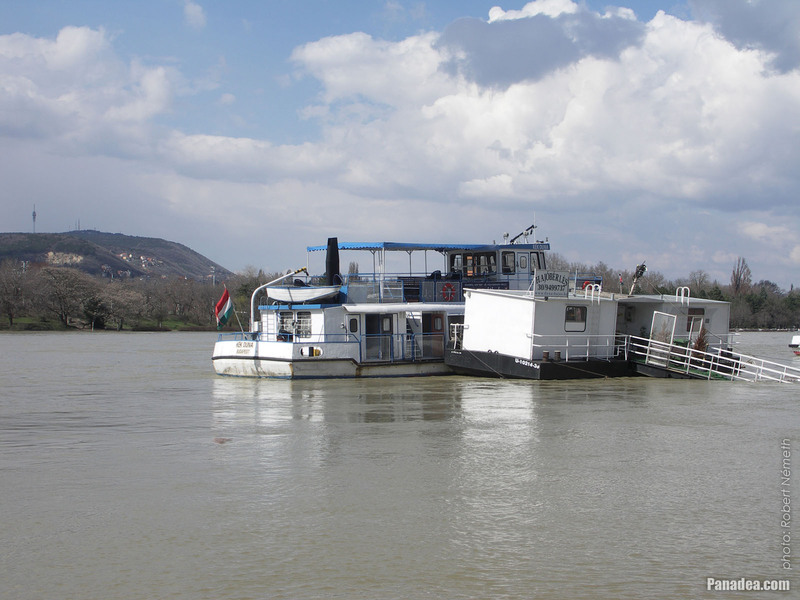 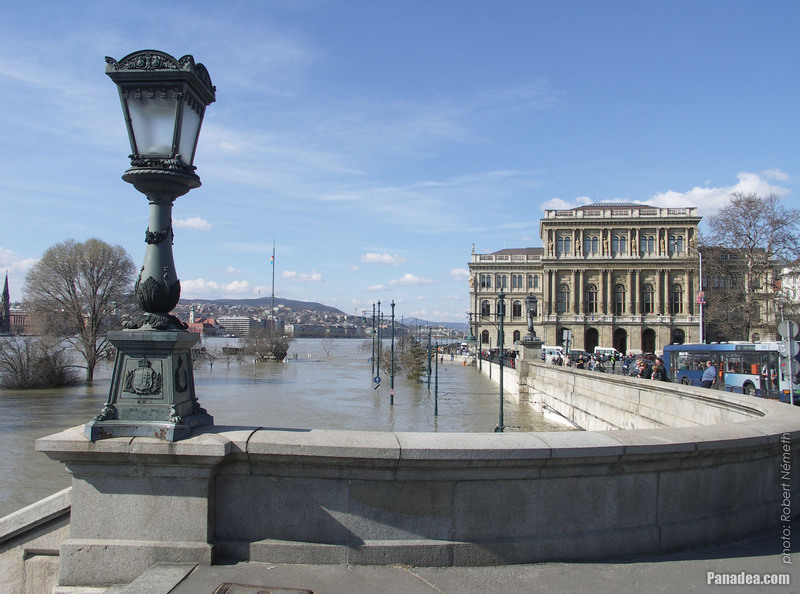 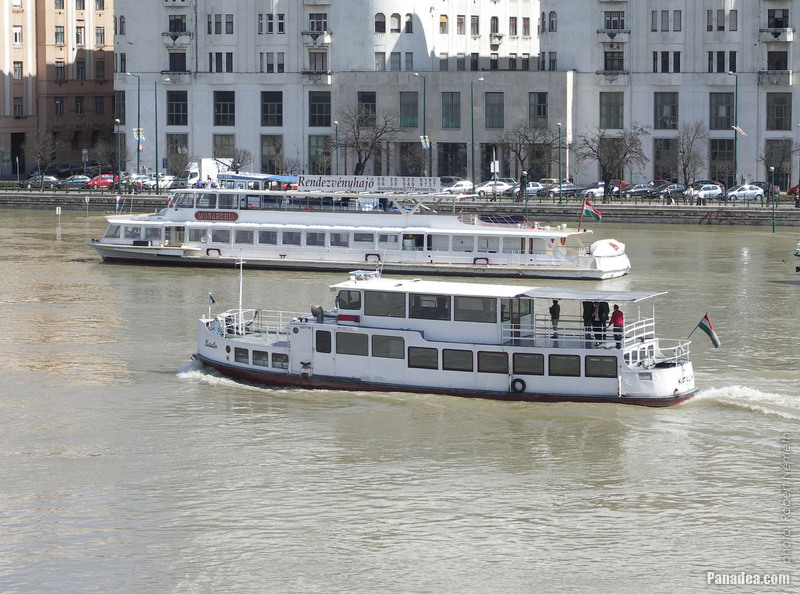 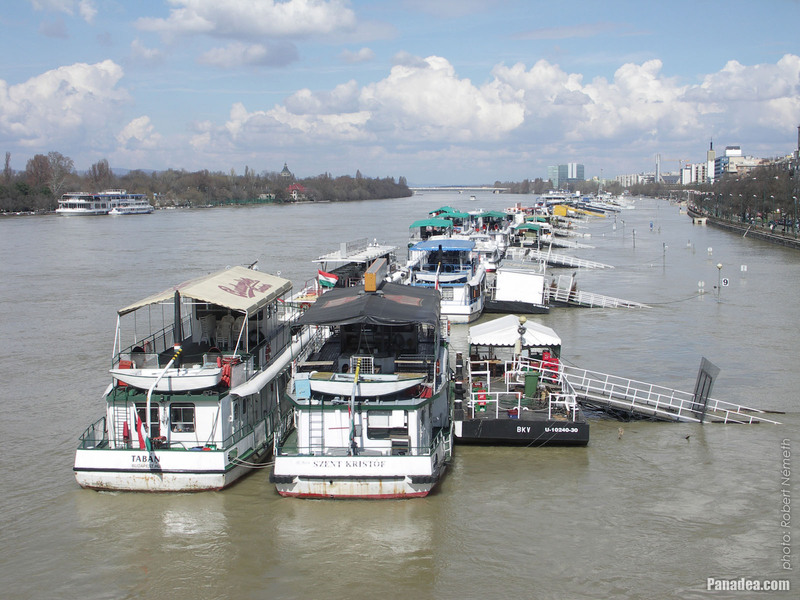 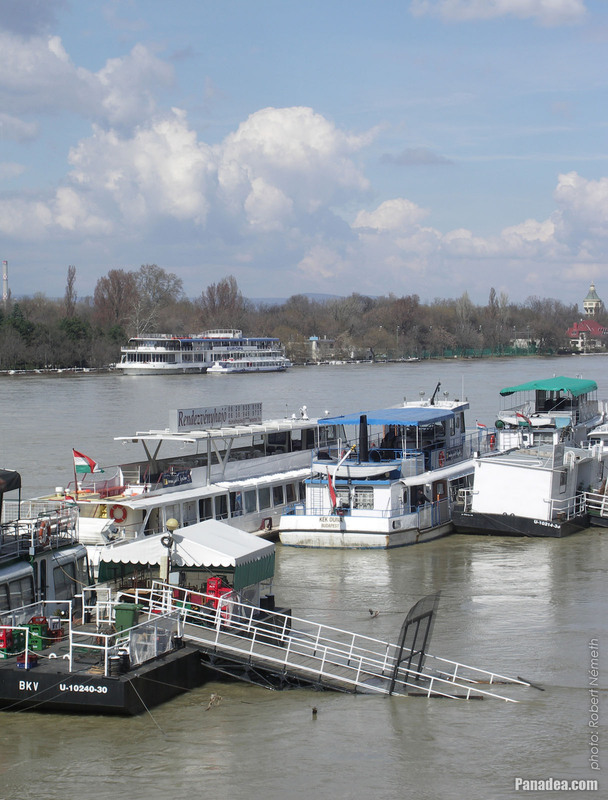 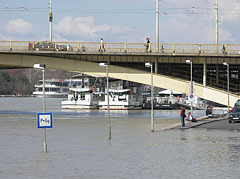 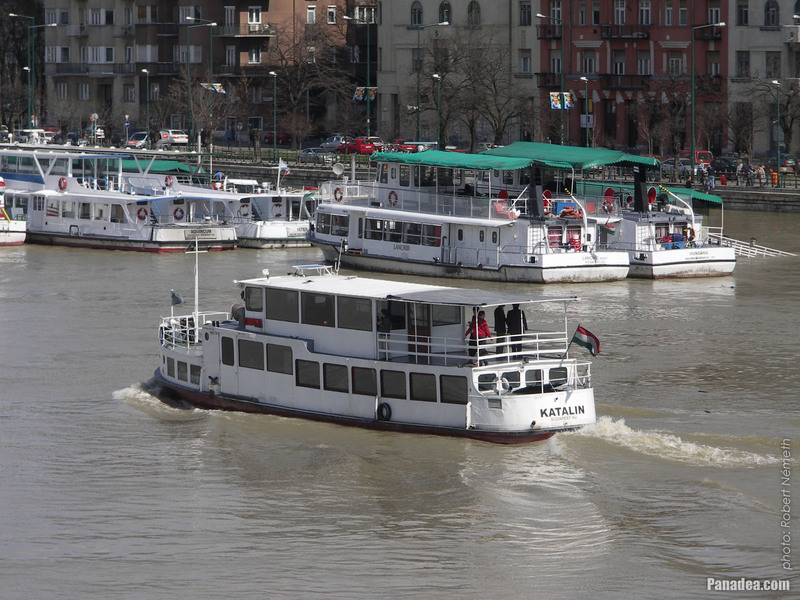 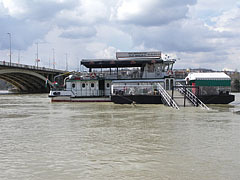 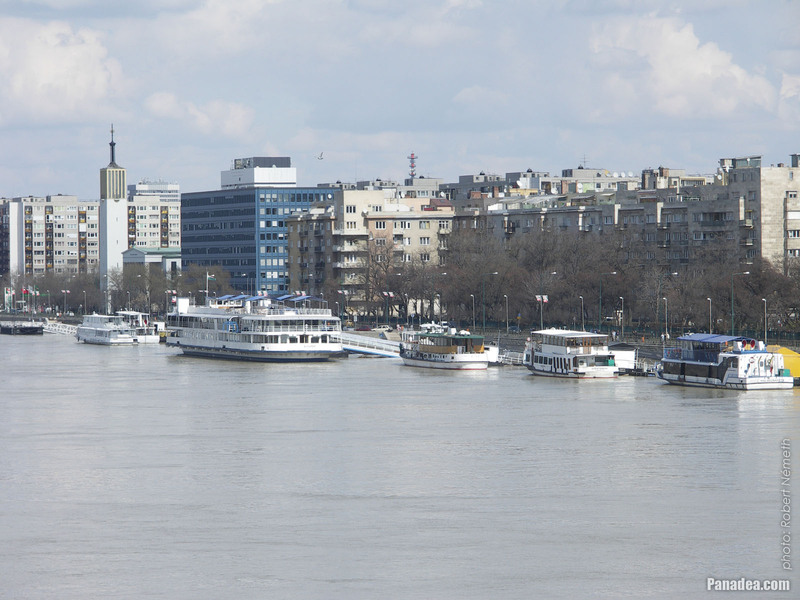 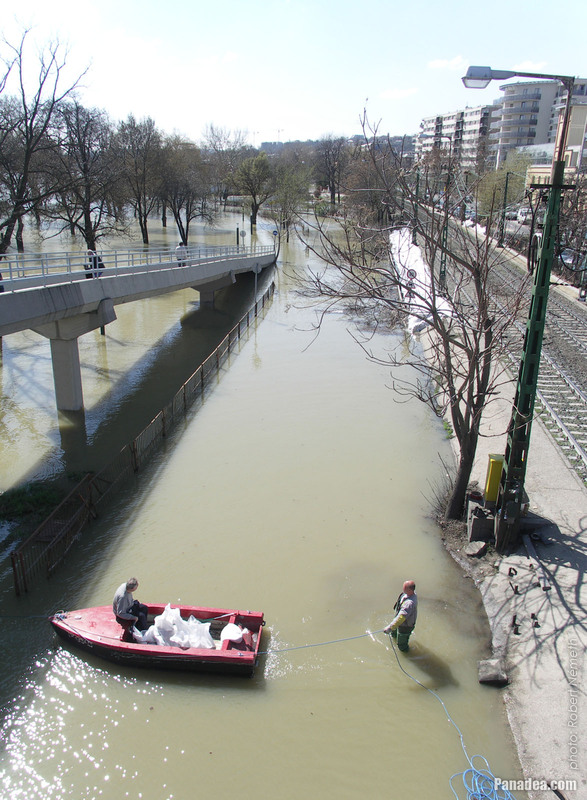 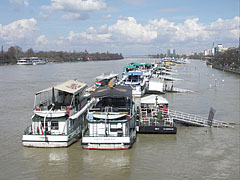 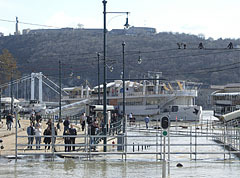 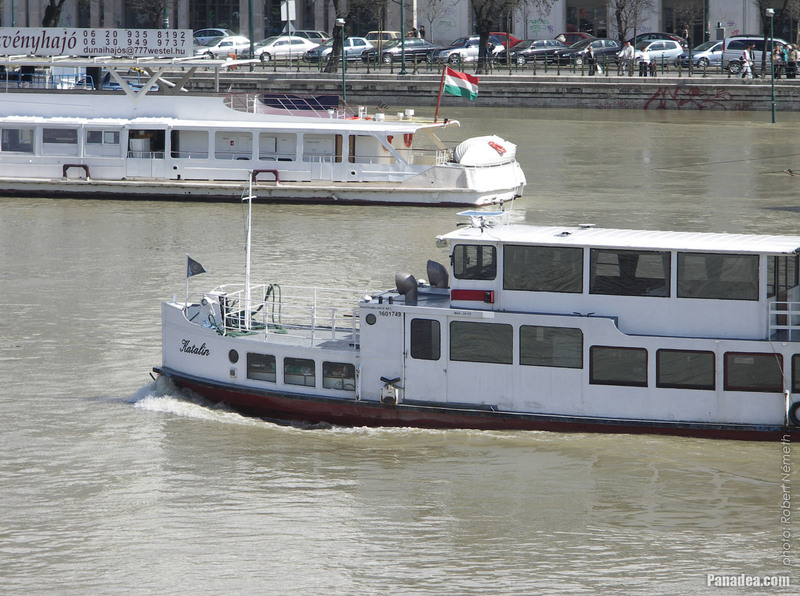 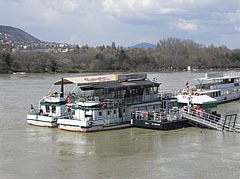 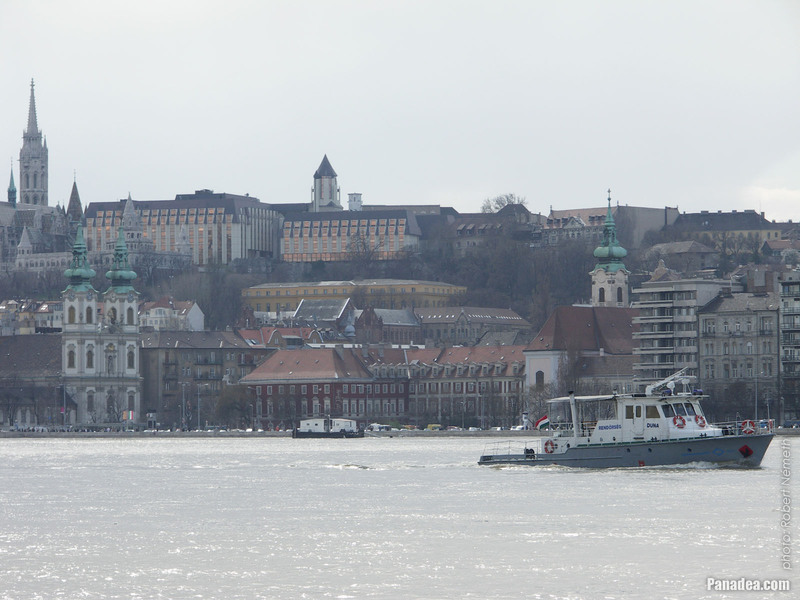 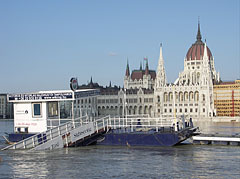 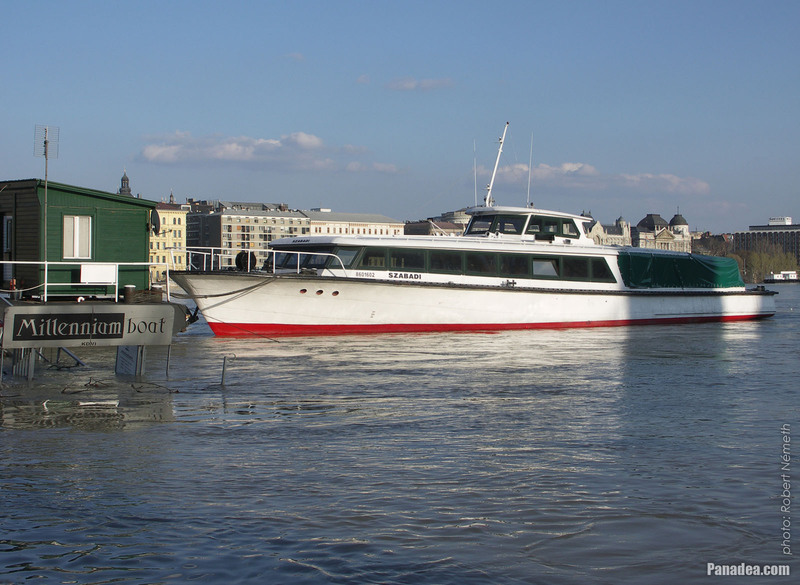 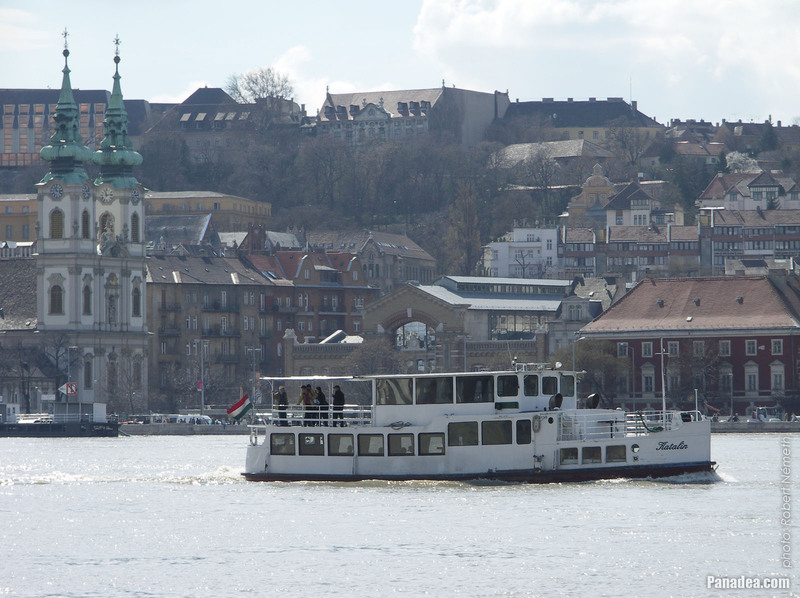 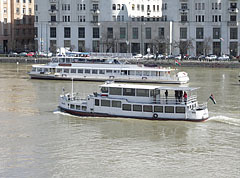 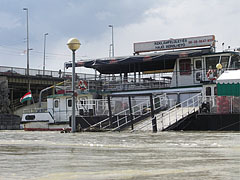 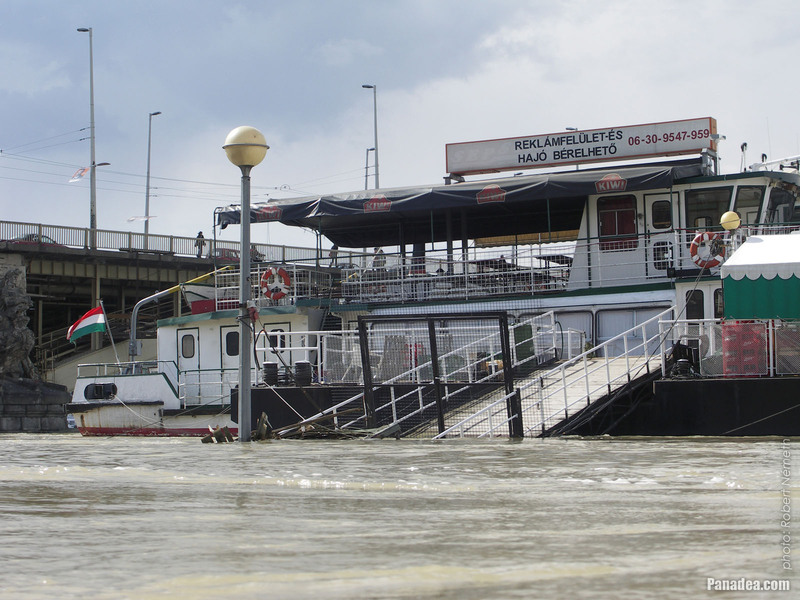 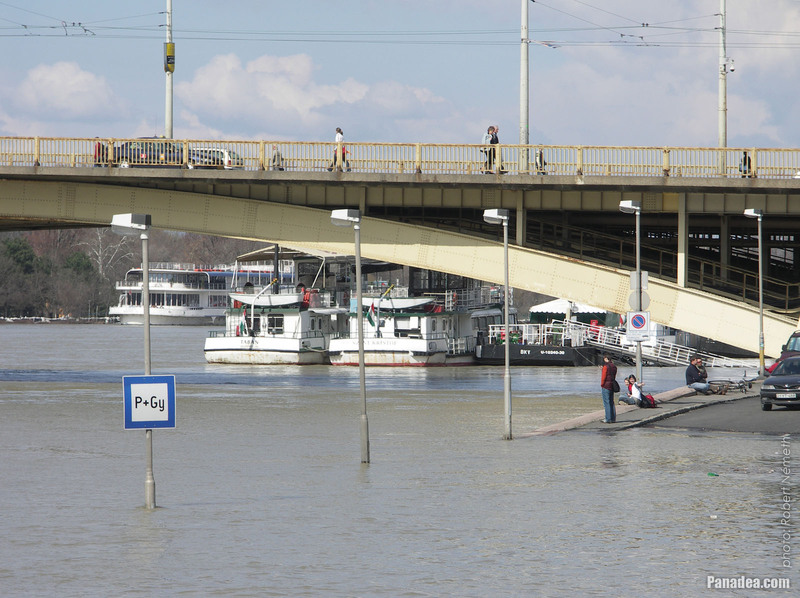 The small German powered boat was built in 1928, and it is operated on the Hungarian Danube only since 2003. 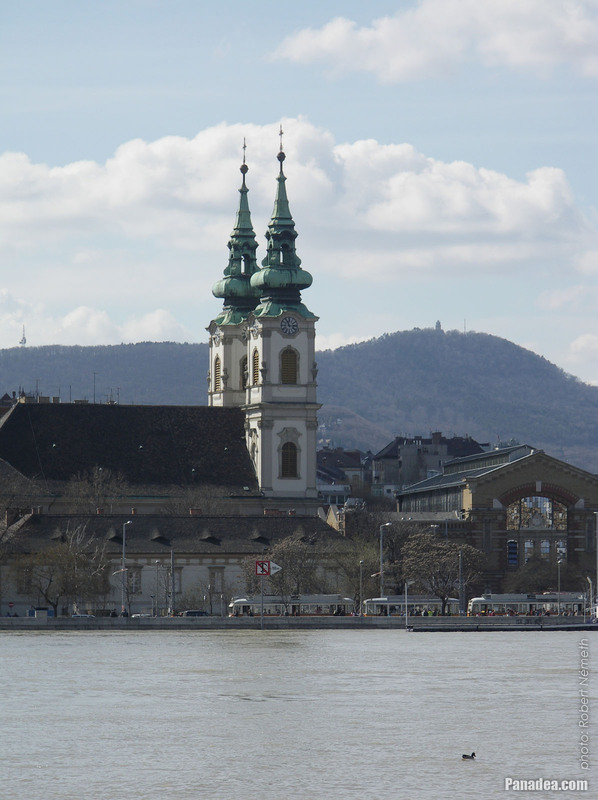 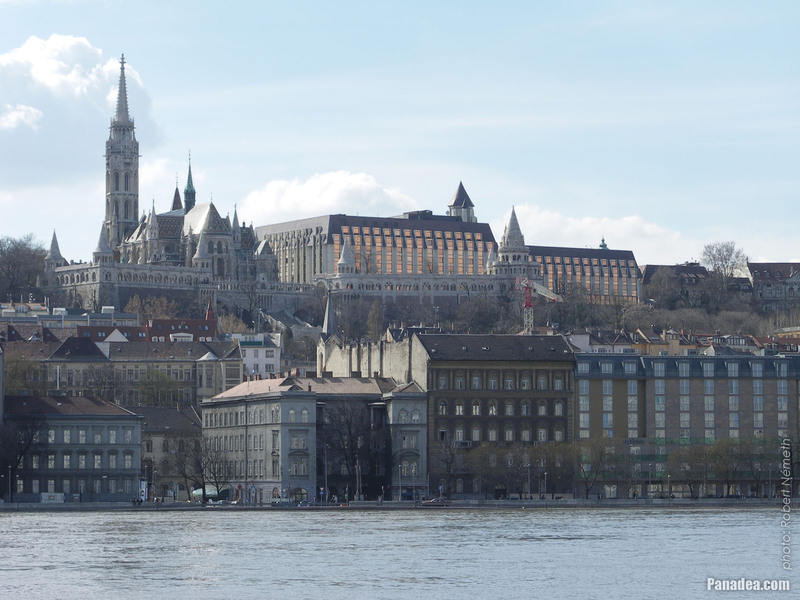 The twin-towered St. Anne's Church and the Wounds of St. Francis Church also can be seen on the photo. 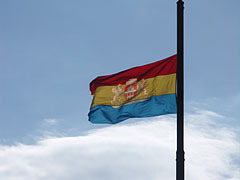 Of course its colors have nothing to do with Romania, which national colors are quite similar. 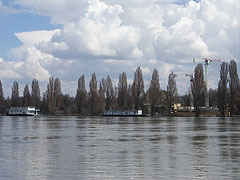 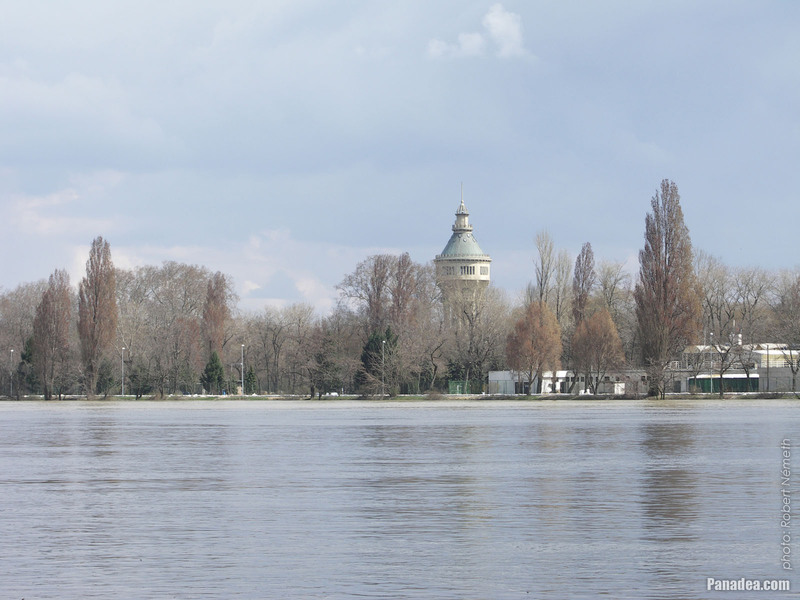 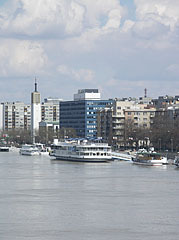 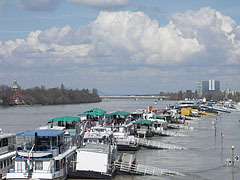 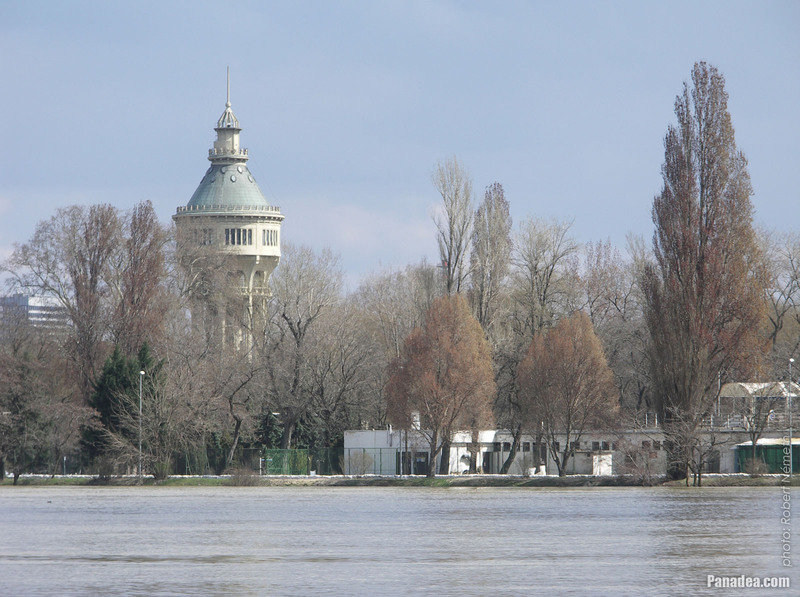 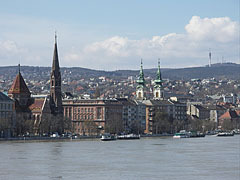 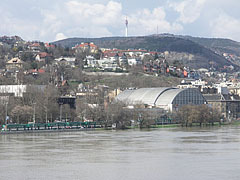 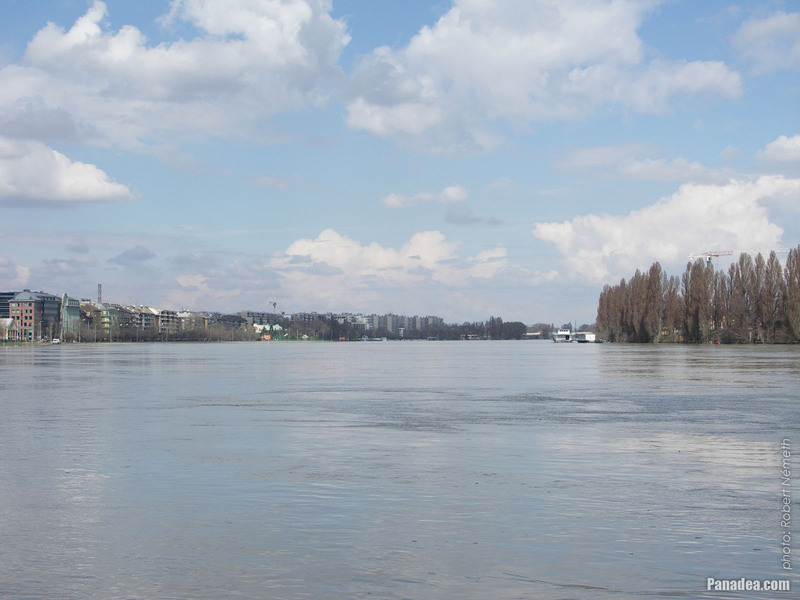 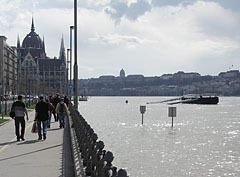 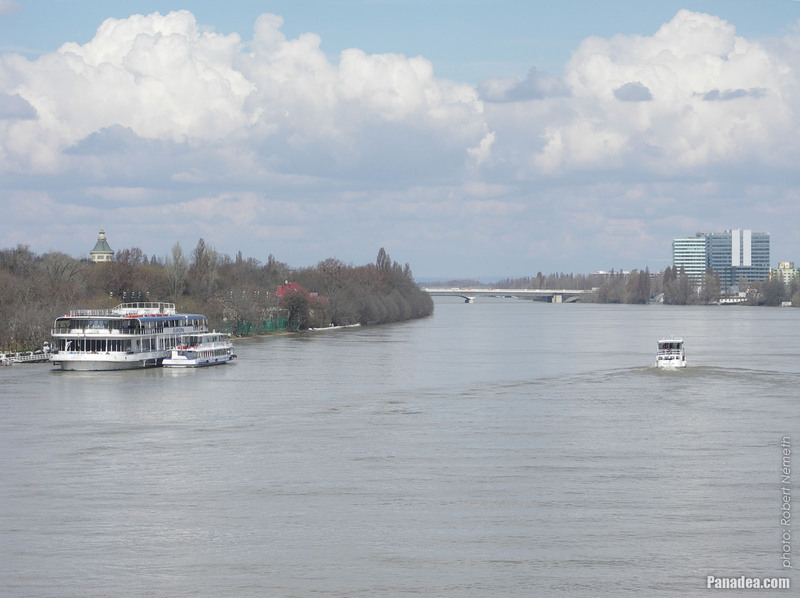 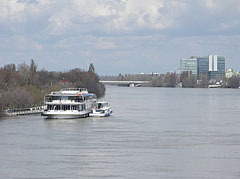 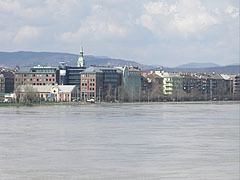 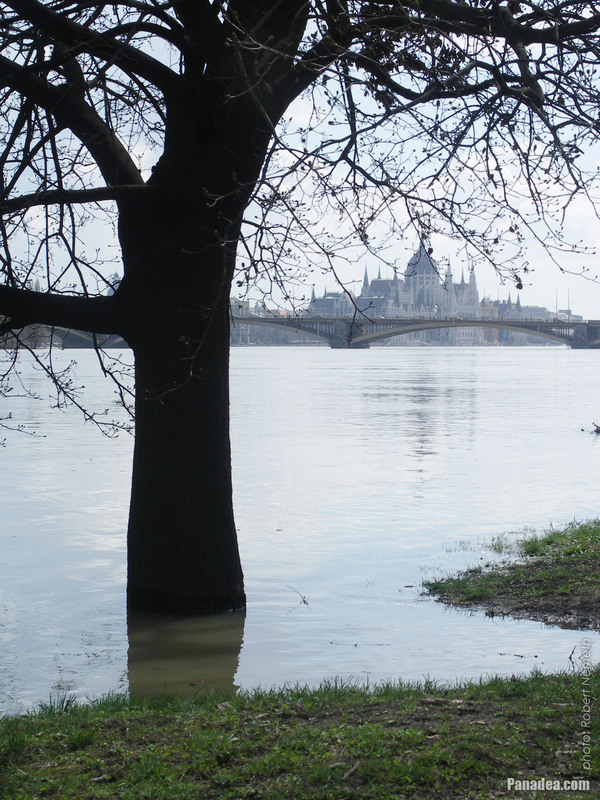 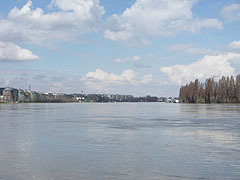 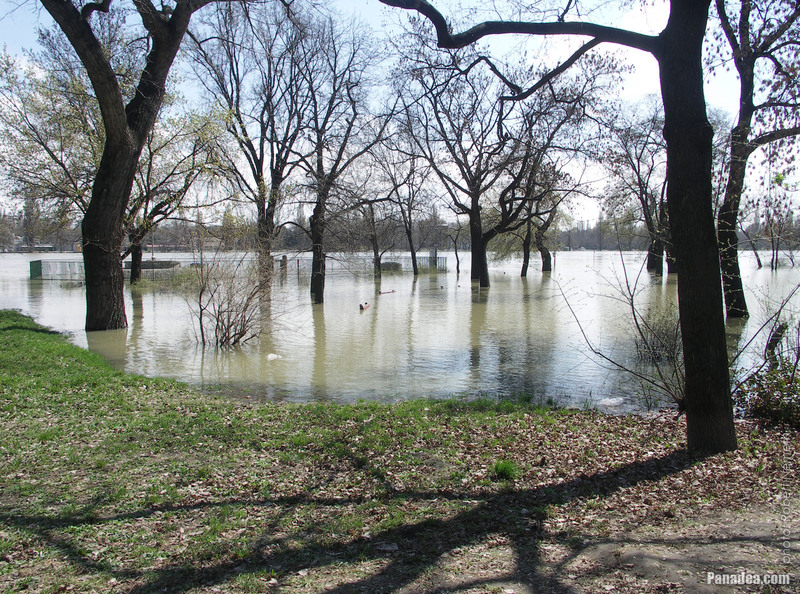 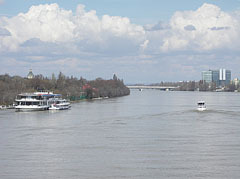 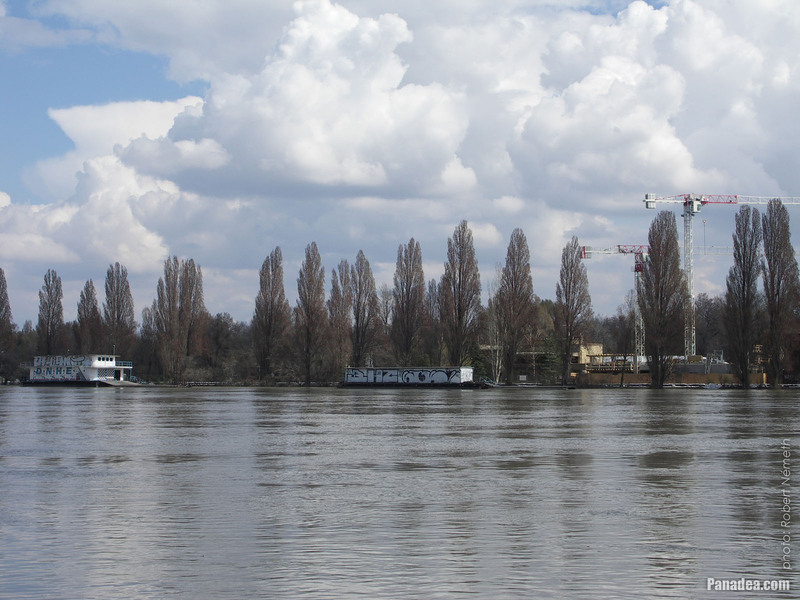 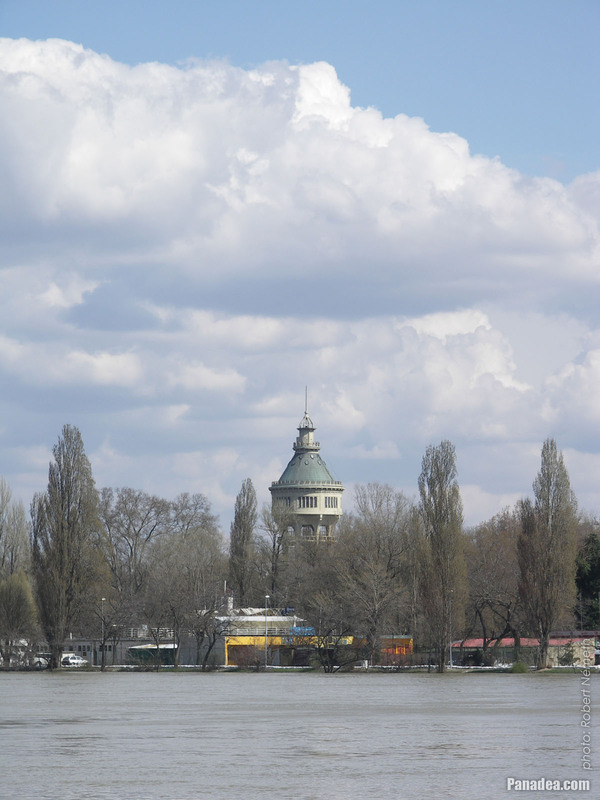 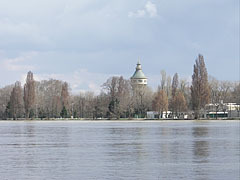 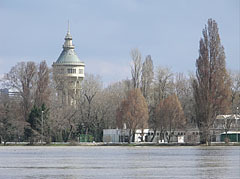 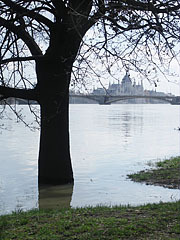 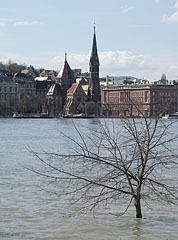 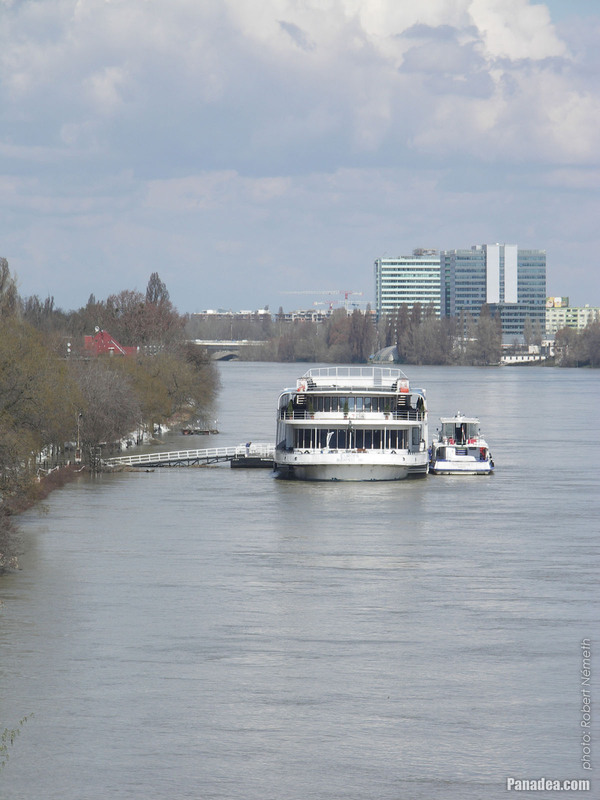 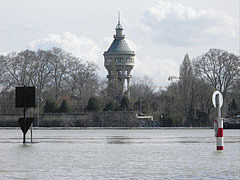 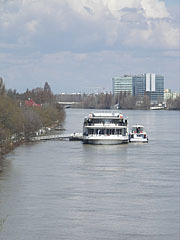 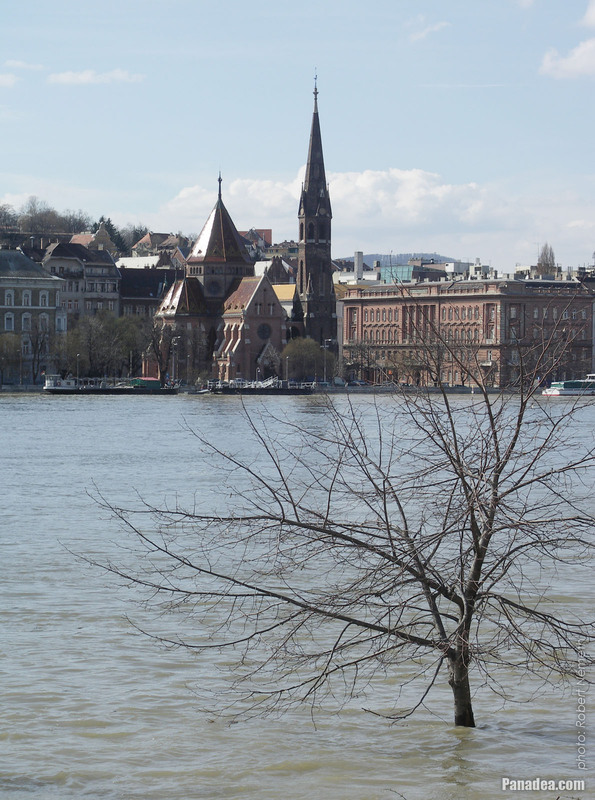 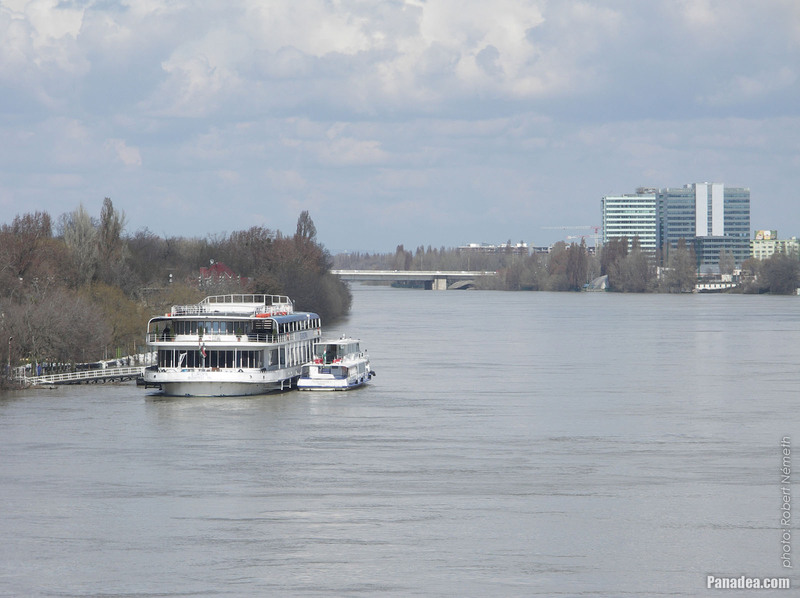 On the other side of the Danube the Water Tower can be seen on the Margaret Island. 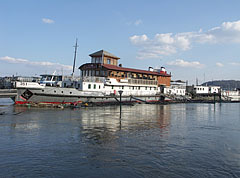 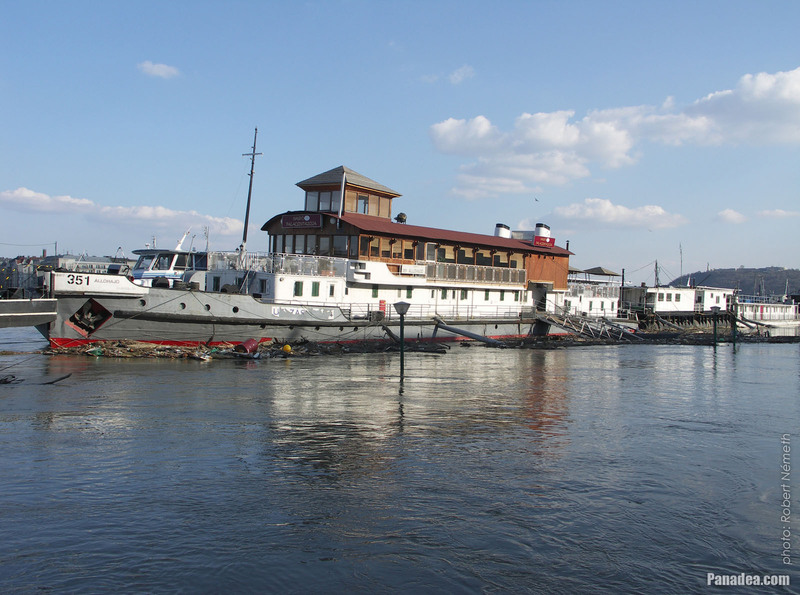 Initially it was a powered tugboat named as "Komárom", constructed in Komárom, Hungary in 1944. 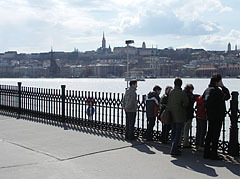 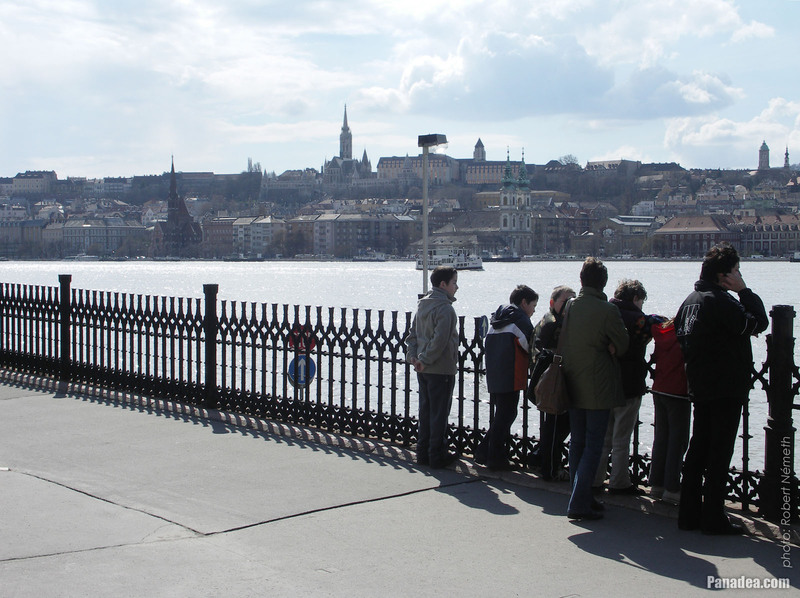 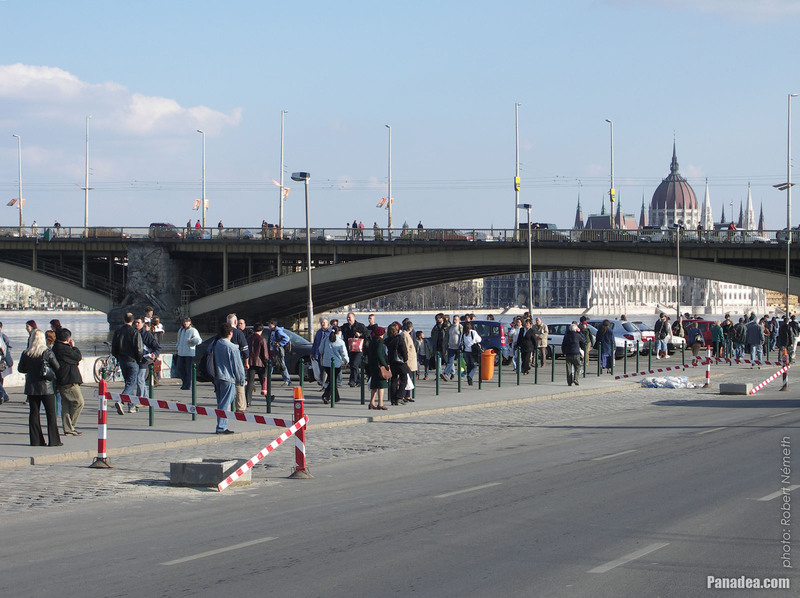 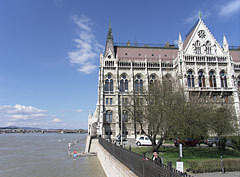 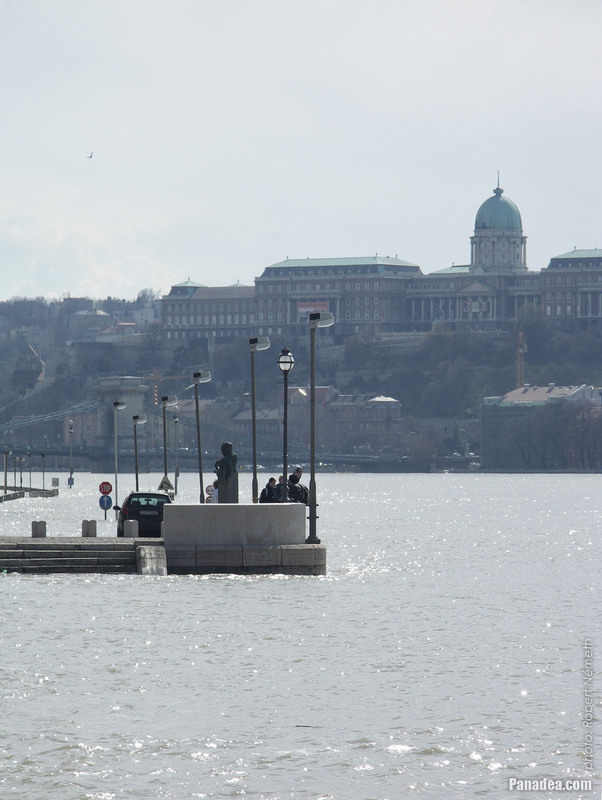 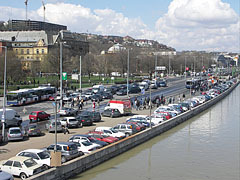 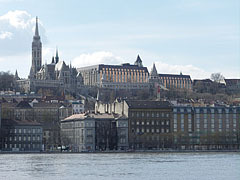 Next to the Parliament Building on the left the Ethnographic Museum (the former Palace of Justice on the Kossuth Square) can be seen. 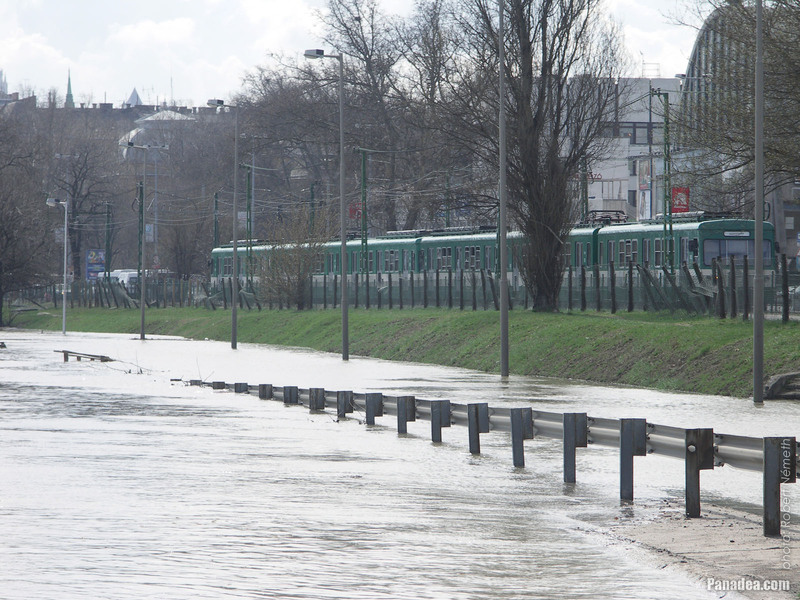 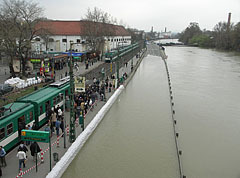 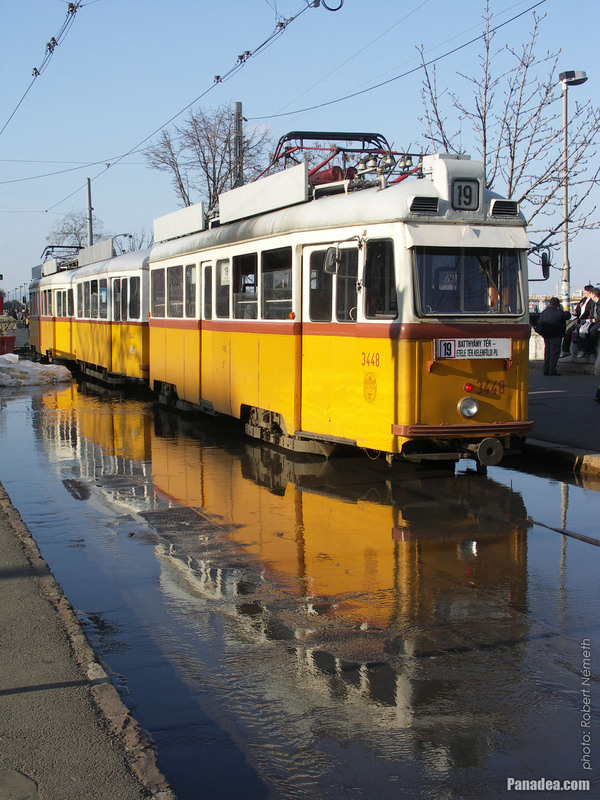 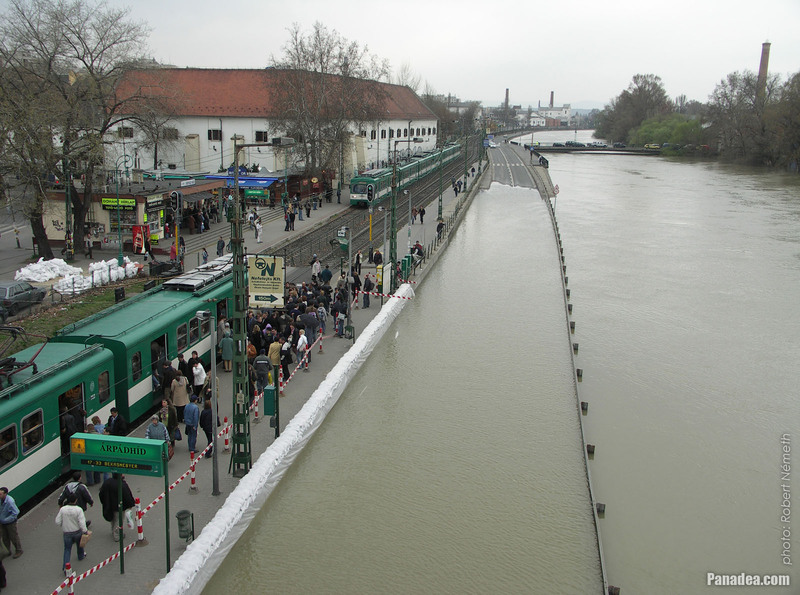 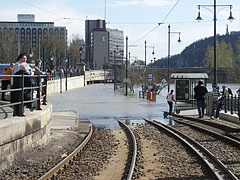 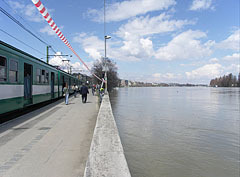 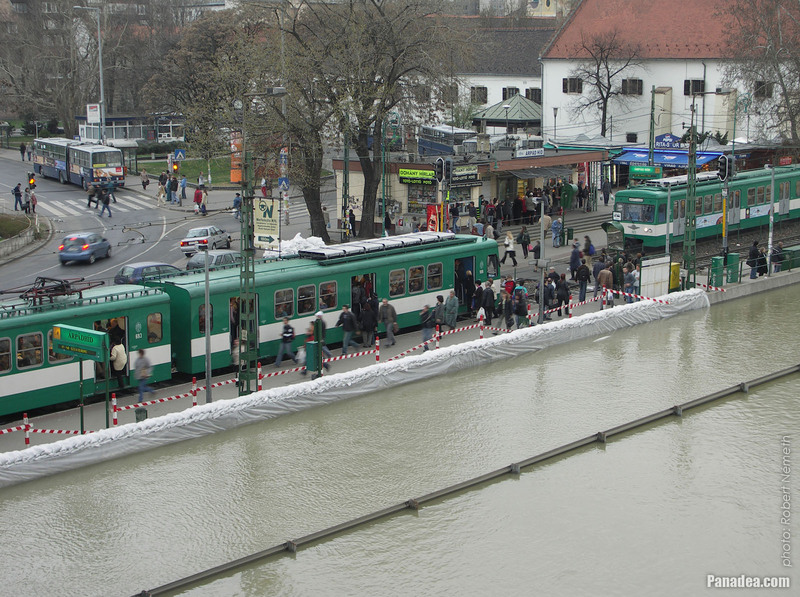 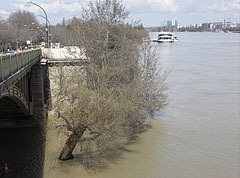 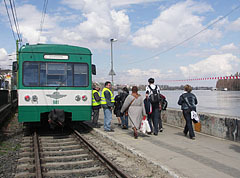 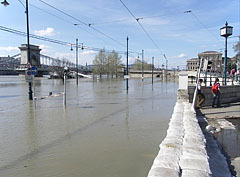 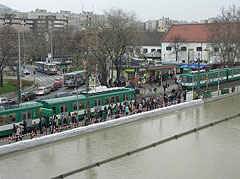 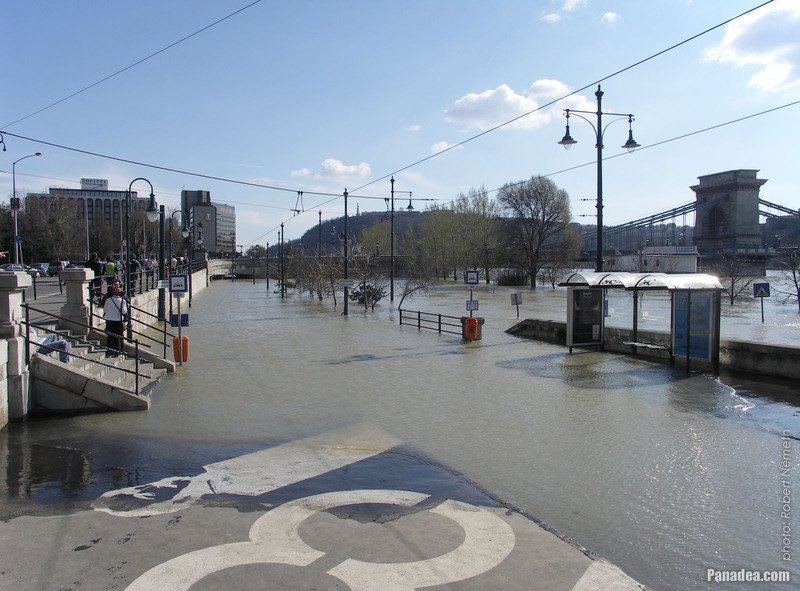 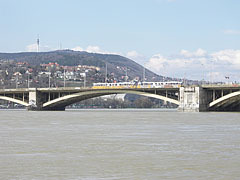 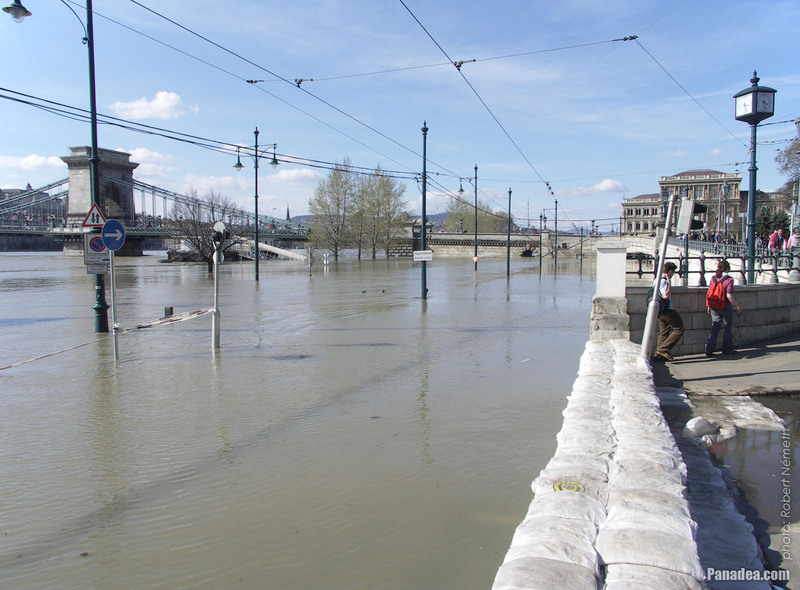 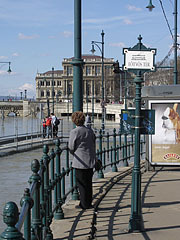 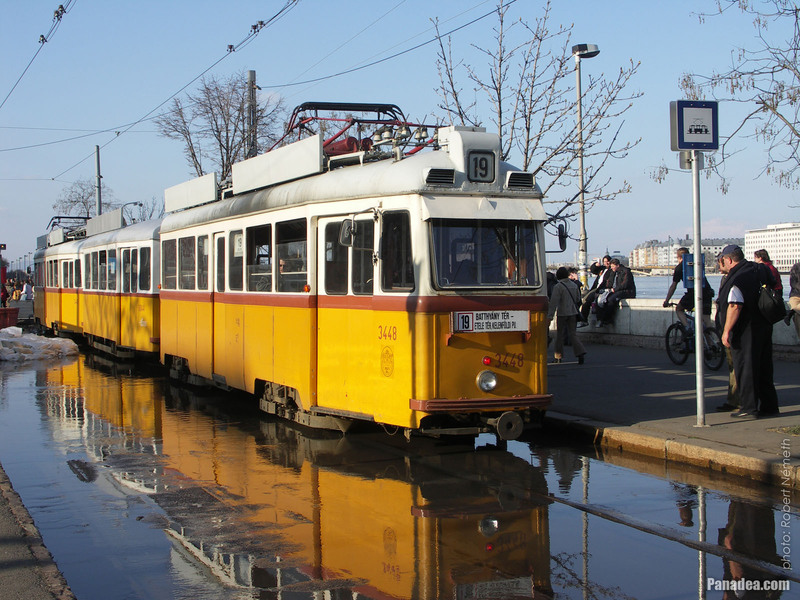 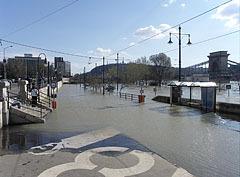 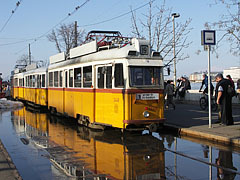 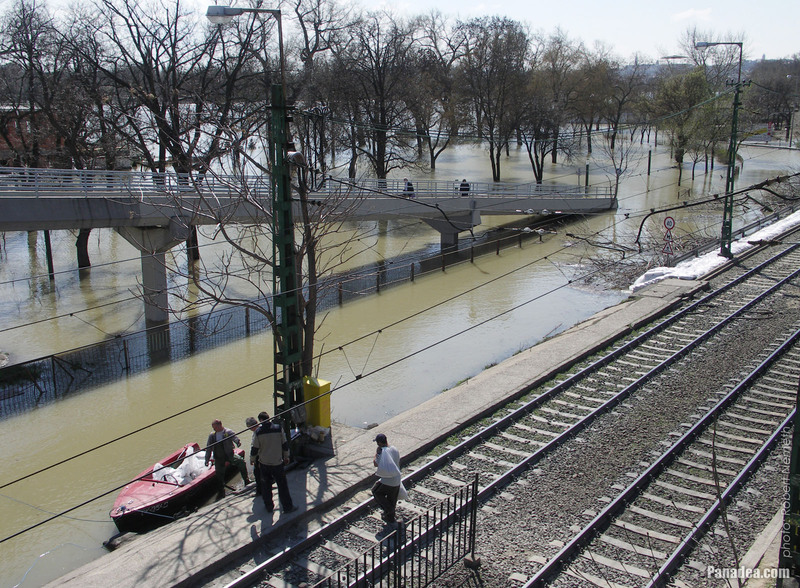 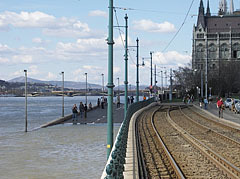 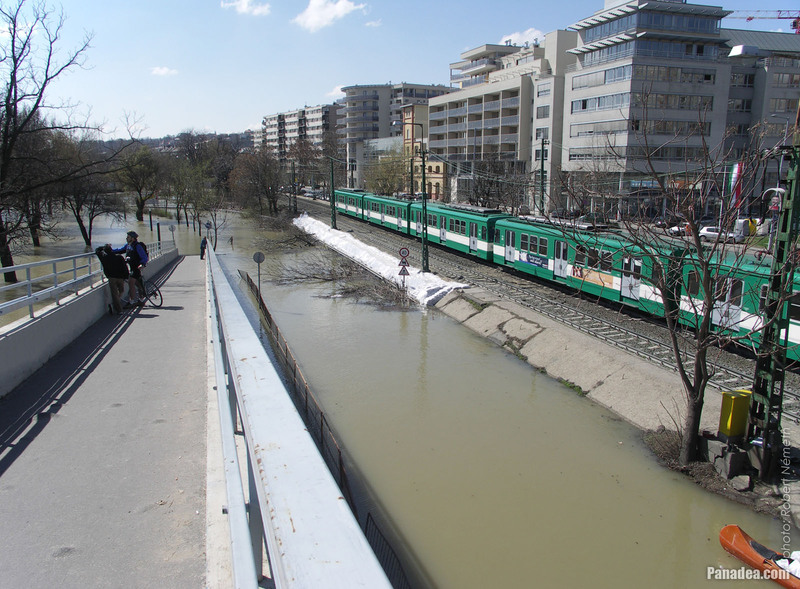 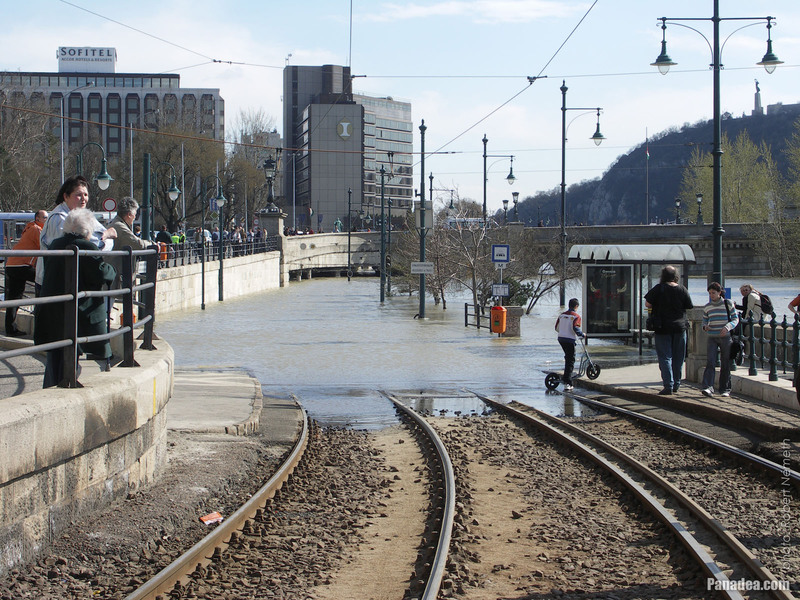 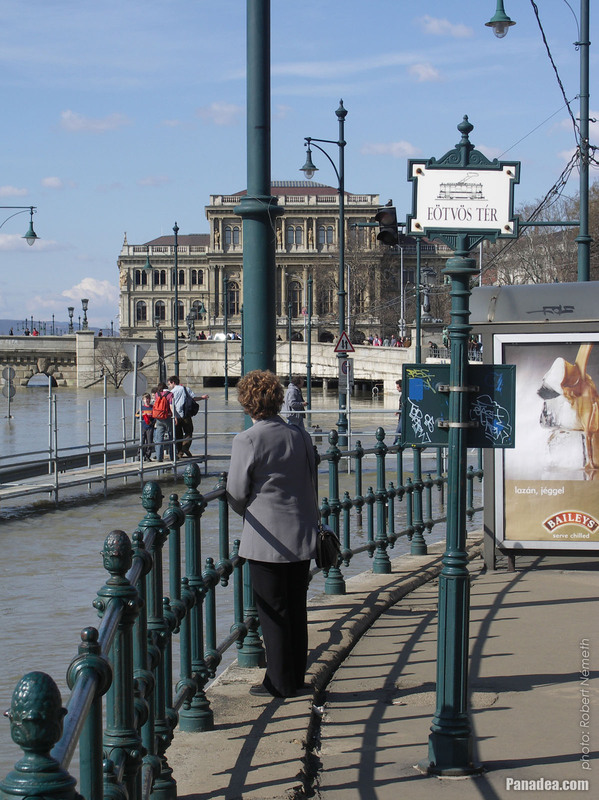 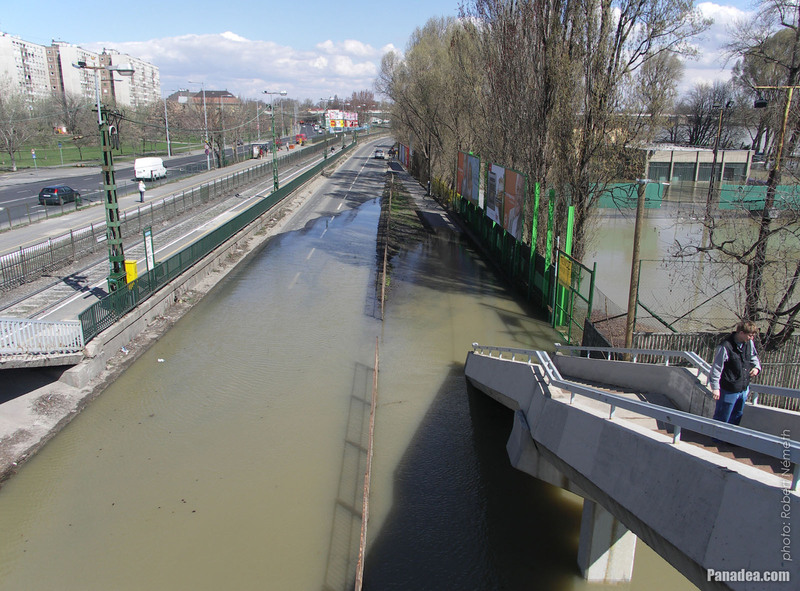 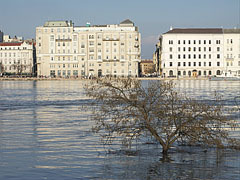 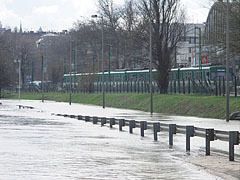 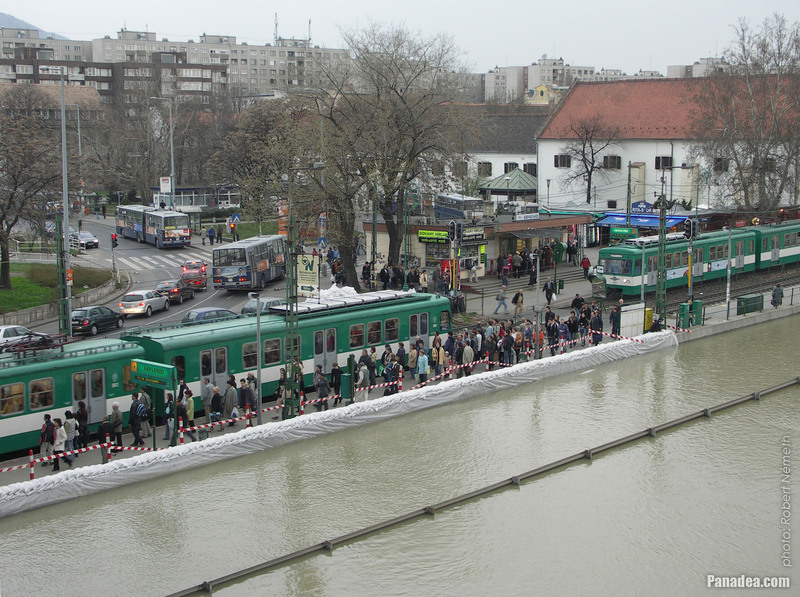 The photo represents an old yellow Ganz UV tram in the station with its mirror image on the water. 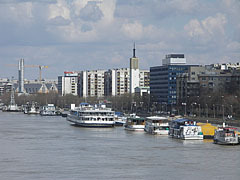 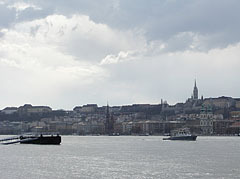 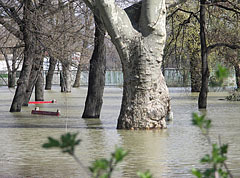 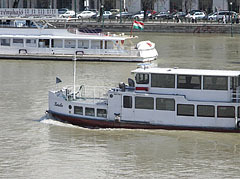 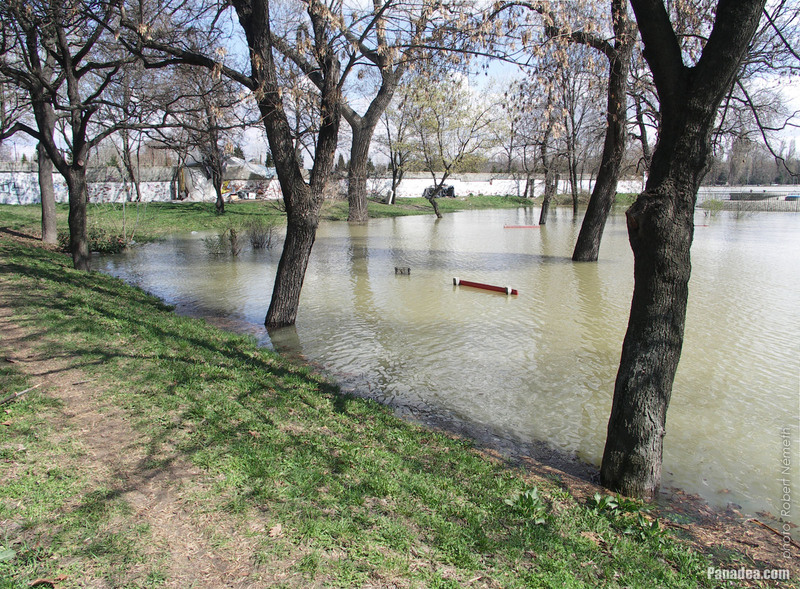 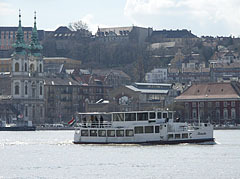 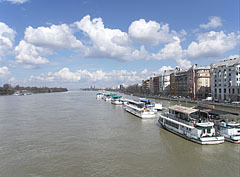 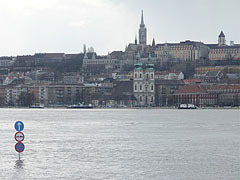 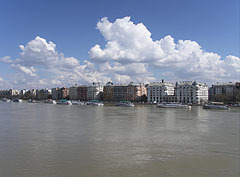 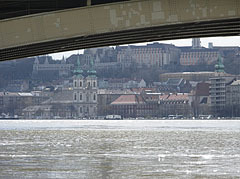 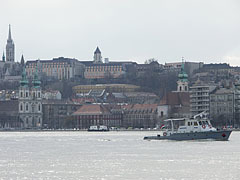 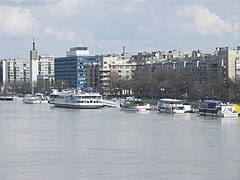 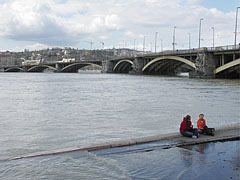 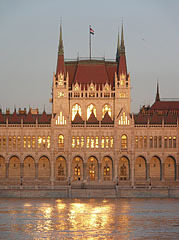 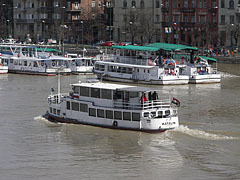 The small boat was manufactured in Vác, Hungary in 1964. 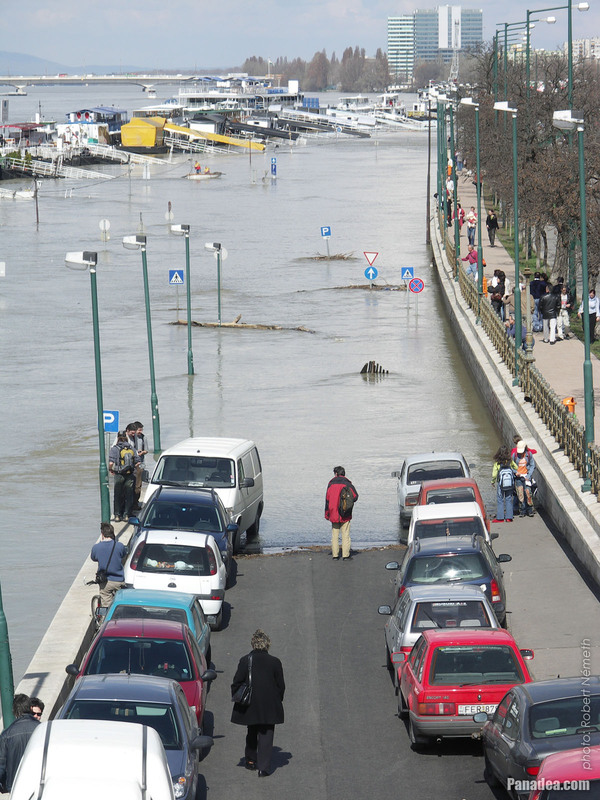 In normal case it could be almost impossible shoot this photo from here, due to the high car traffic. 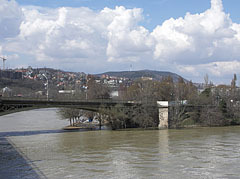 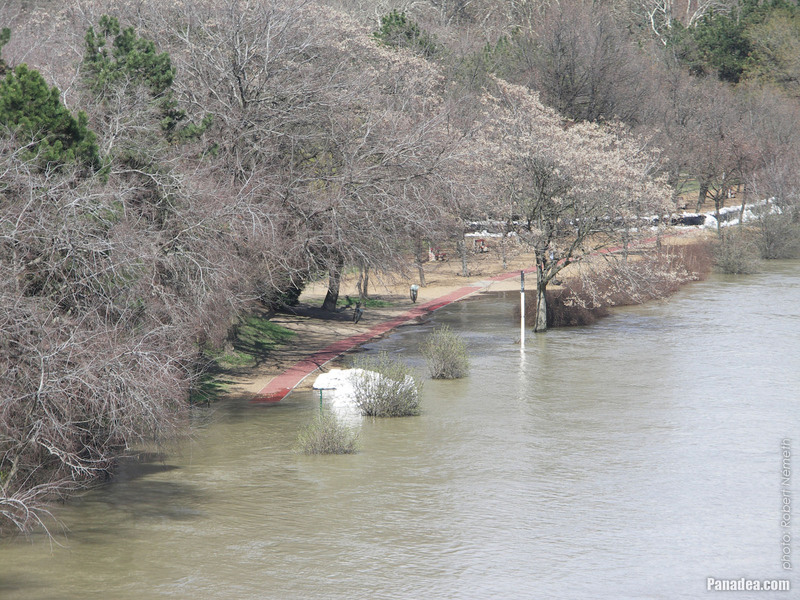 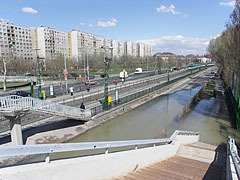 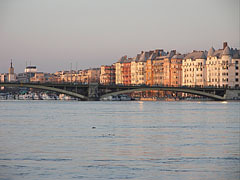 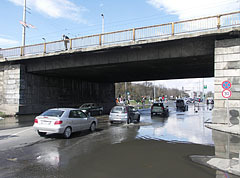 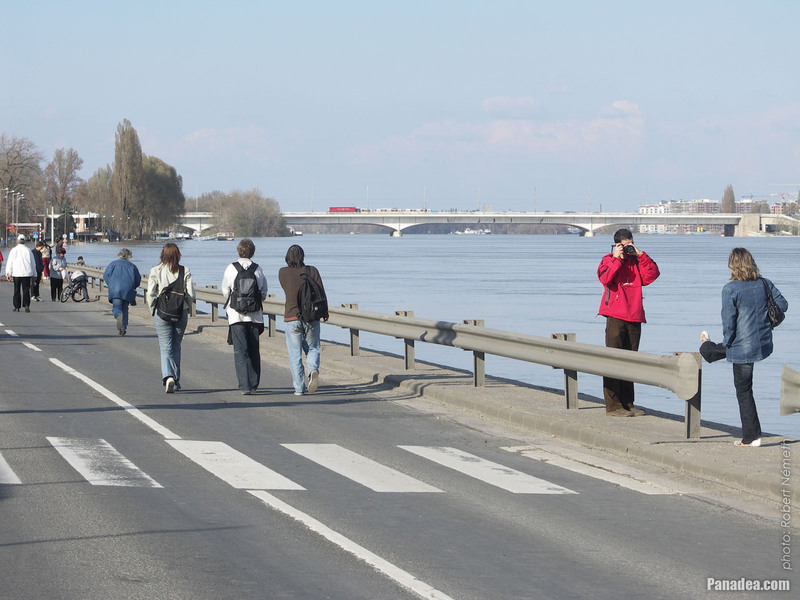 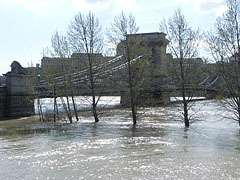 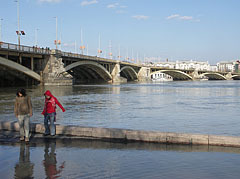 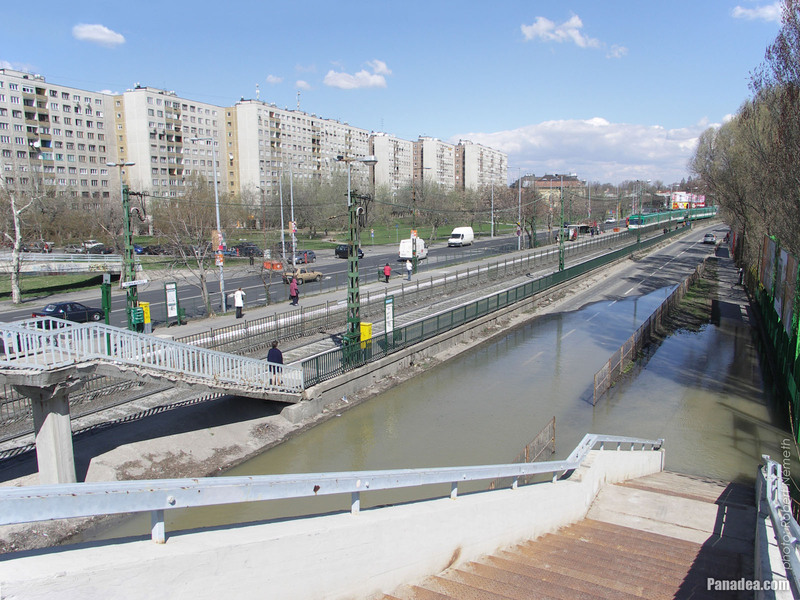 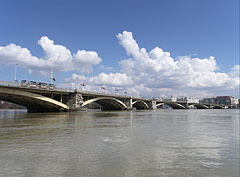 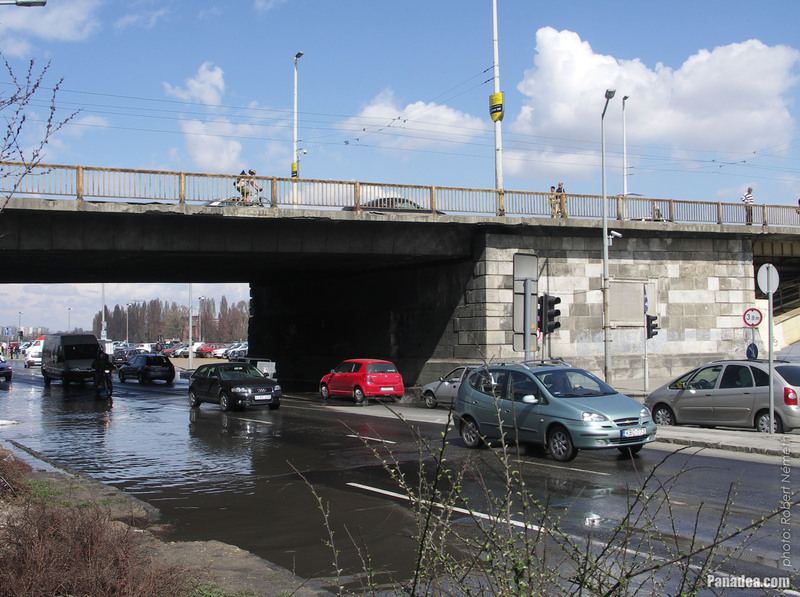 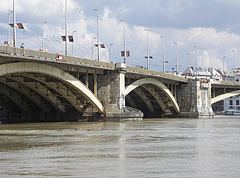 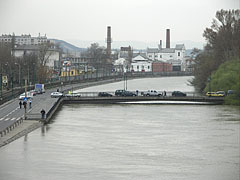 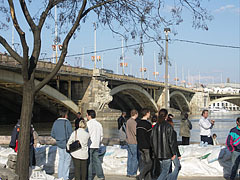 The current small ferro-concrete bridge was constructed in 1968. 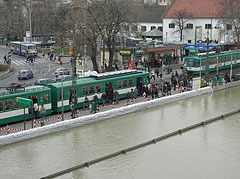 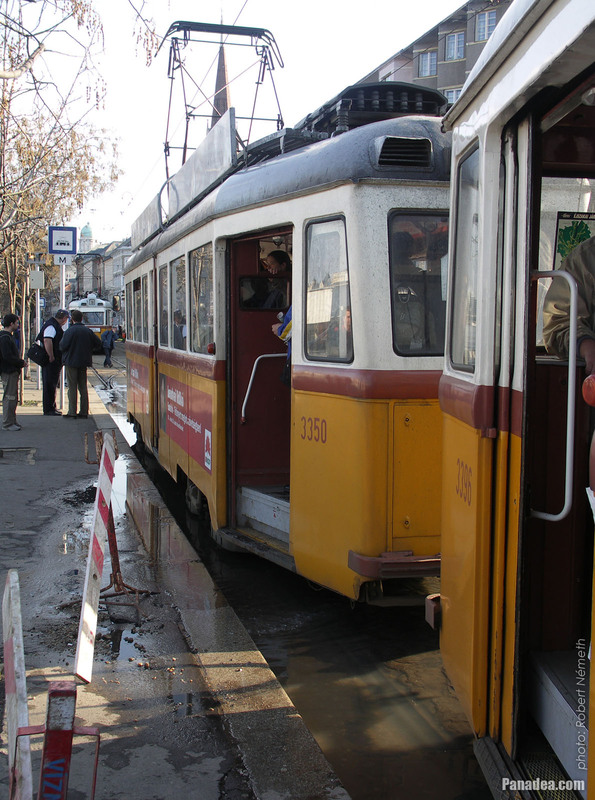 The Hungarian made Ganz UV trams were manufactured from 1956, its characteristic look and the "clinking" voice were long belonged to the image and mood of the Budapest streets. 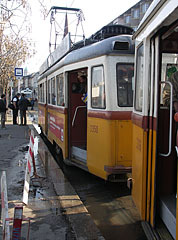 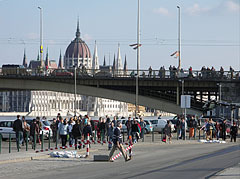 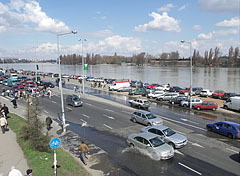 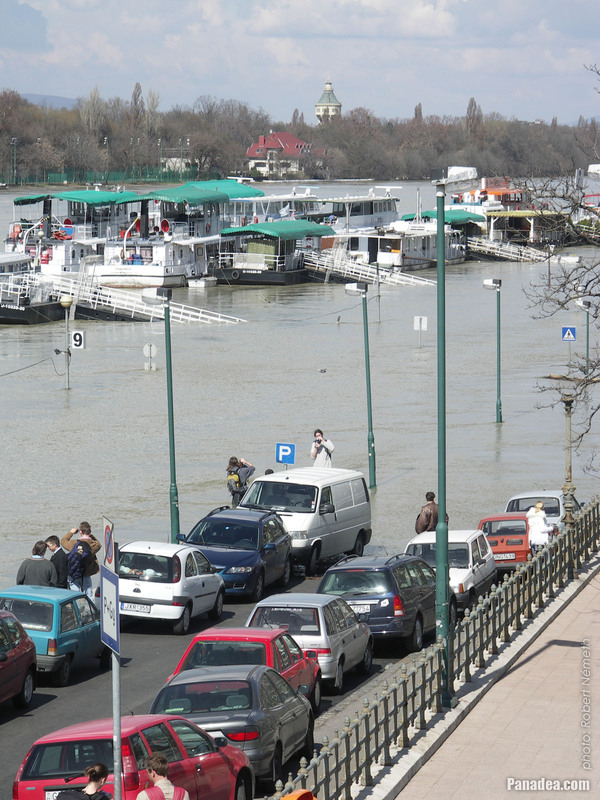 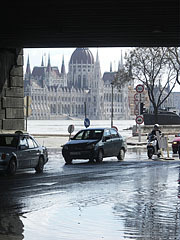 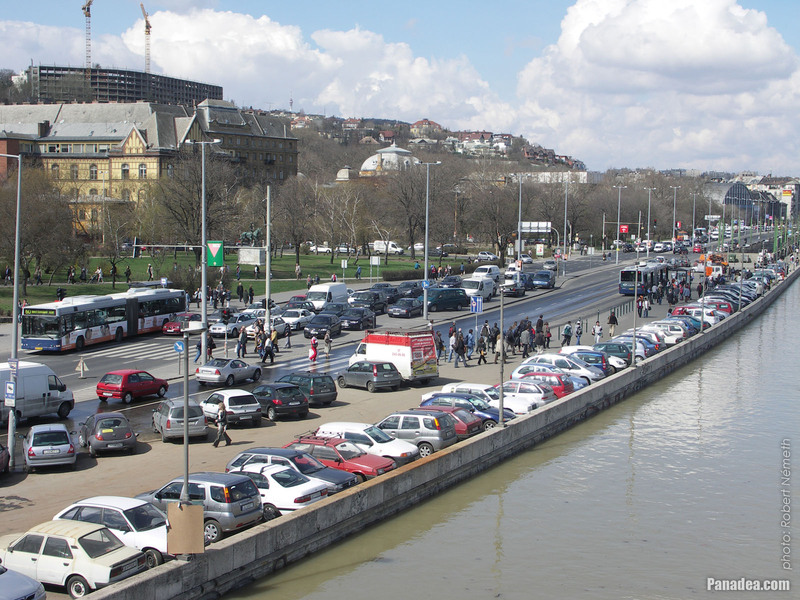 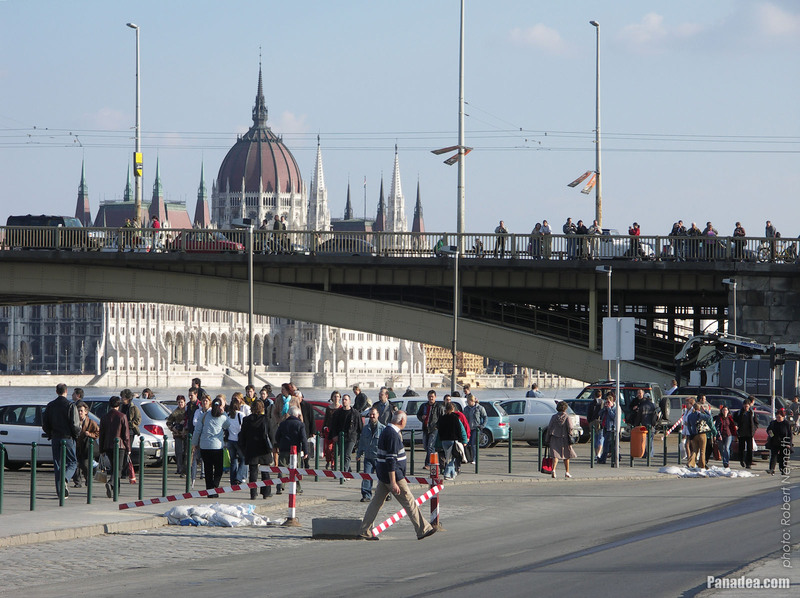 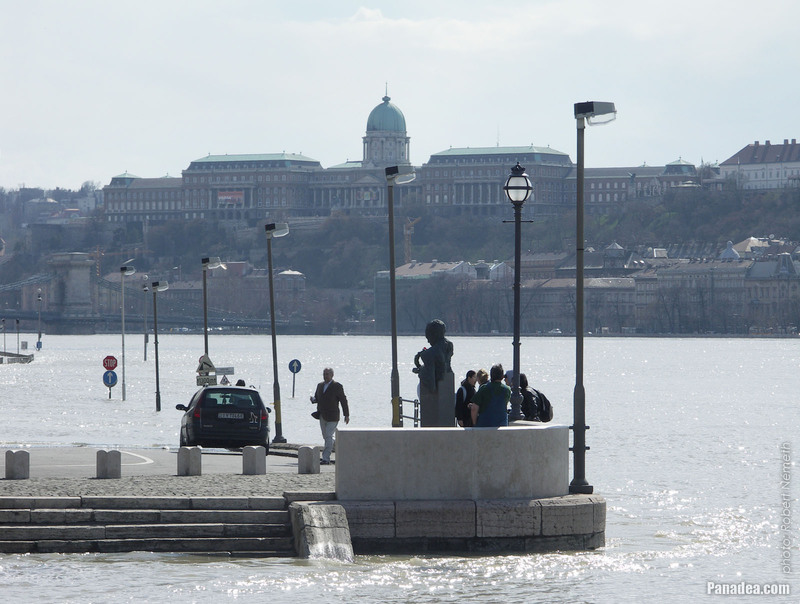 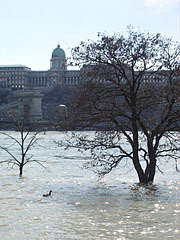 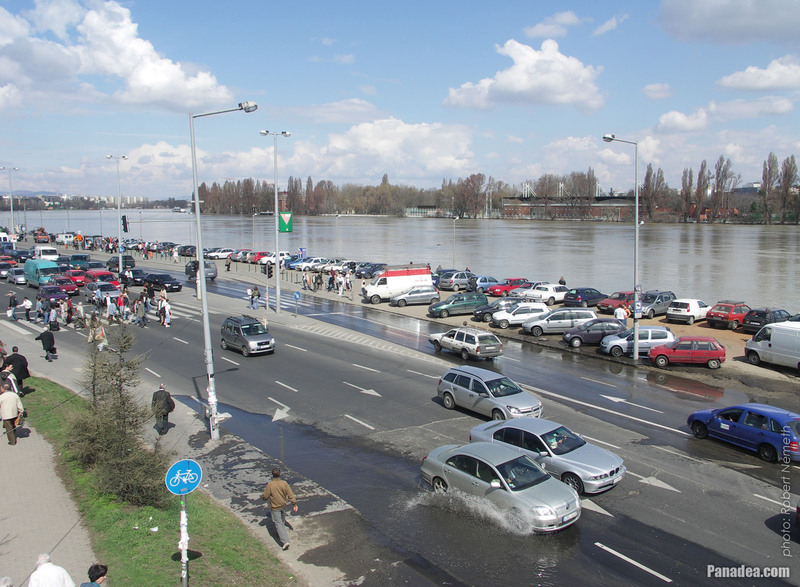 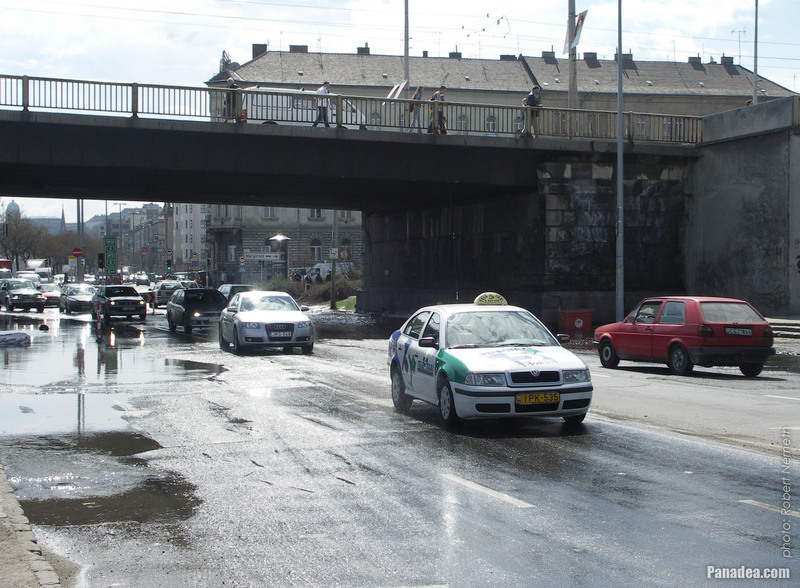 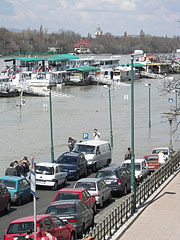 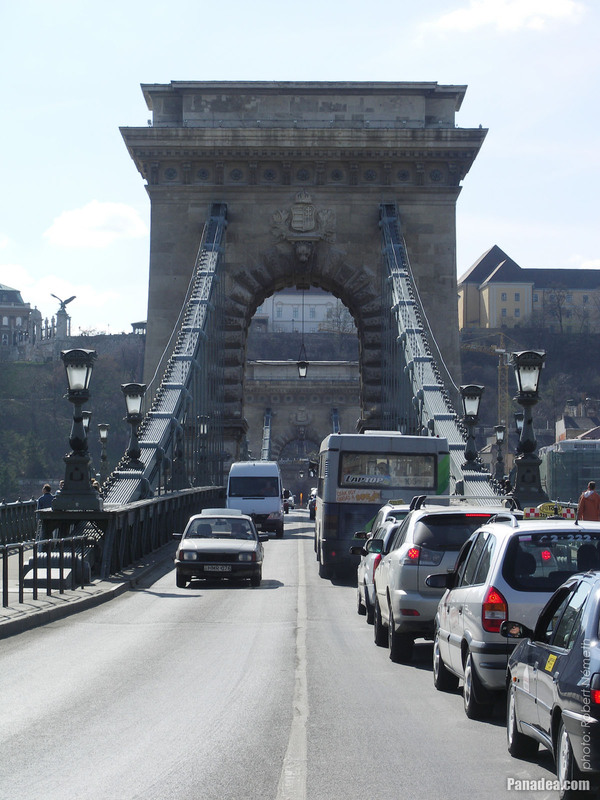 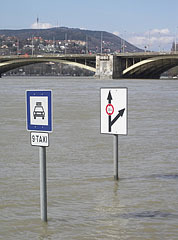 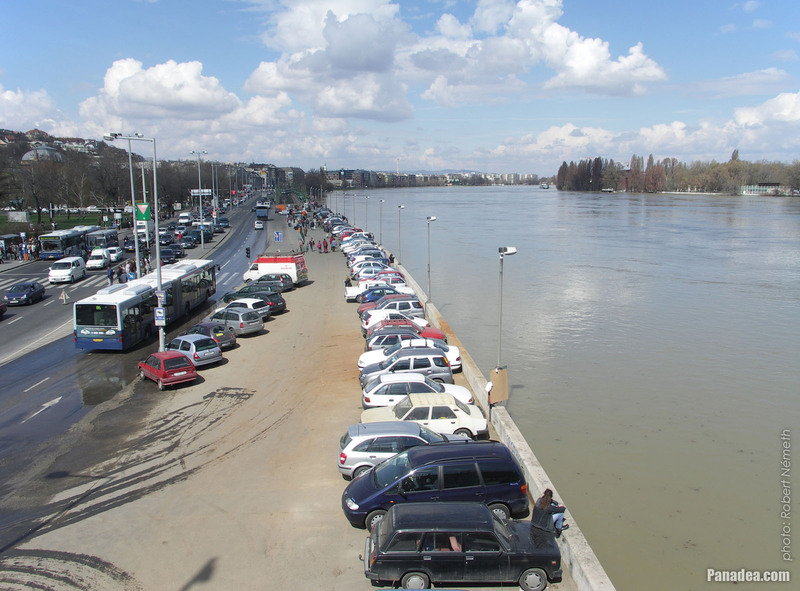 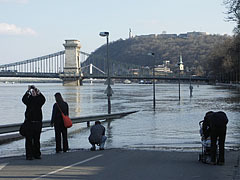 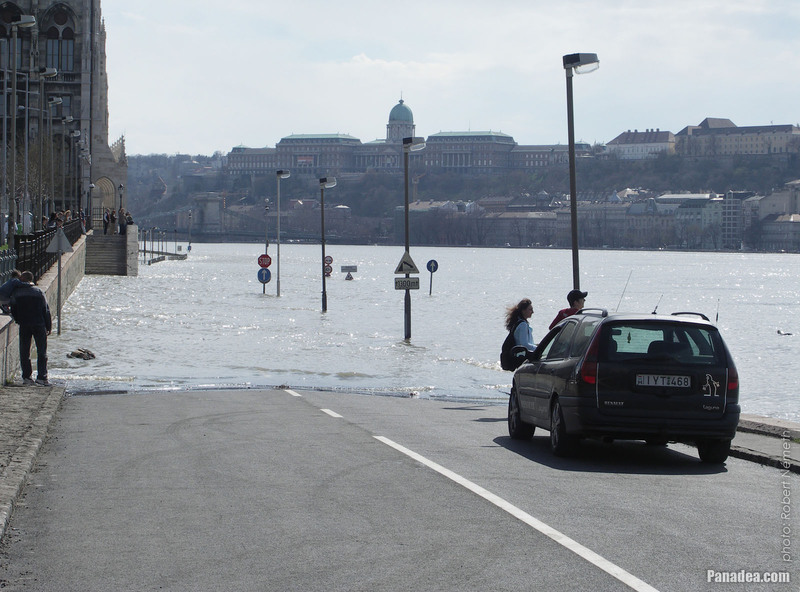 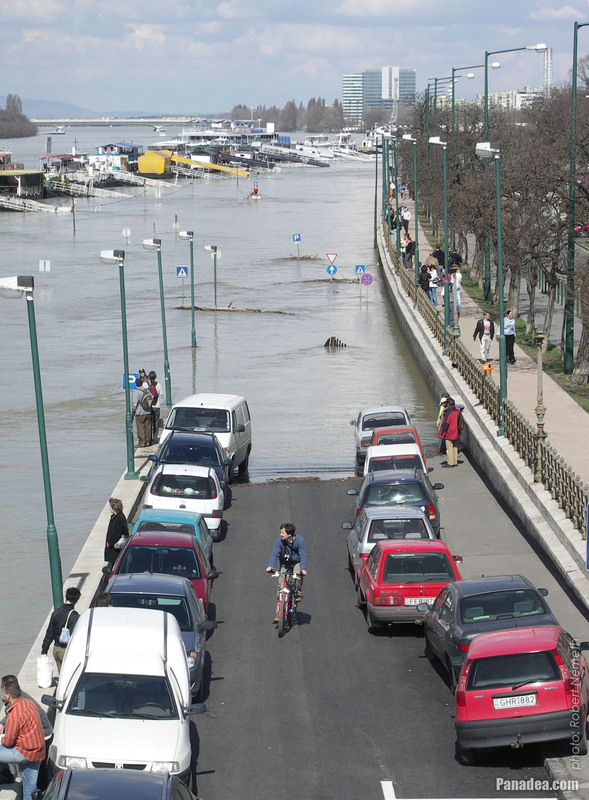 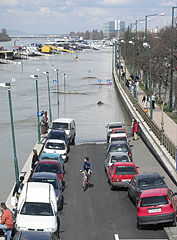 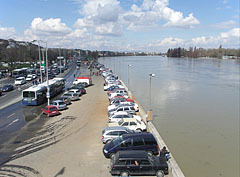 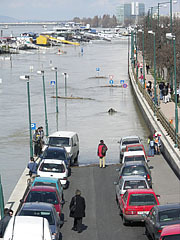 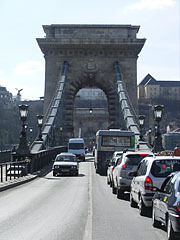 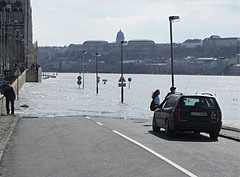 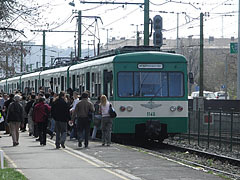 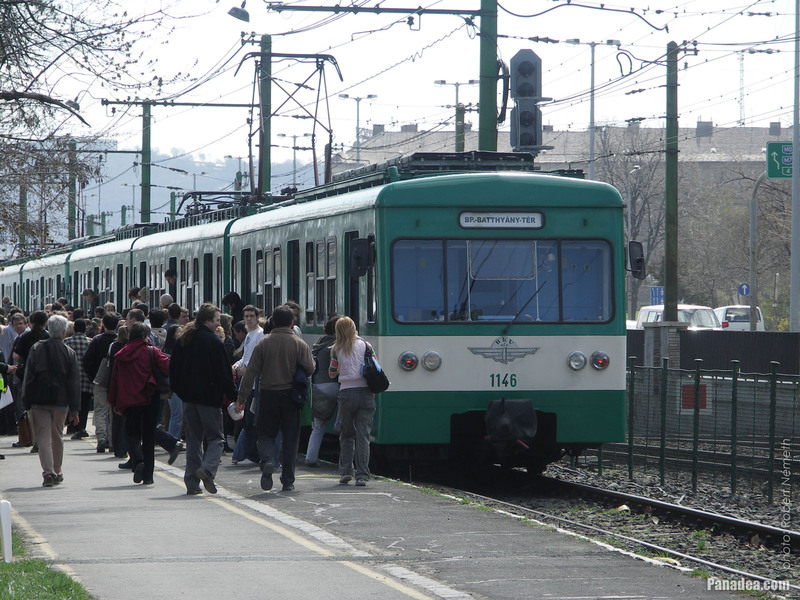 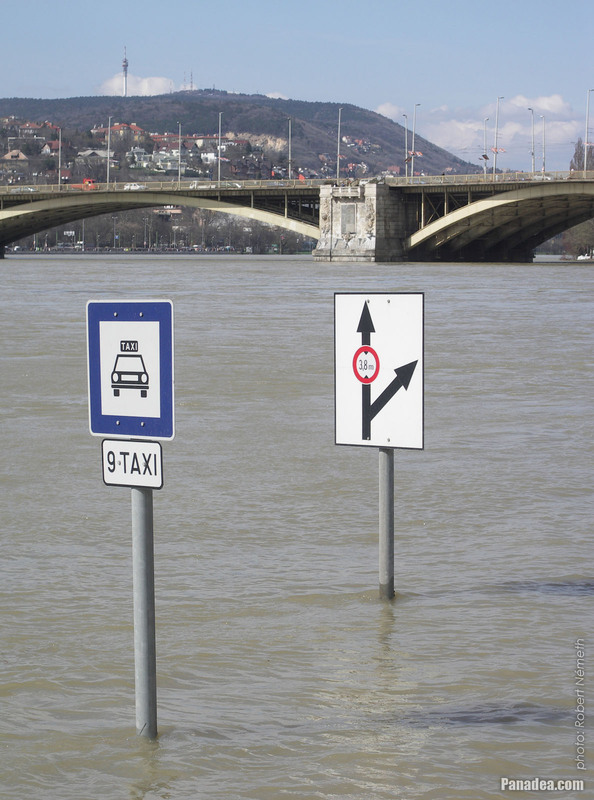 After more renovations the model was finally withdrawn from the Budapest traffic in 2007. However, sometimes it still can be seen on the streets of Budapest as a nostalgia tram, or when the Christmas season approaches as the so-called "Light Tram" (in Hungarian "Fényvillamos", this one is illuminated with many tiny lamps).